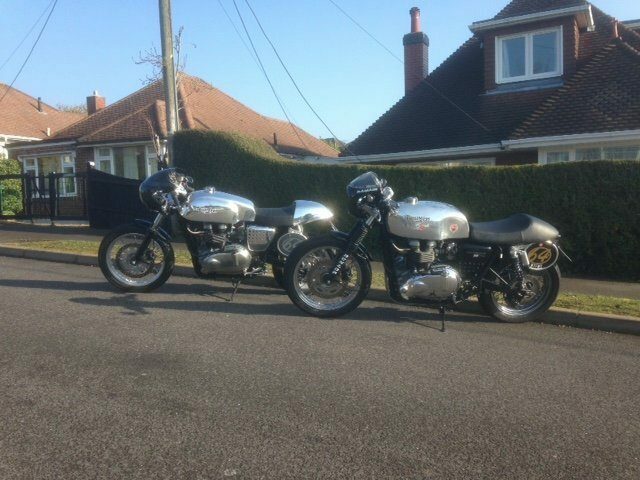 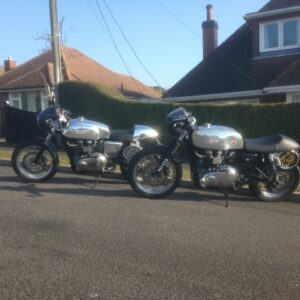 Slippery and 5 Gallon Manx tanks on this beautiful pair of Hinckley Triumphs – iconic modern classics! 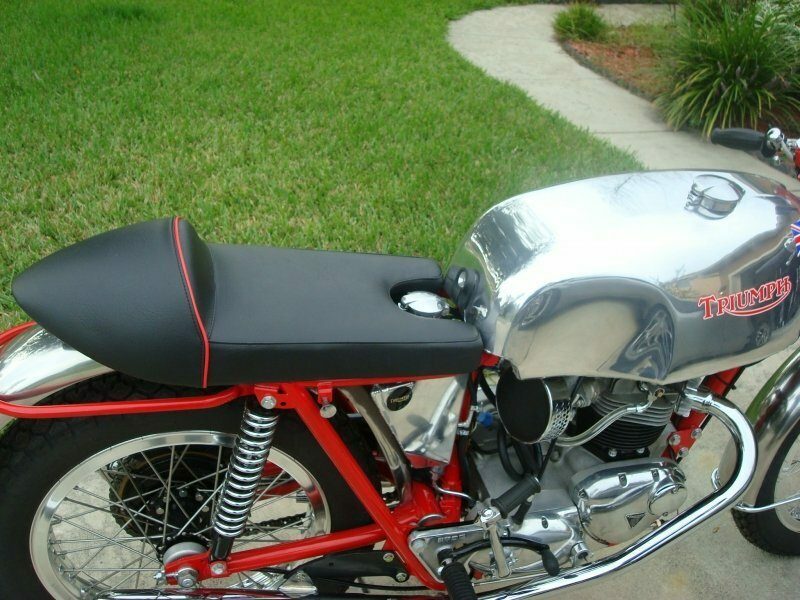 5 Gallon Manx on a modern Thrux – and also our seat cowl. 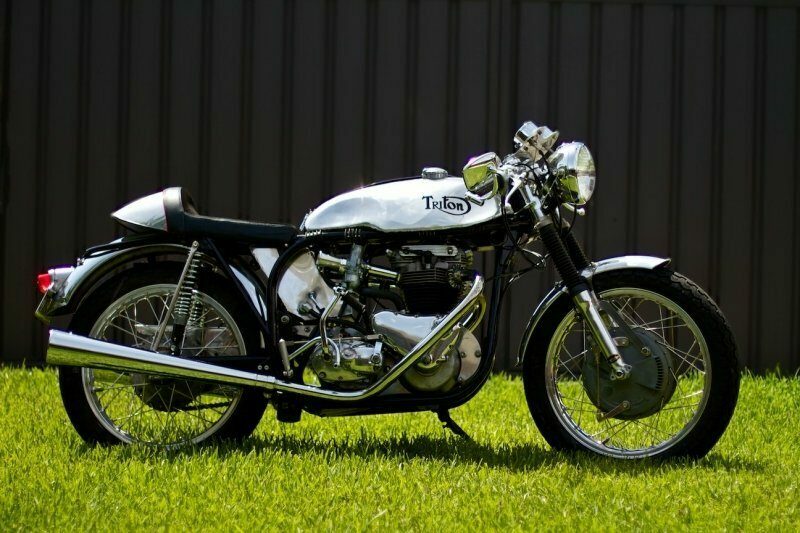 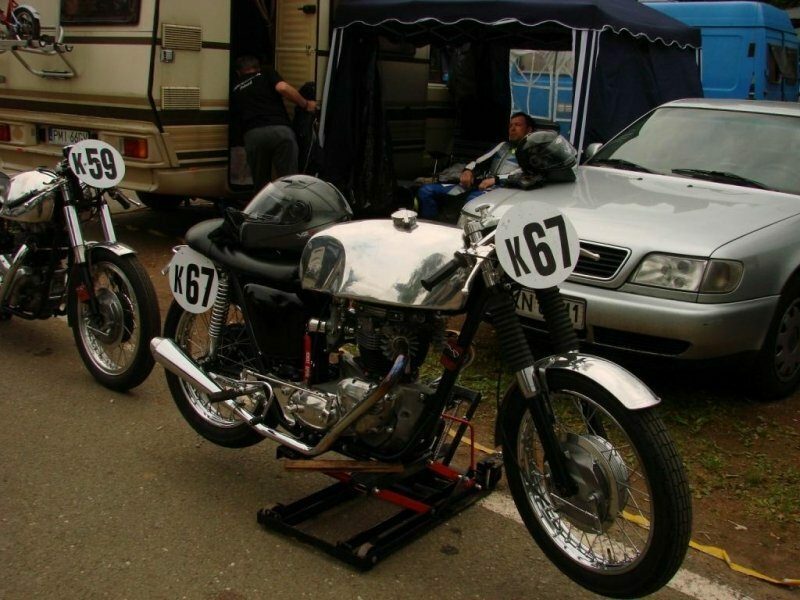 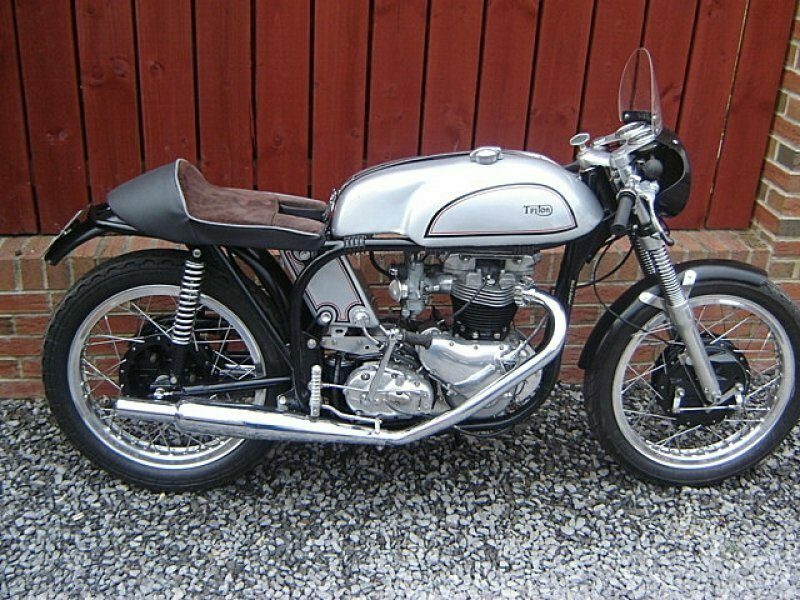 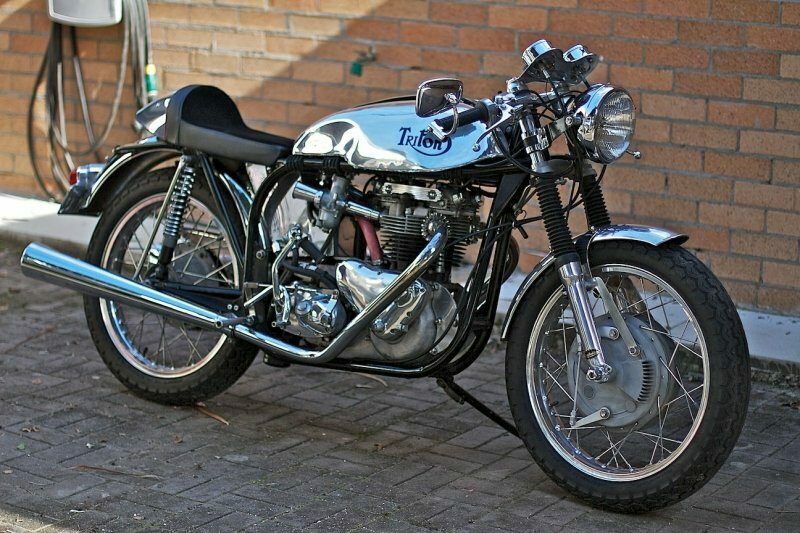 The iconic Slippery Sam tank on this Hinckley Triumph. 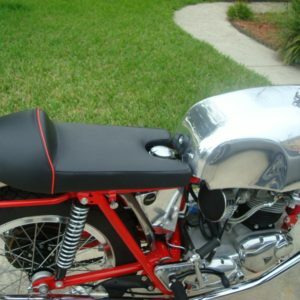 We also fabricated this seat. 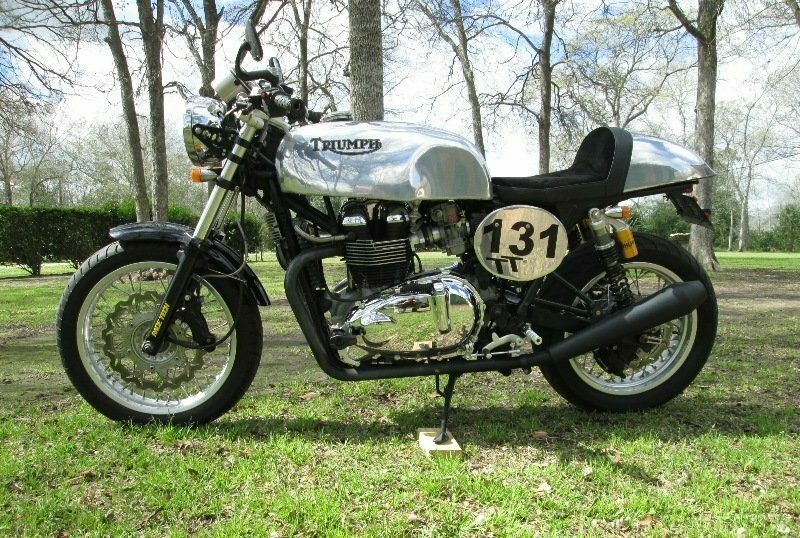 Looking great in the Texas sunshine. 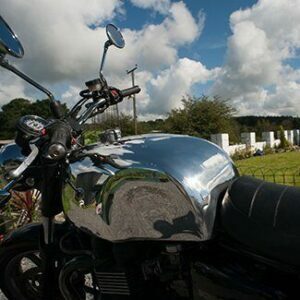 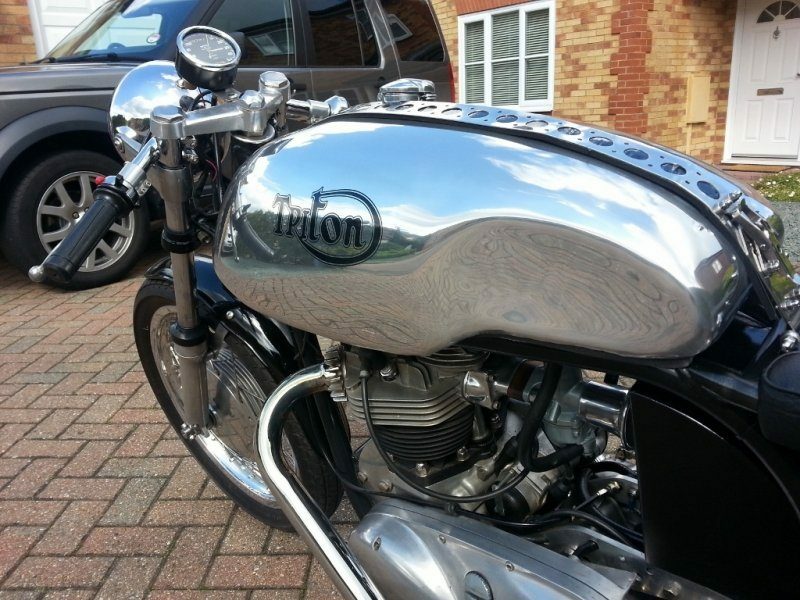 “Lyta” style sprint tank on Hinckley thruxton – looking gorgeous with that background framing it! 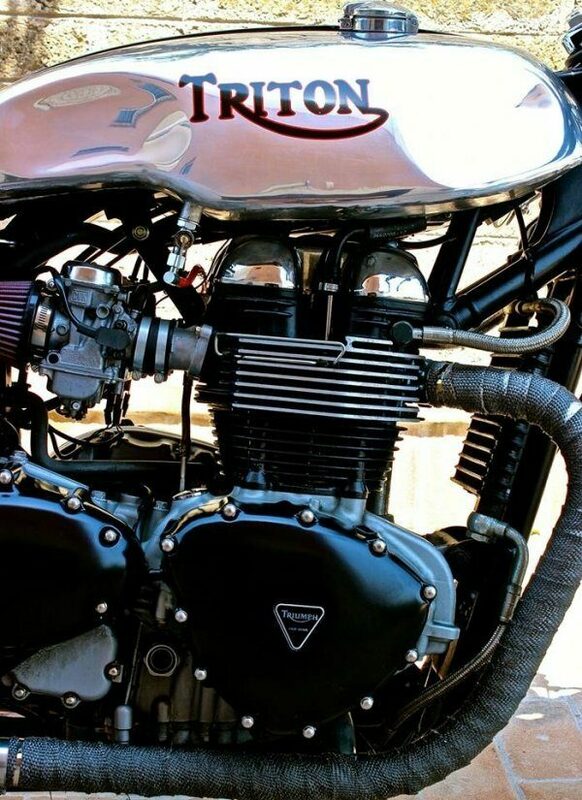 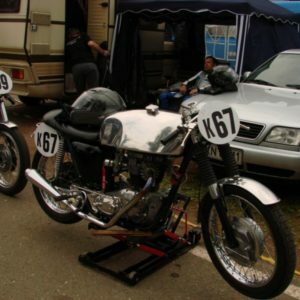 5 Gallon Manx on the EFI version of the Hinckley Bonneville – the strap is just for decoration. 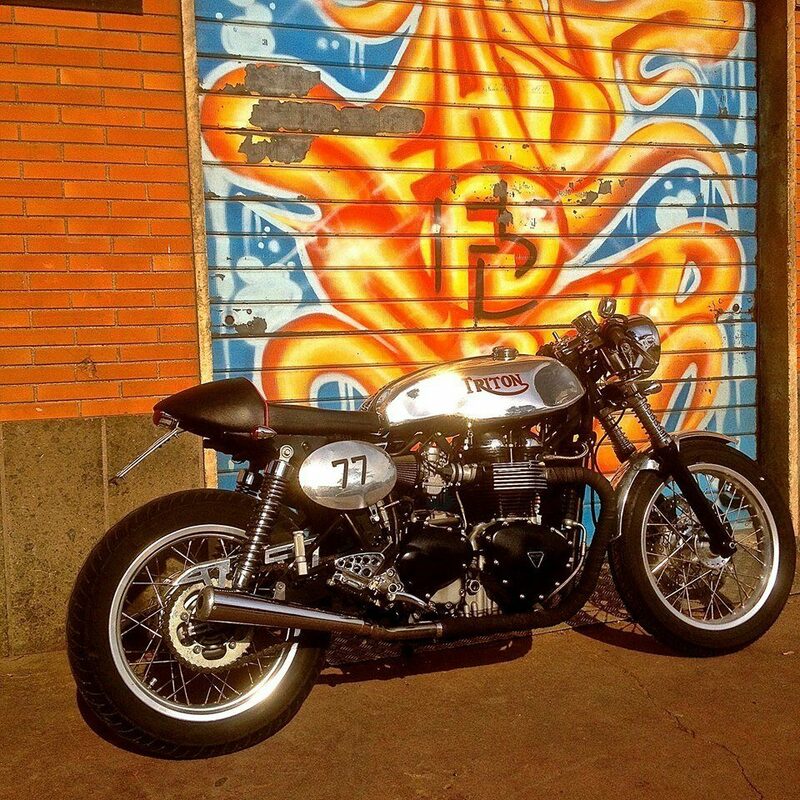 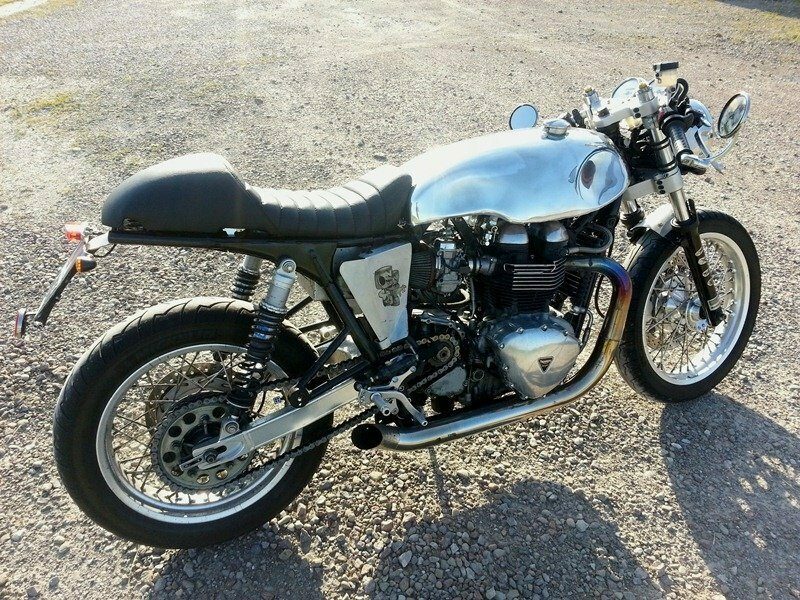 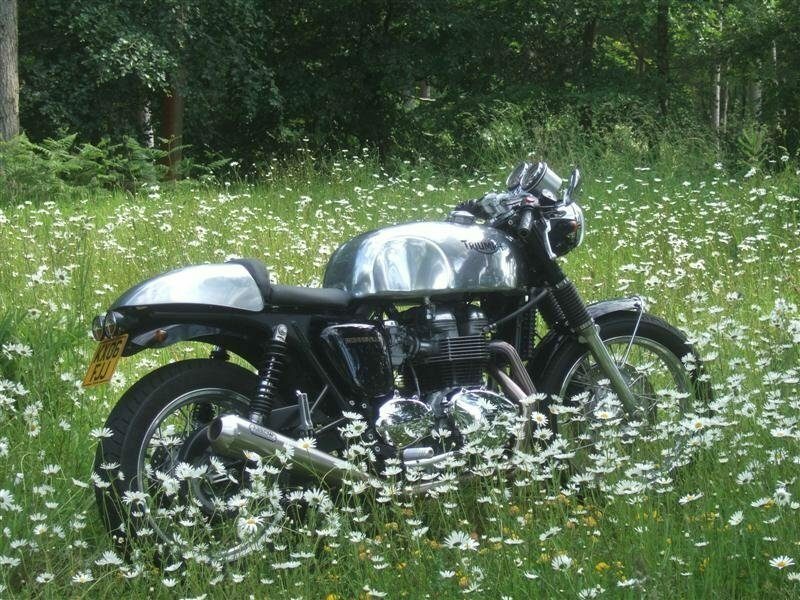 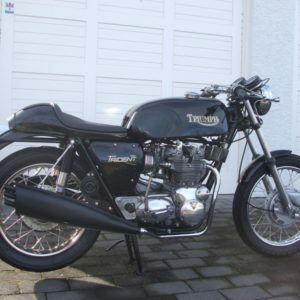 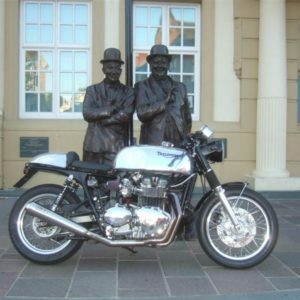 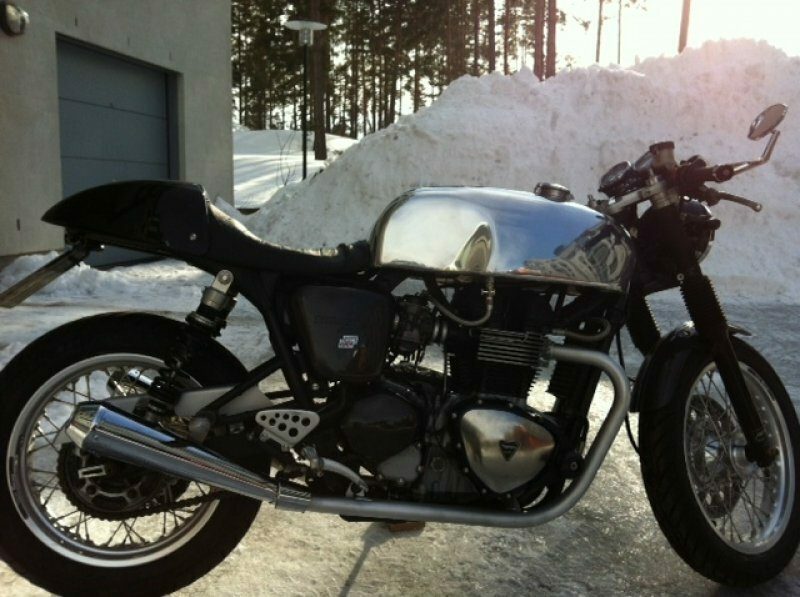 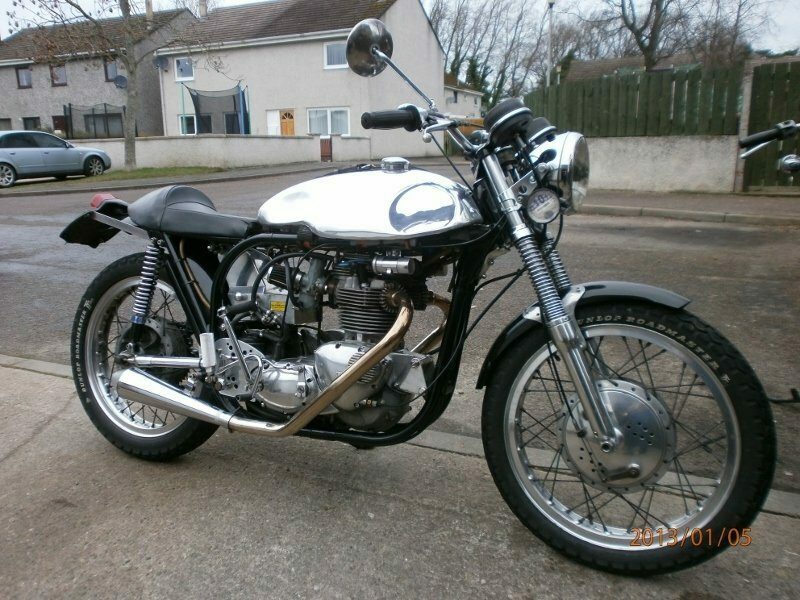 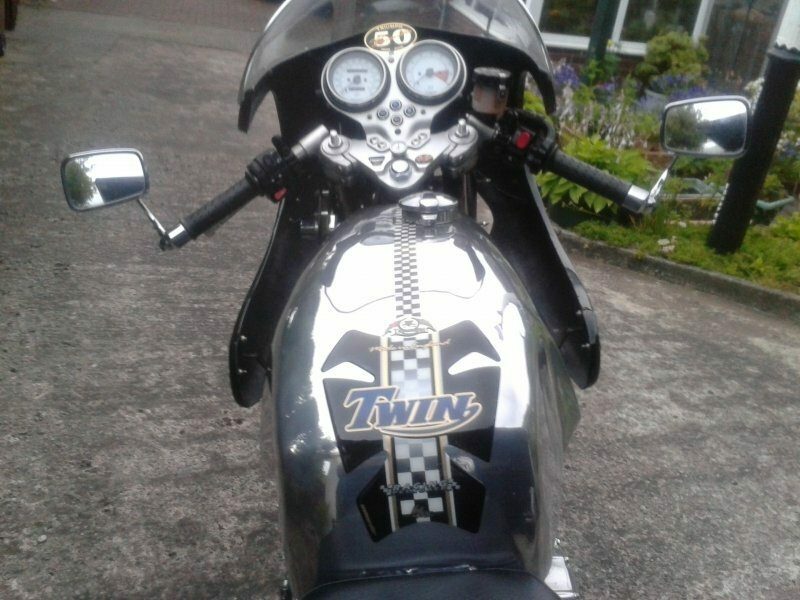 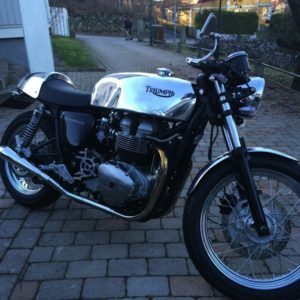 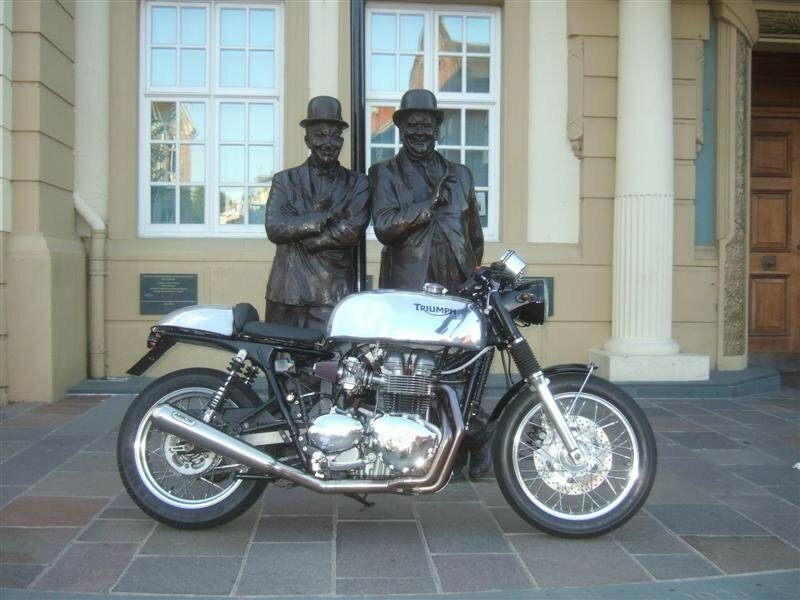 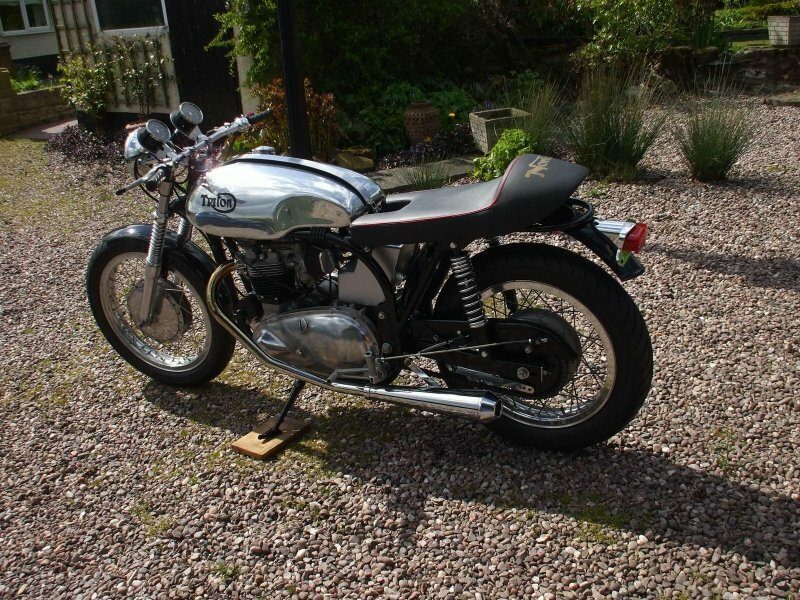 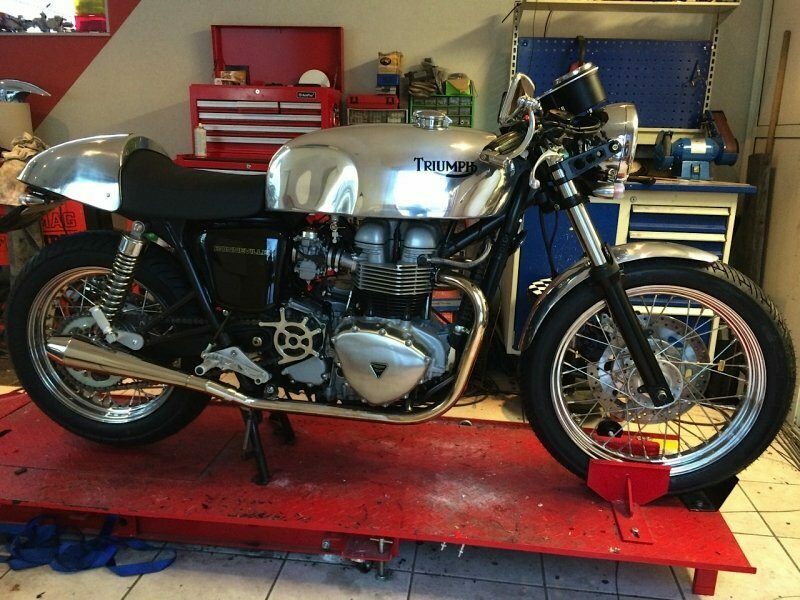 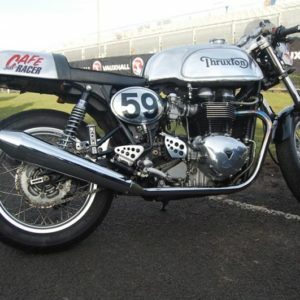 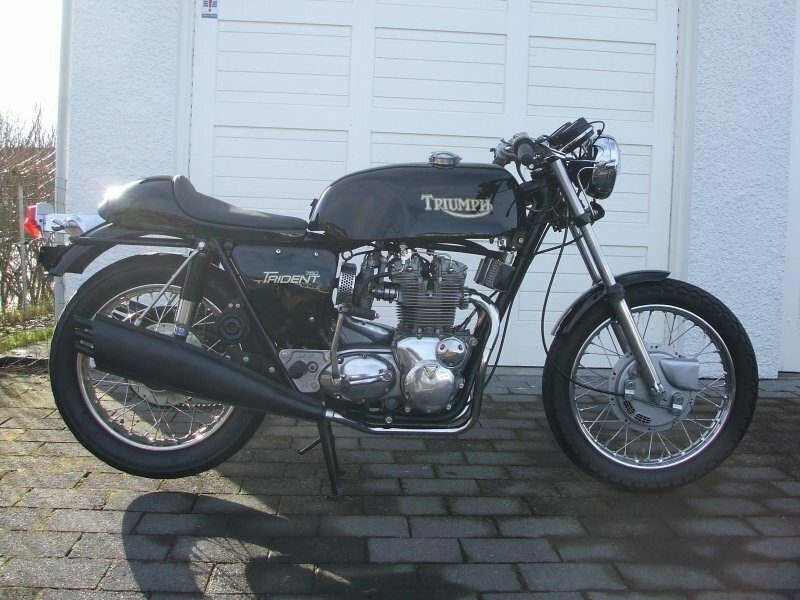 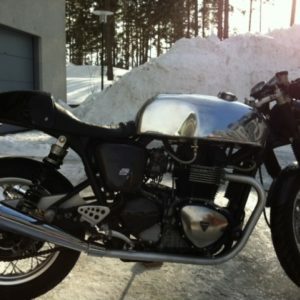 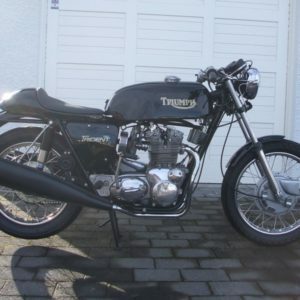 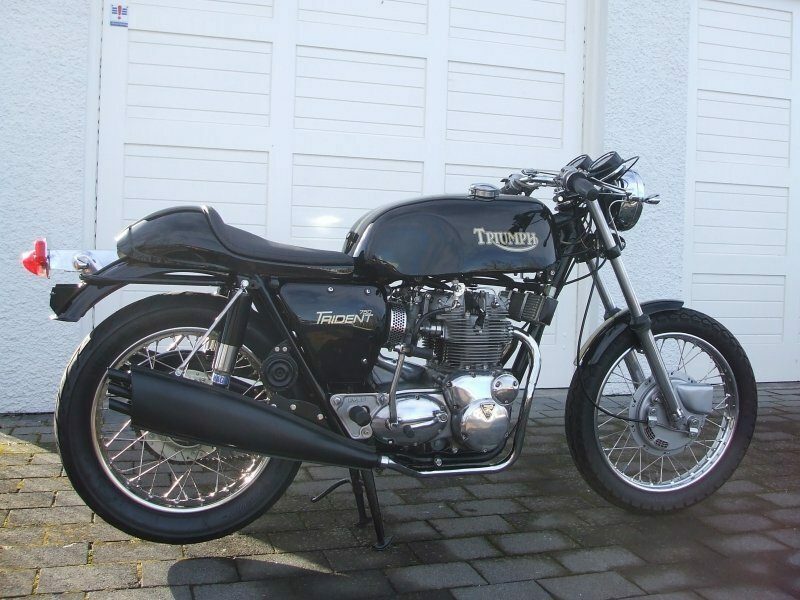 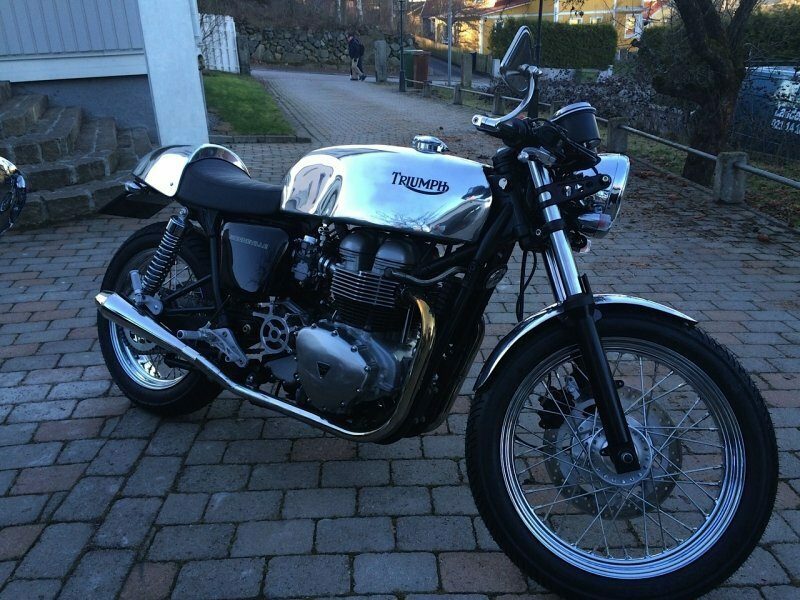 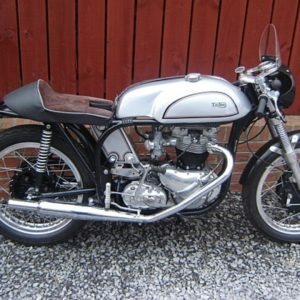 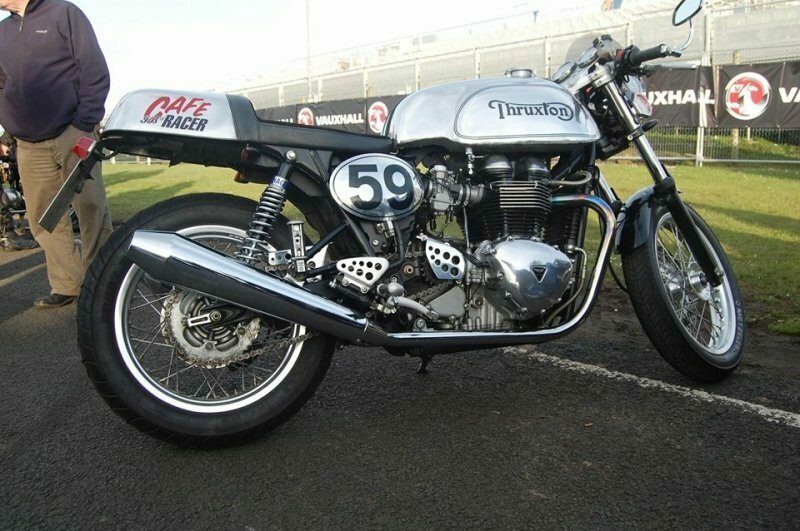 This lovely Triumph Cafe racer hailes from Iceland and is a real credit to its owner. 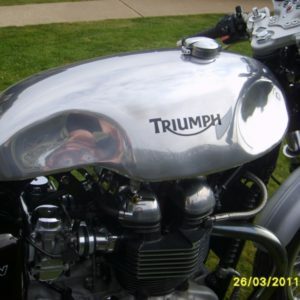 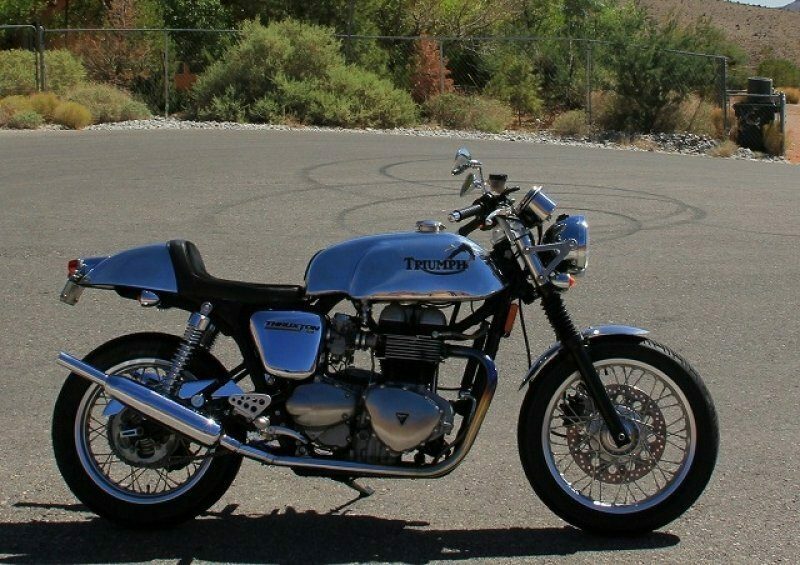 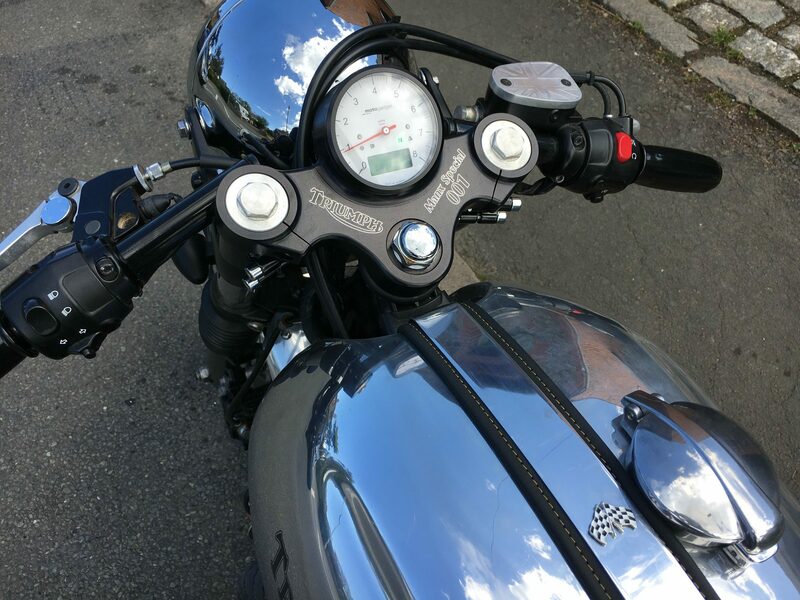 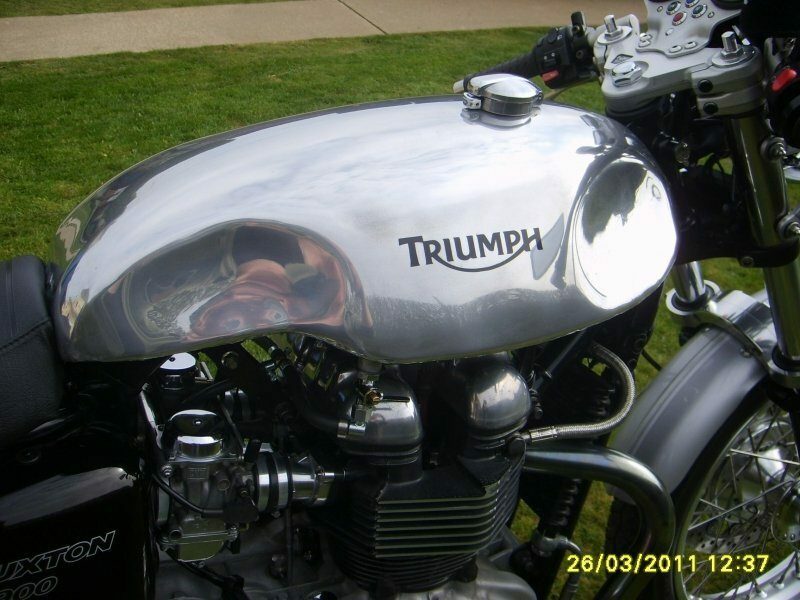 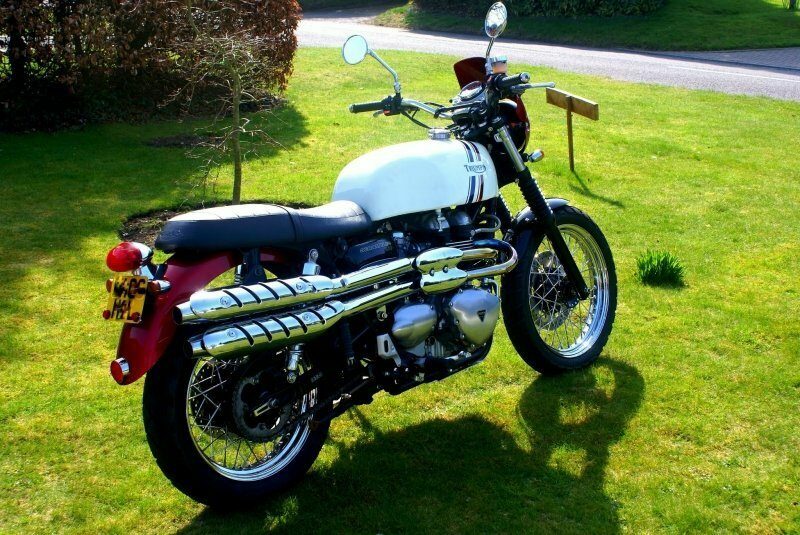 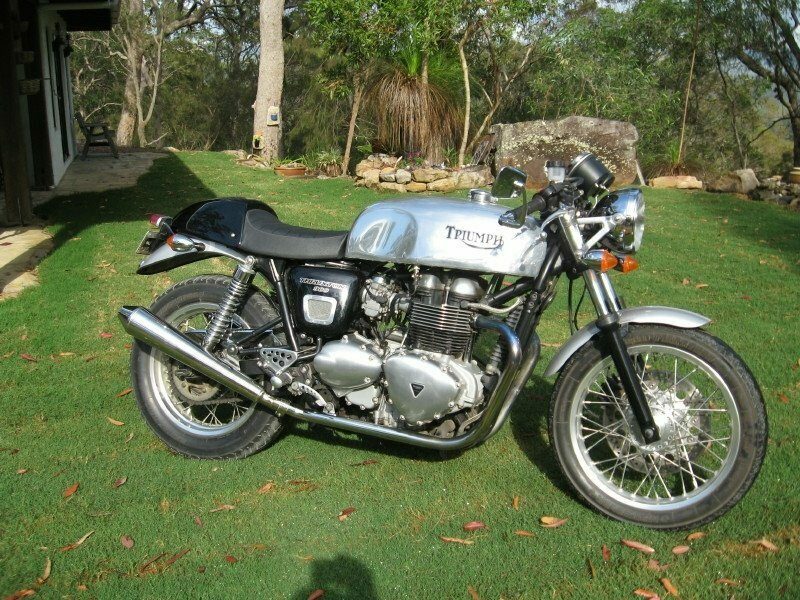 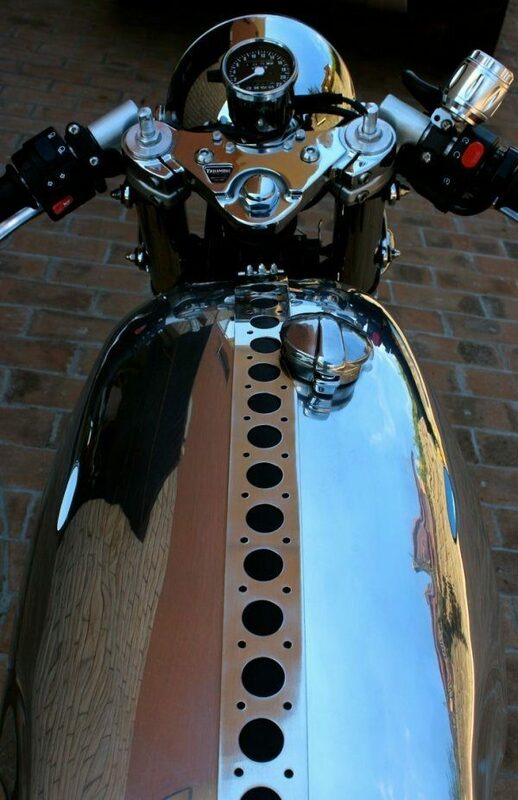 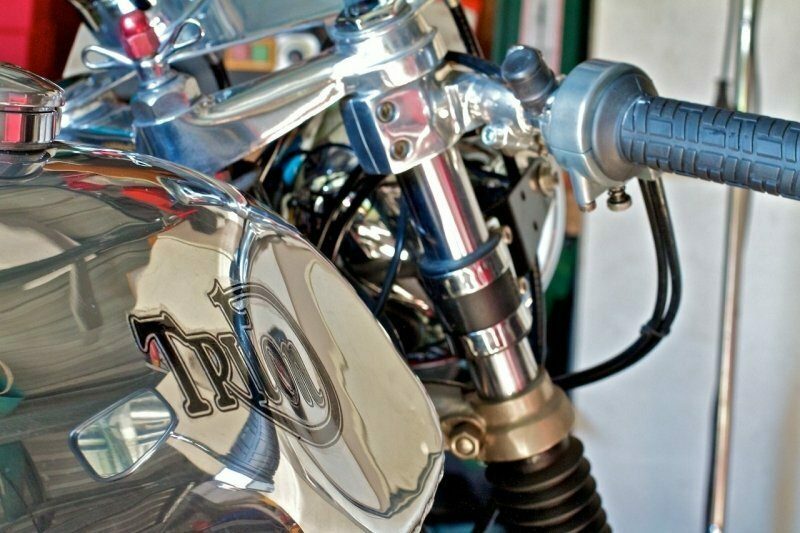 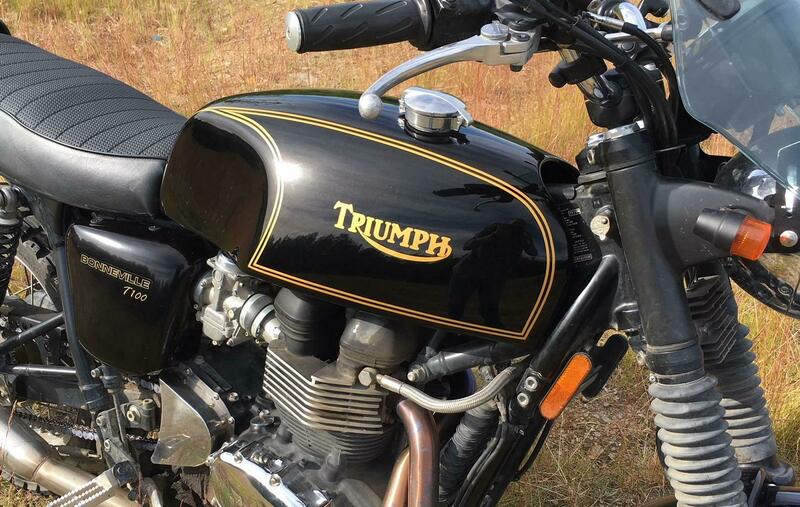 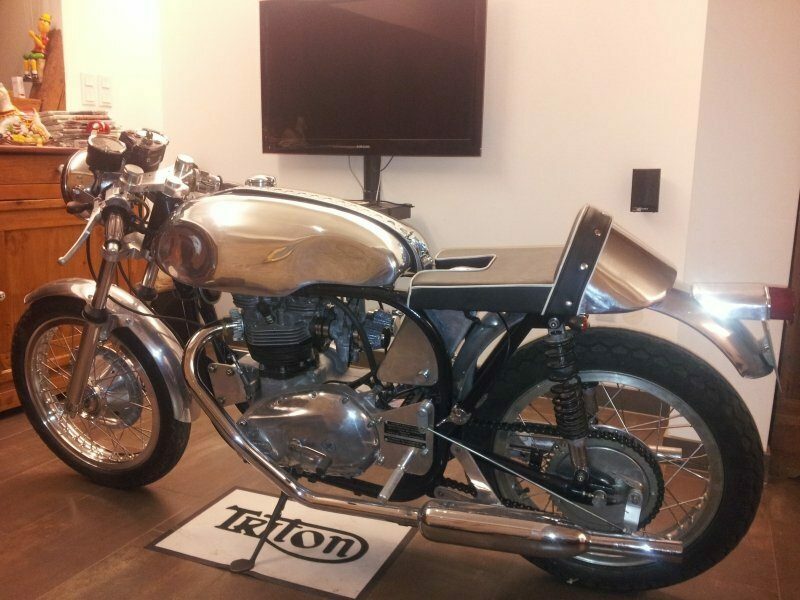 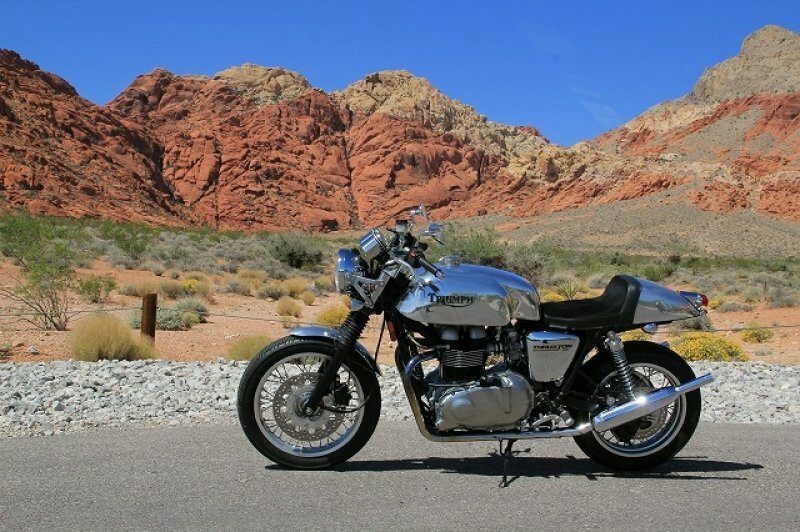 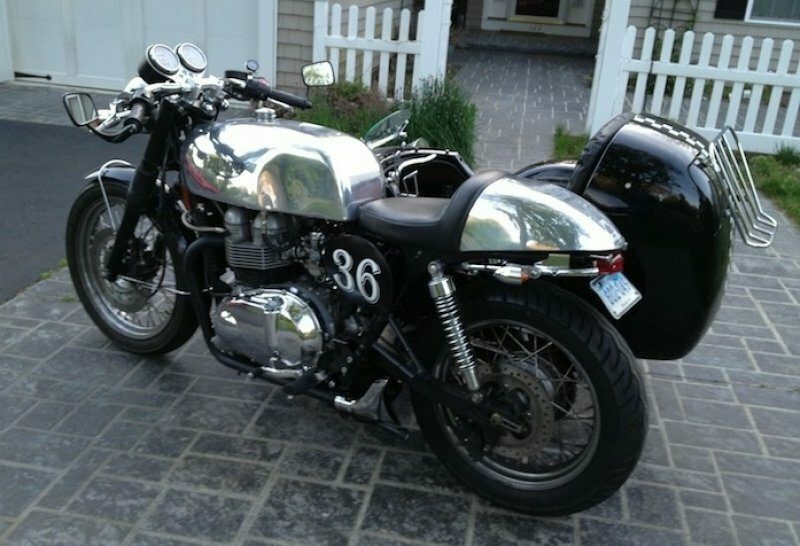 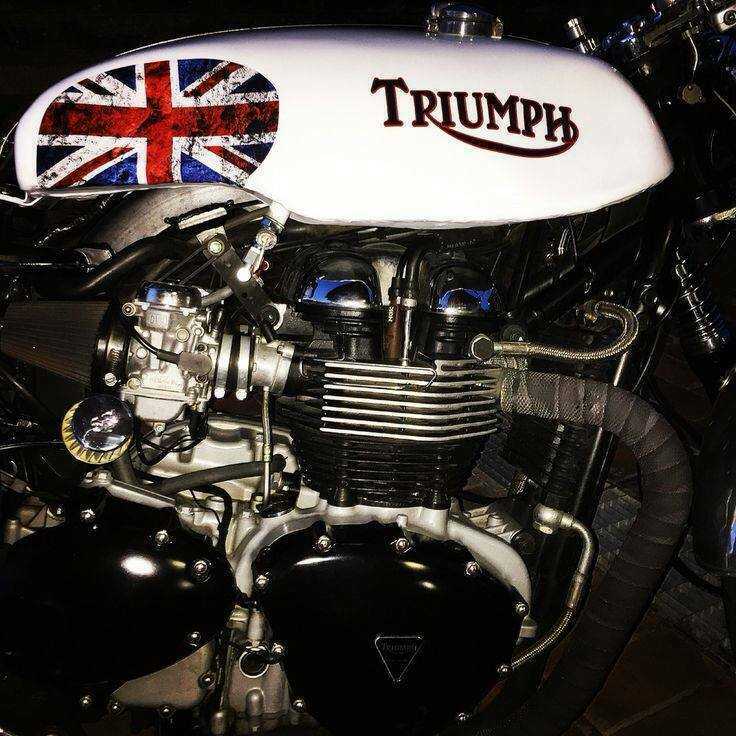 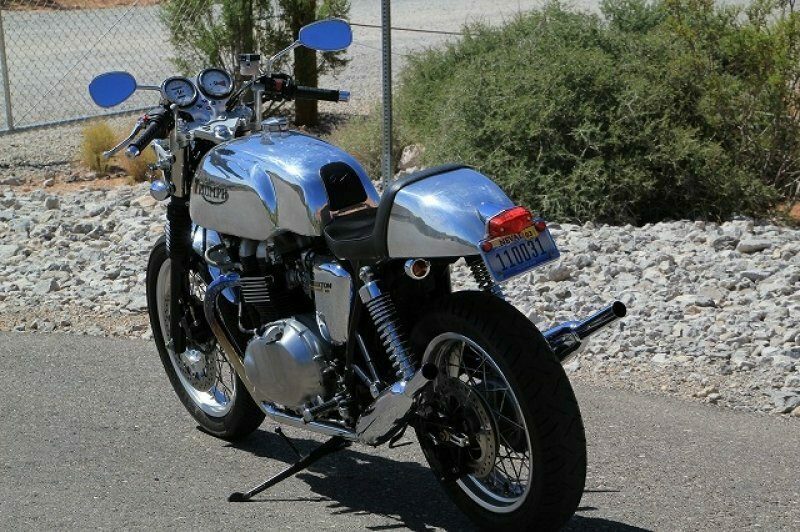 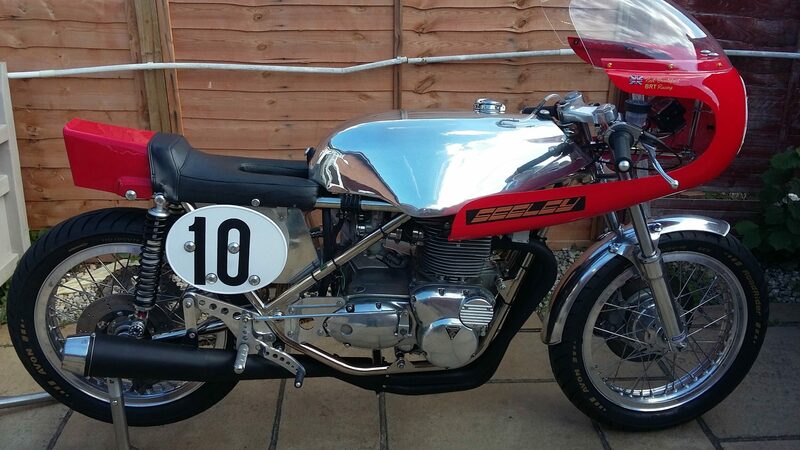 The polished alloy cowl compliments the tank perfectly on this Triumph. 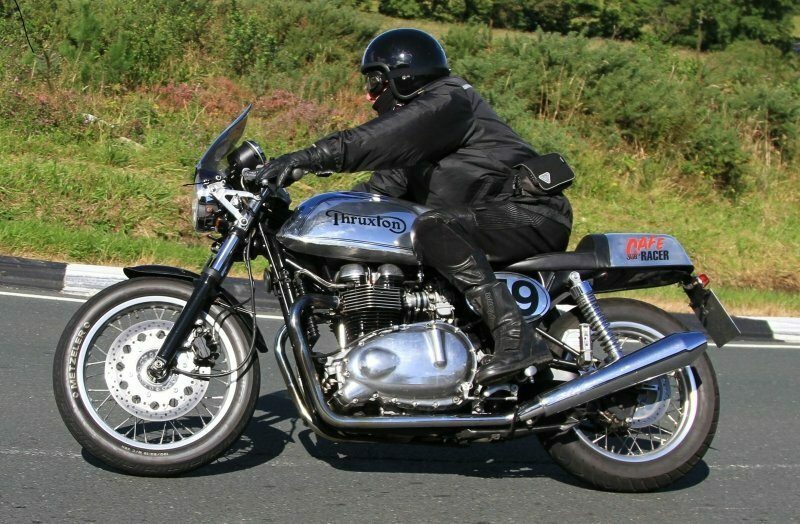 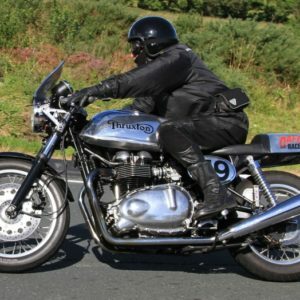 Another Slippery Sam on a Hinkley Triumph Thruxton, note the use of a tank strap. 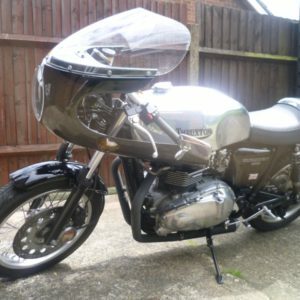 Looking for something very different? 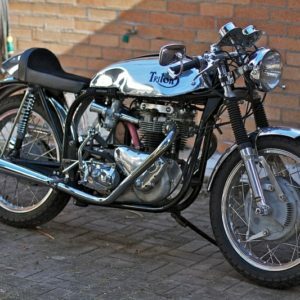 How about a Vellocette tank on a Triumph T100 Bonnie? 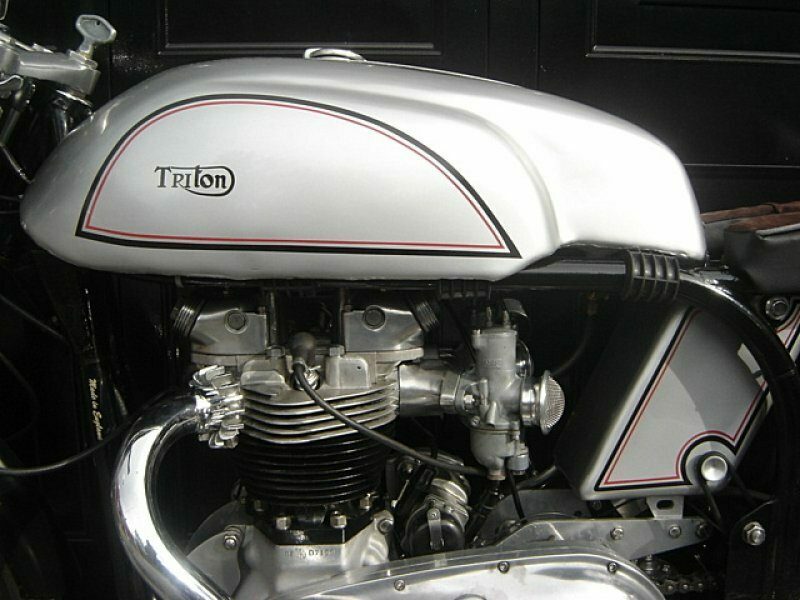 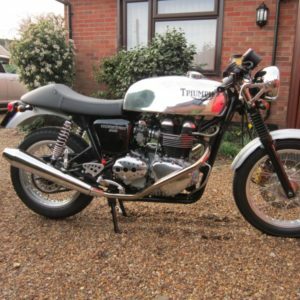 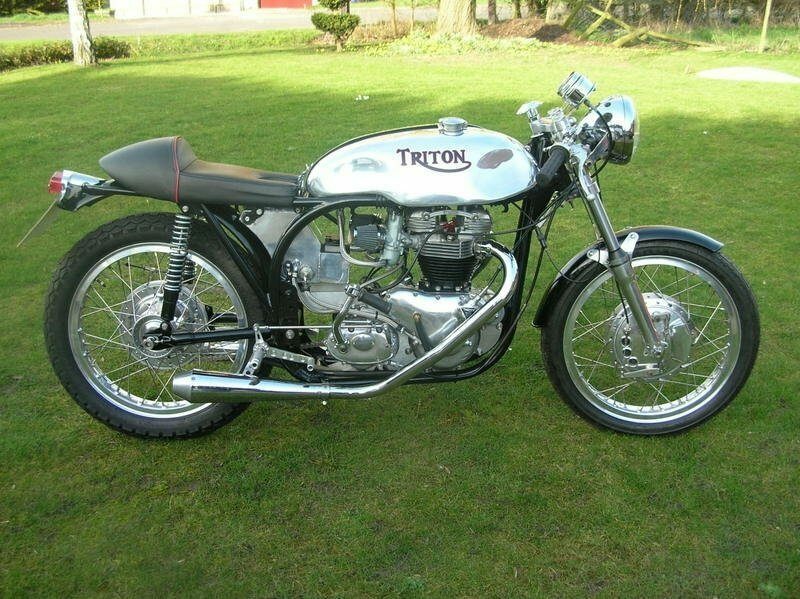 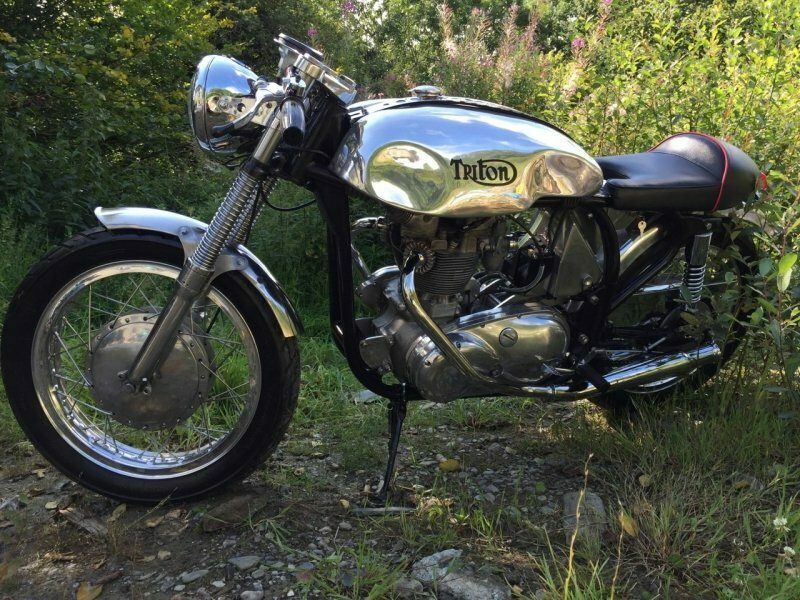 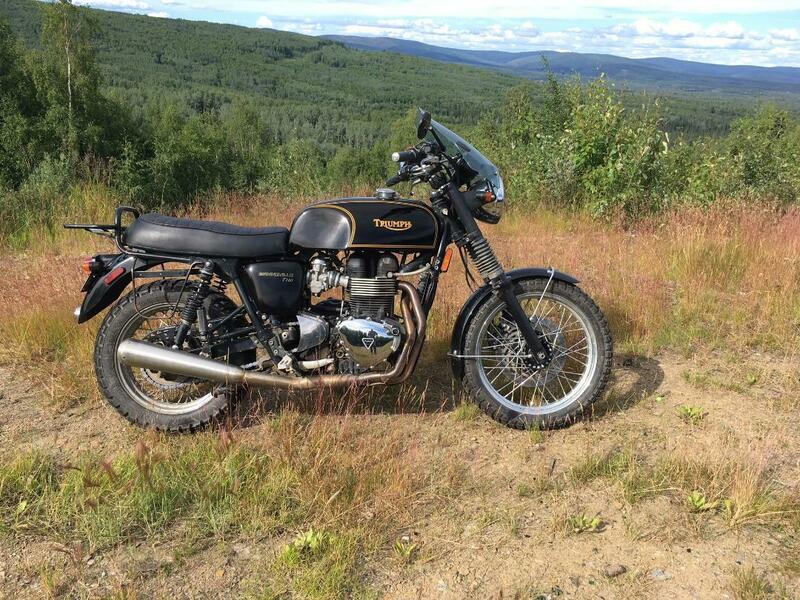 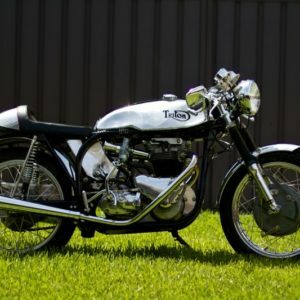 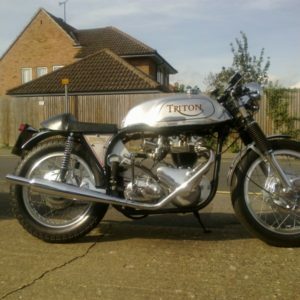 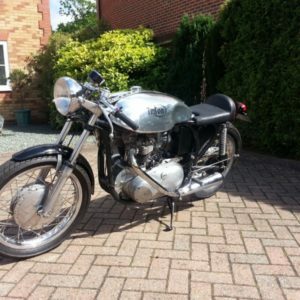 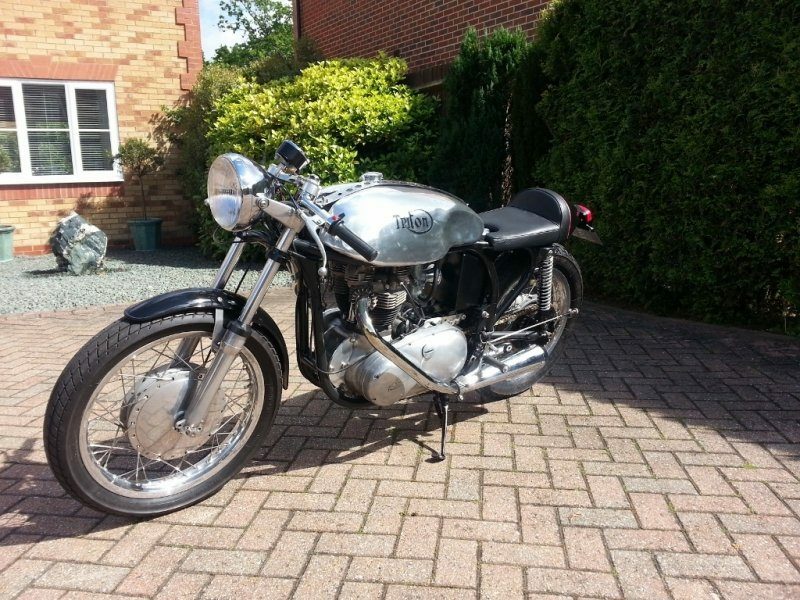 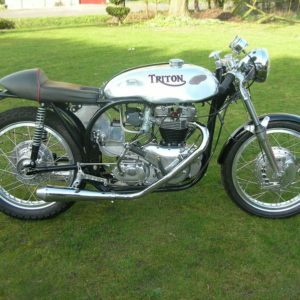 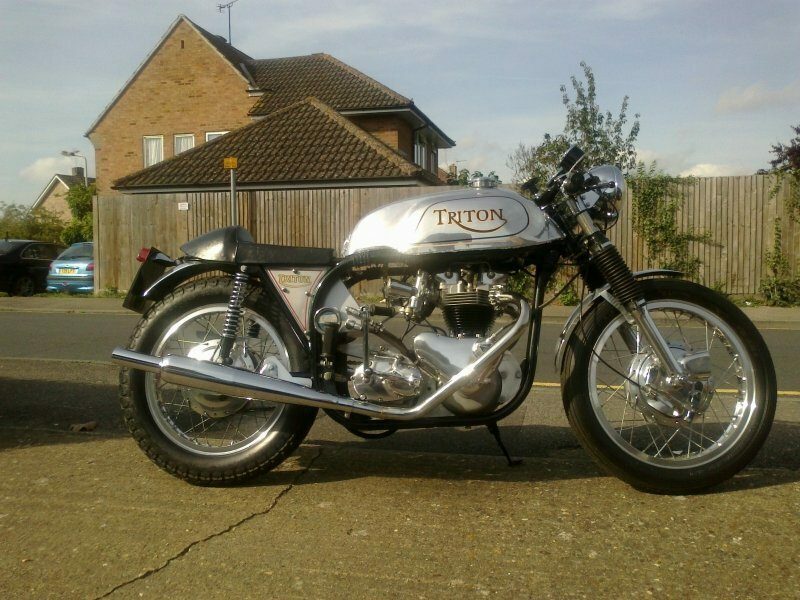 Sprint on a Triumph Thrux – a modern classic! 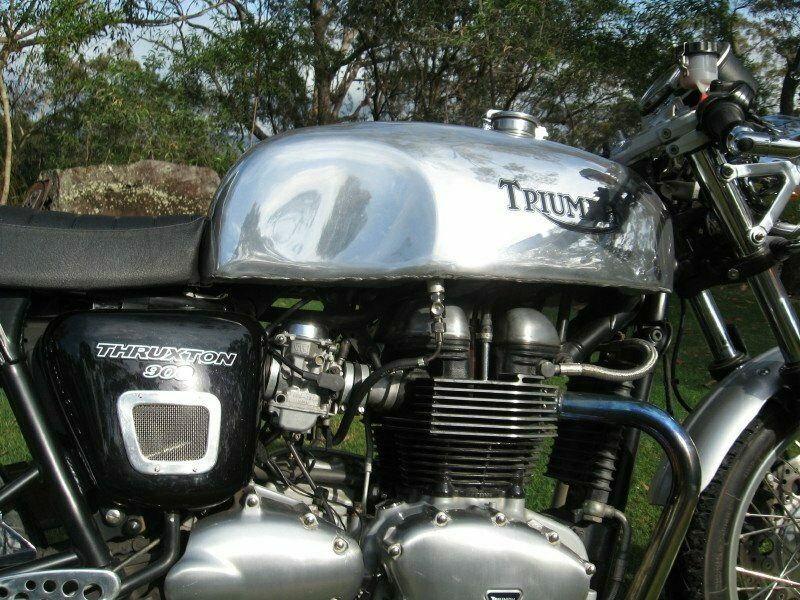 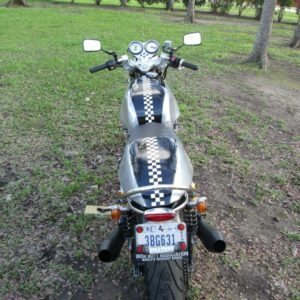 This tank gave the customer exactly what he was looking for – a long range tank for touring and no need to shorten the seat on their Triumph. 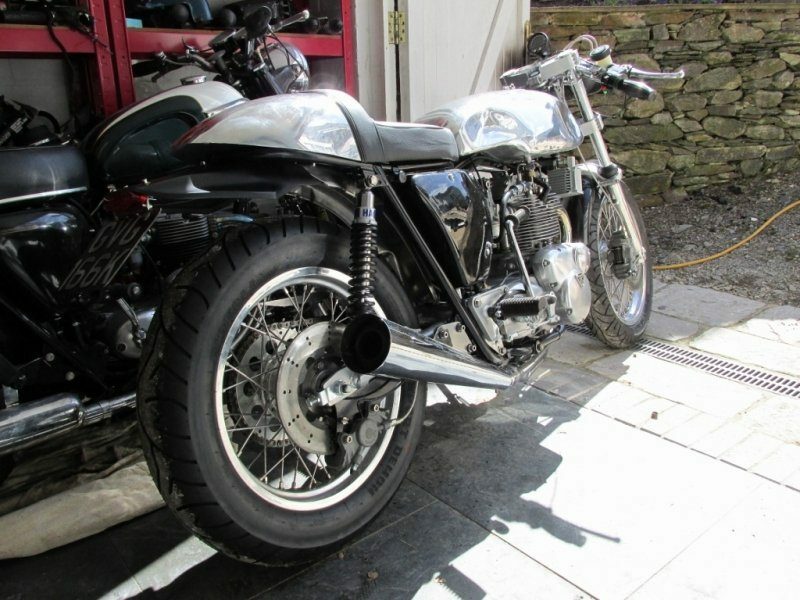 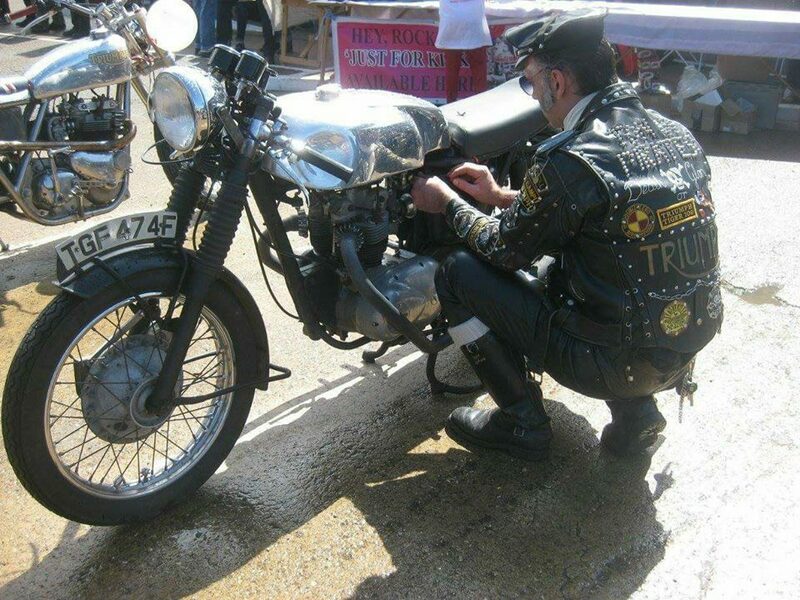 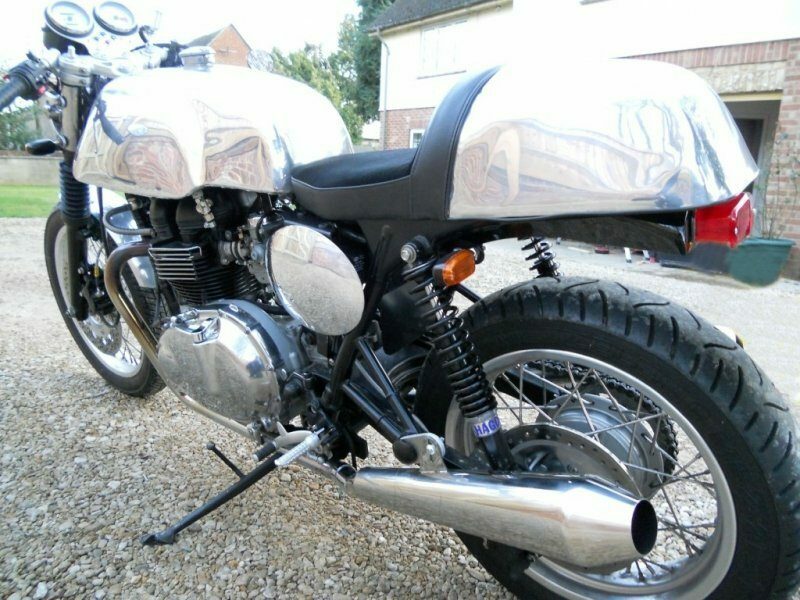 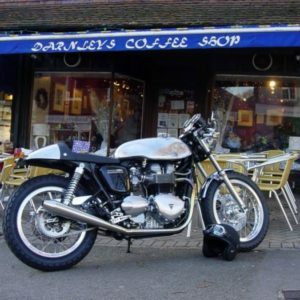 Slippery Sam tank and Cafe style seat on a Hinkley Triumph Bonneville –sweet! 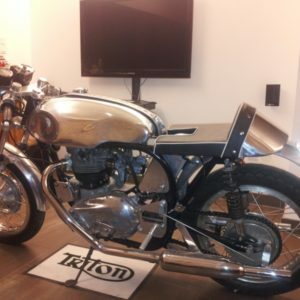 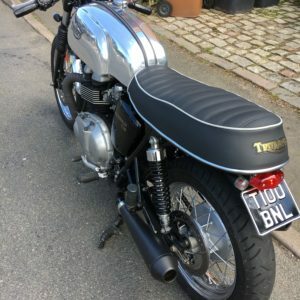 Polished alloy Triumph Thruxton seat, fully upholstered in suede. 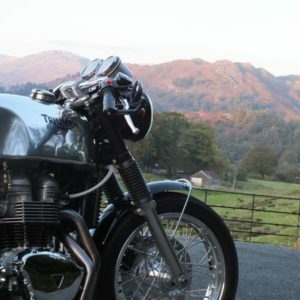 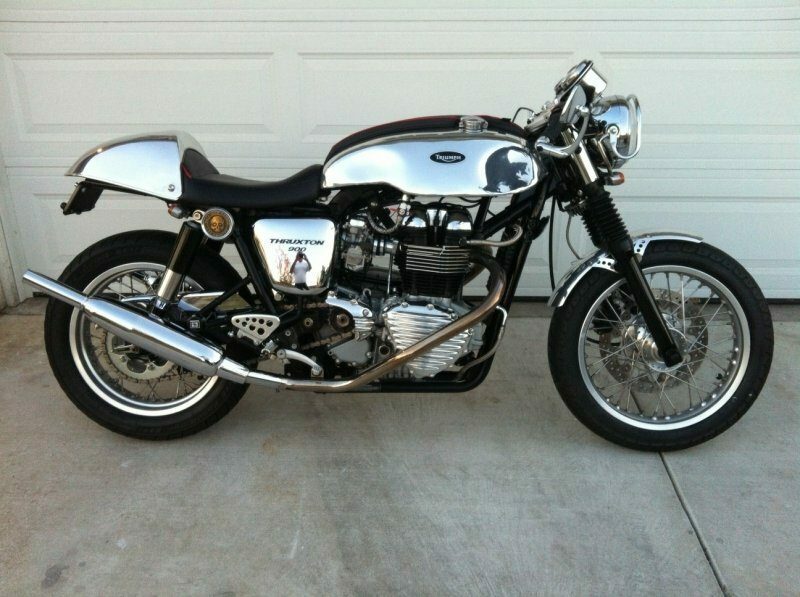 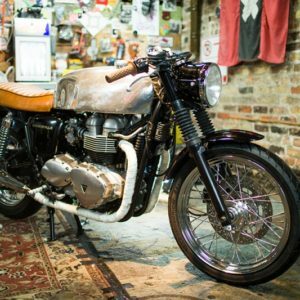 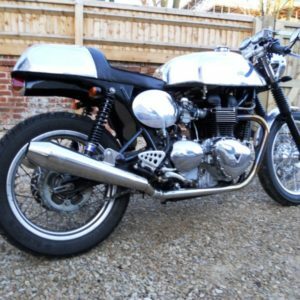 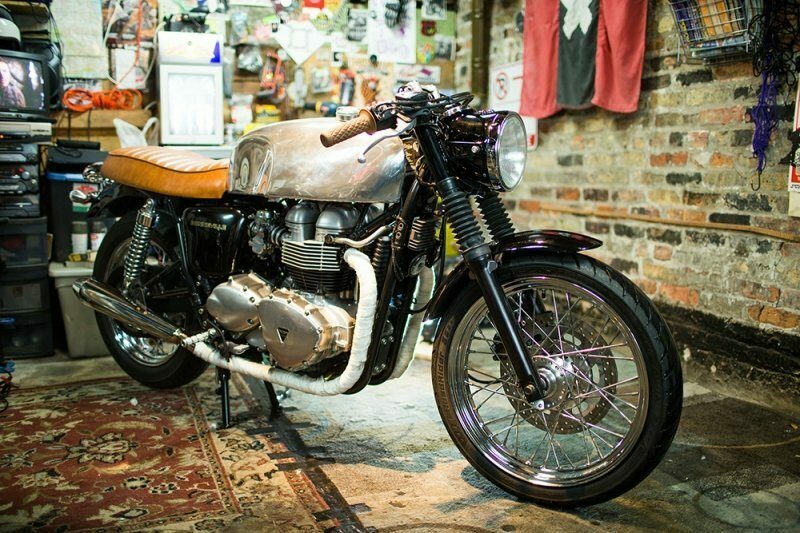 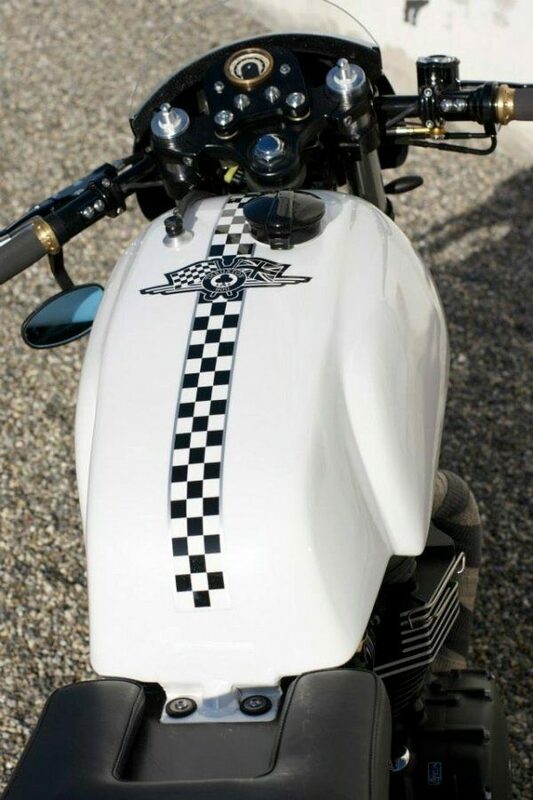 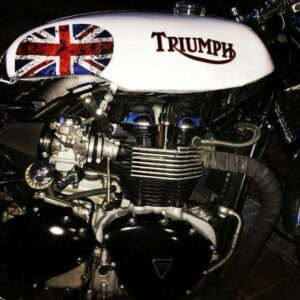 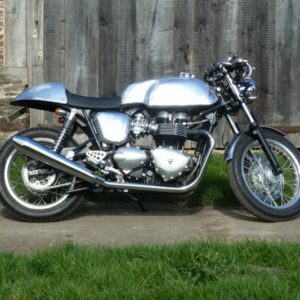 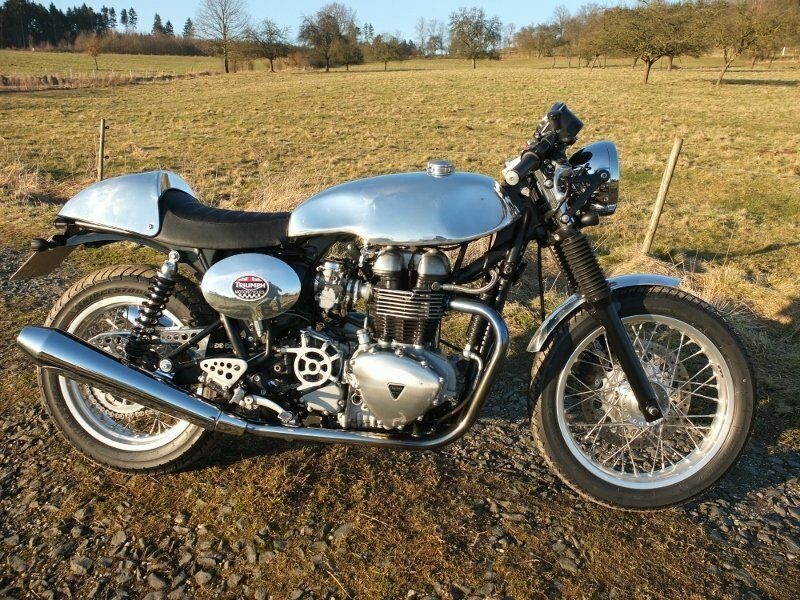 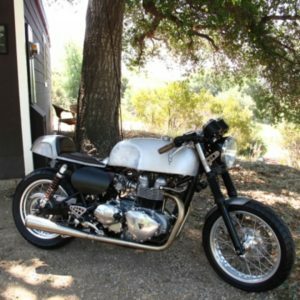 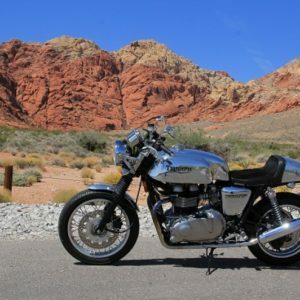 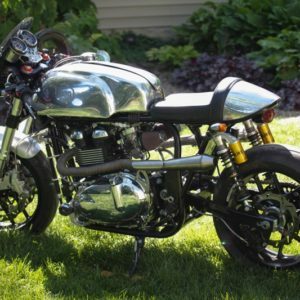 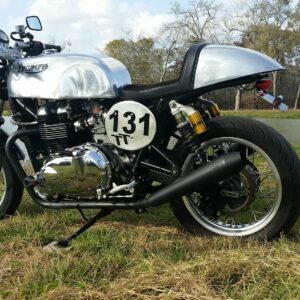 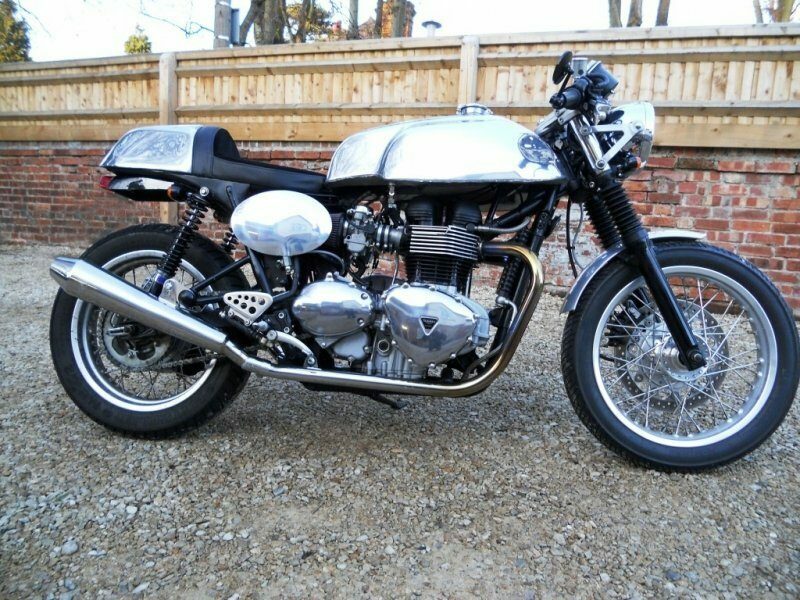 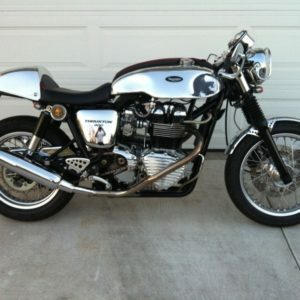 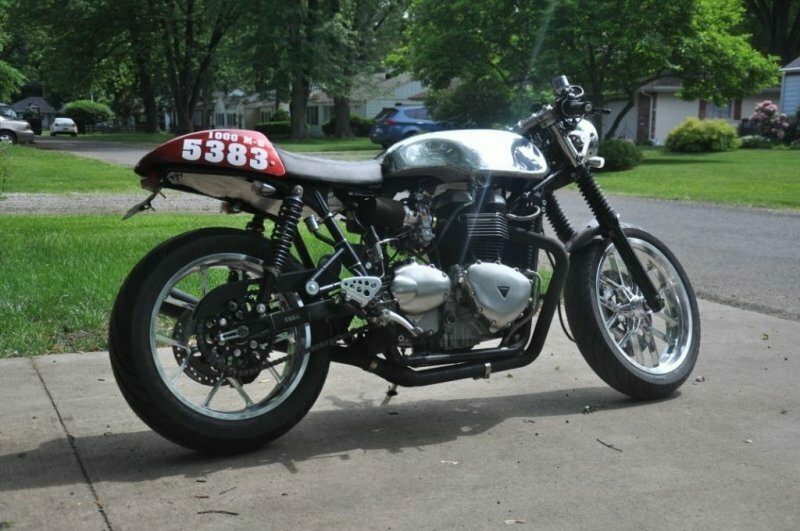 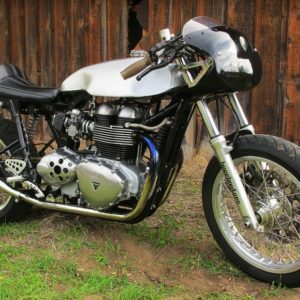 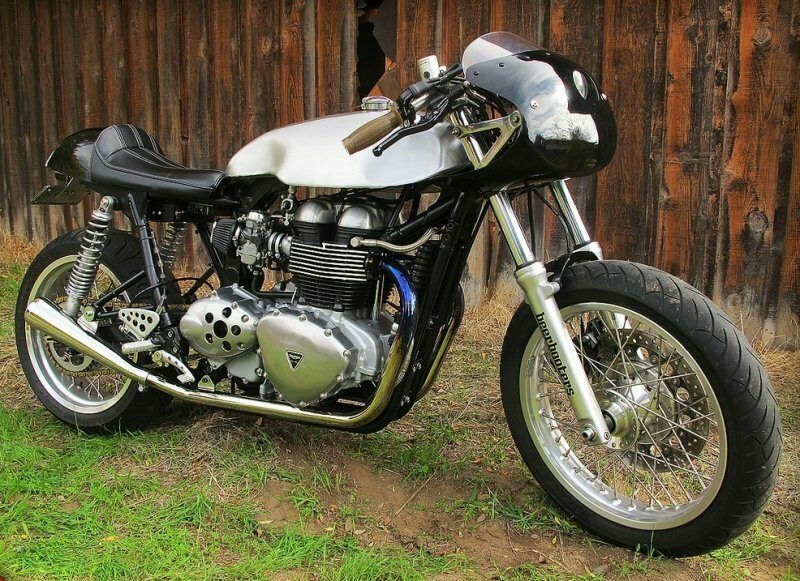 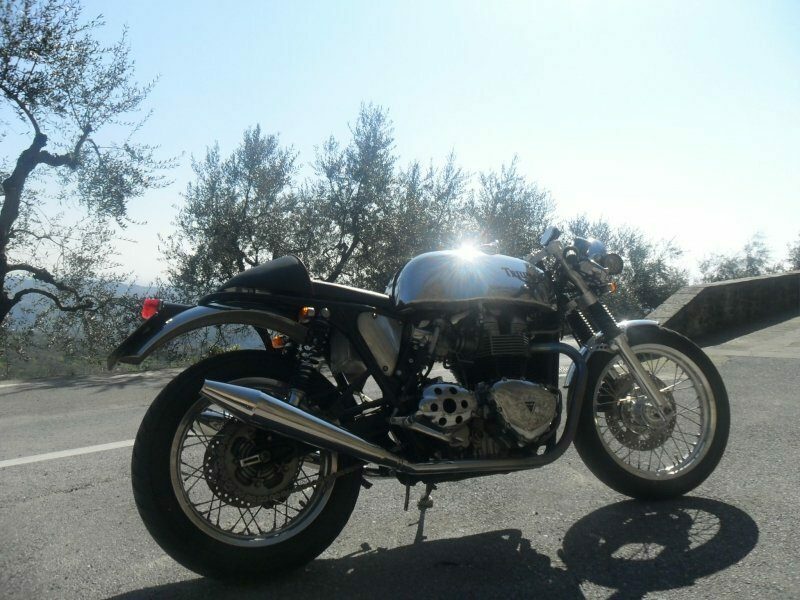 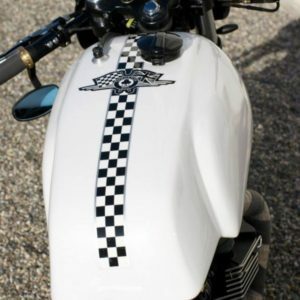 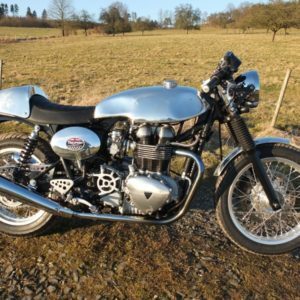 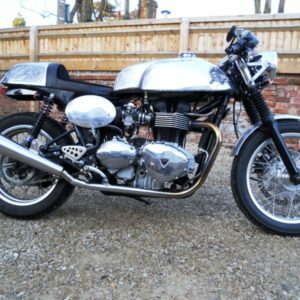 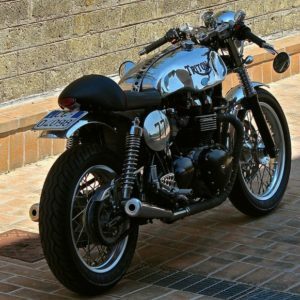 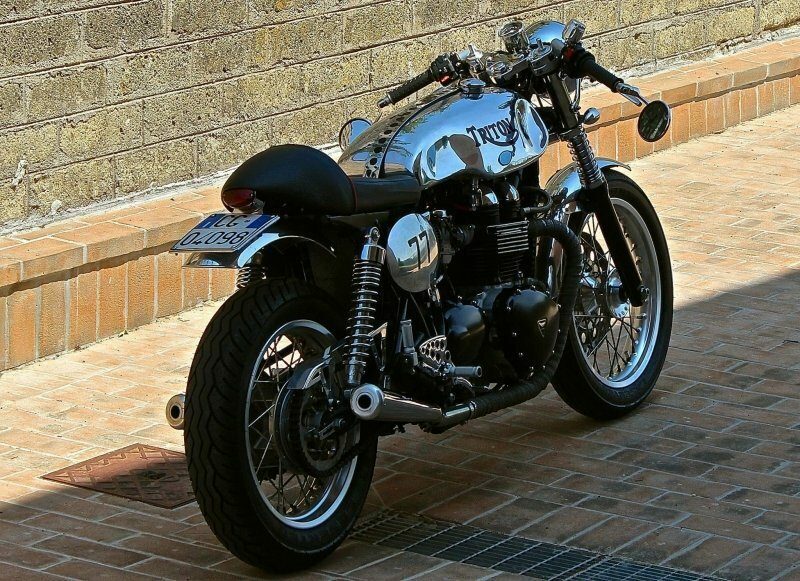 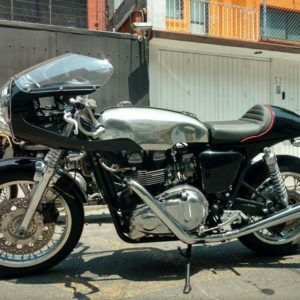 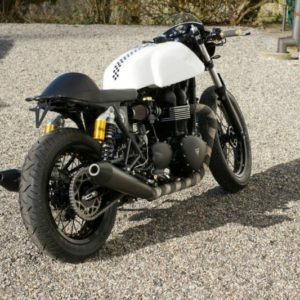 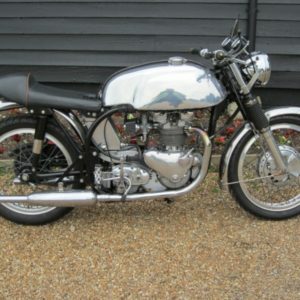 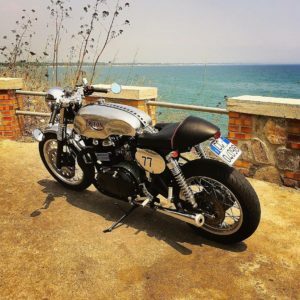 Cafe Racer style Slippery Sam tank on a modern British Classic Triumph – perfect! 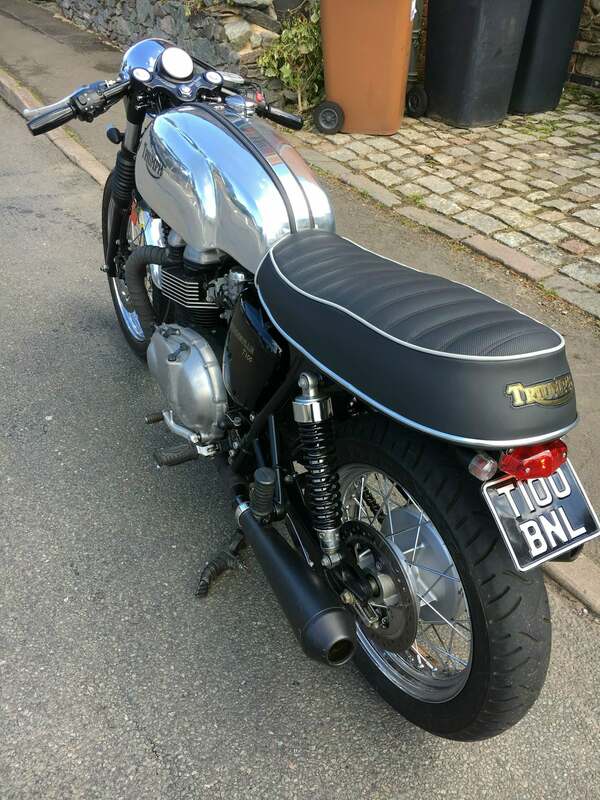 Polished alloy Triumph Thruxton seat,fully upholstered in suede. 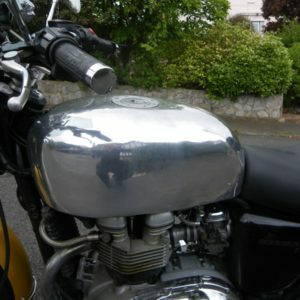 Slippery Sam tank and cowl, this time with a ‘scurfed’ finish rather than polished on a Triumph. 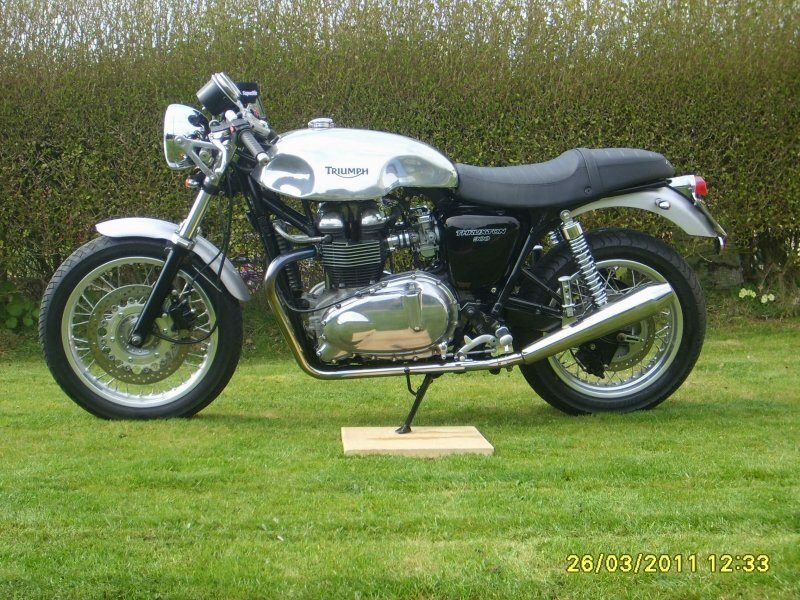 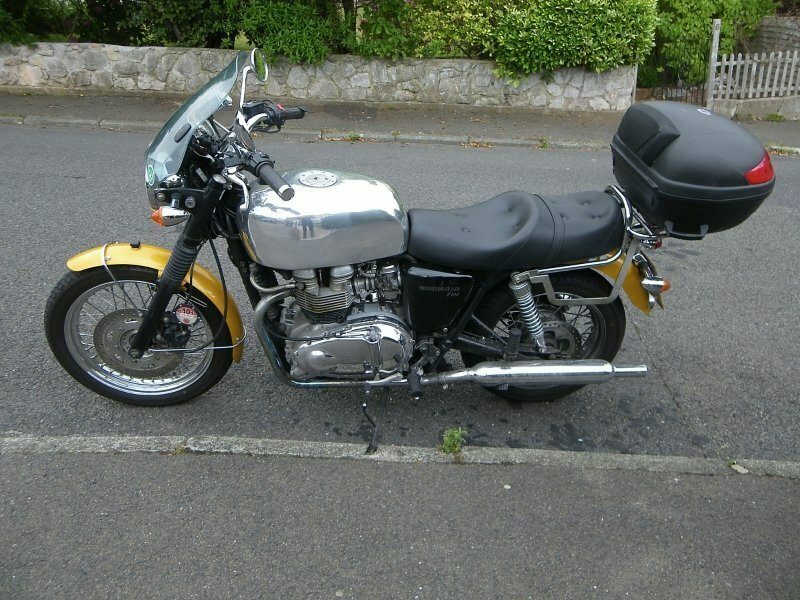 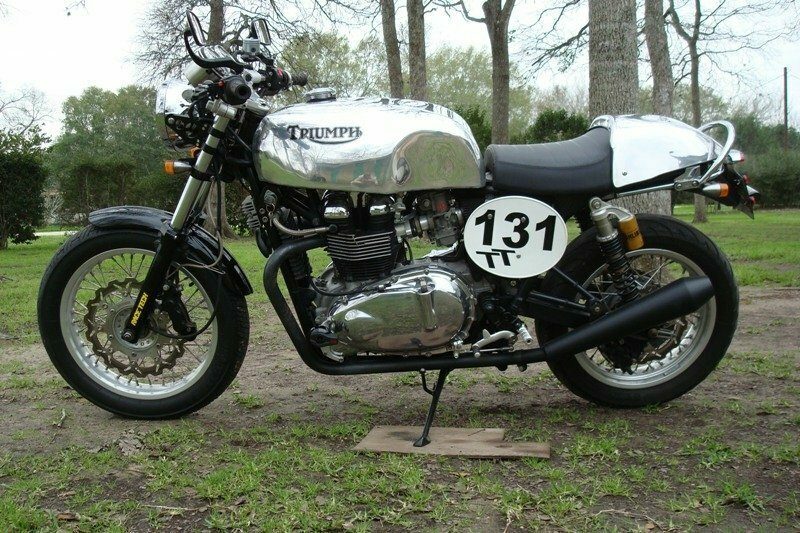 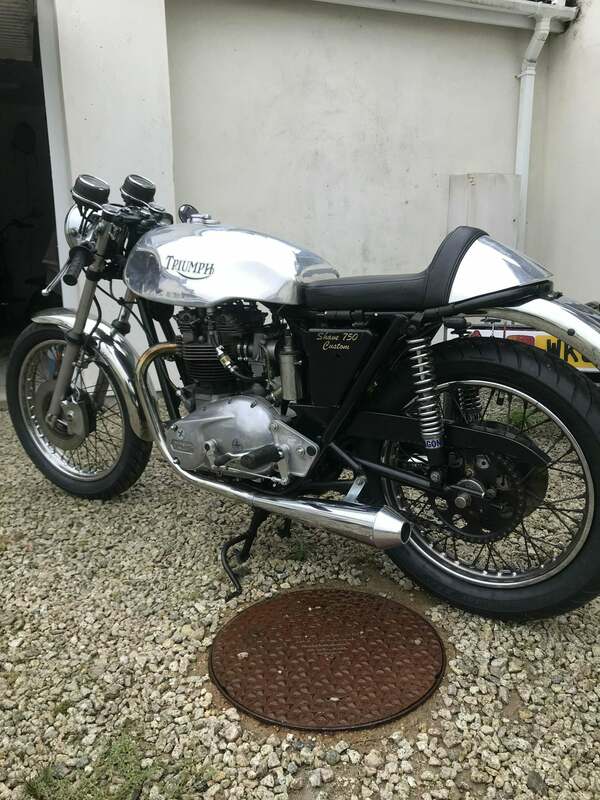 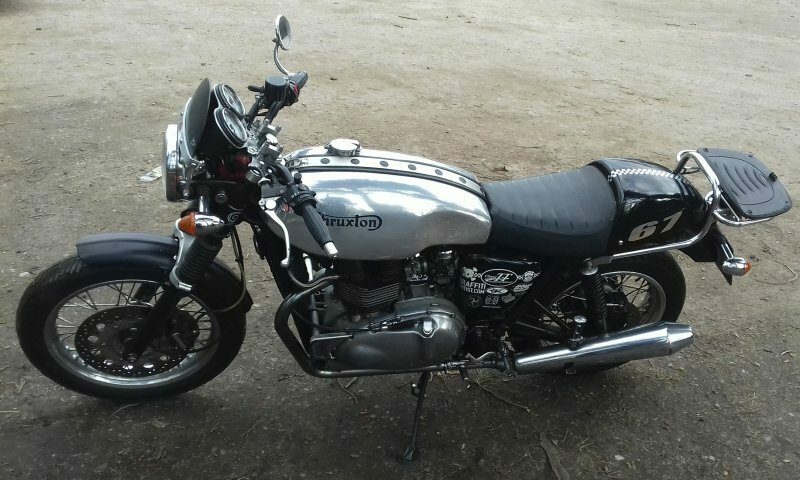 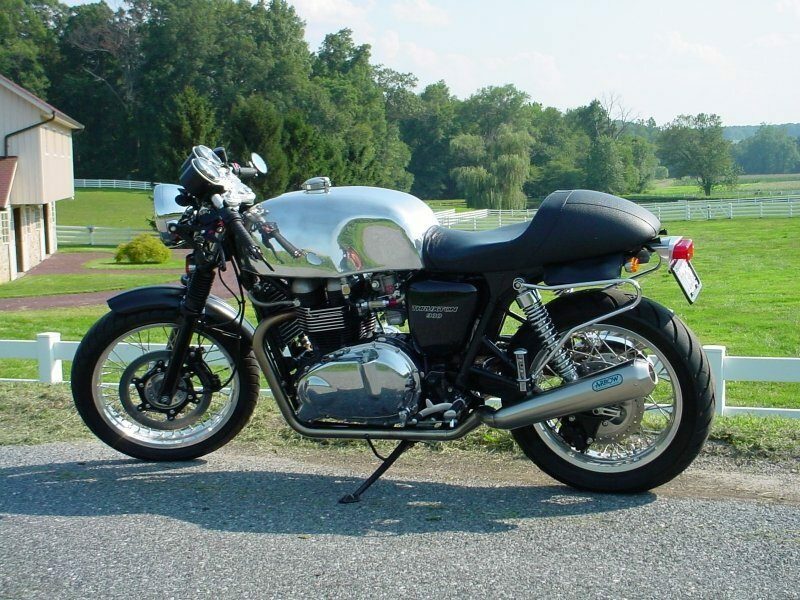 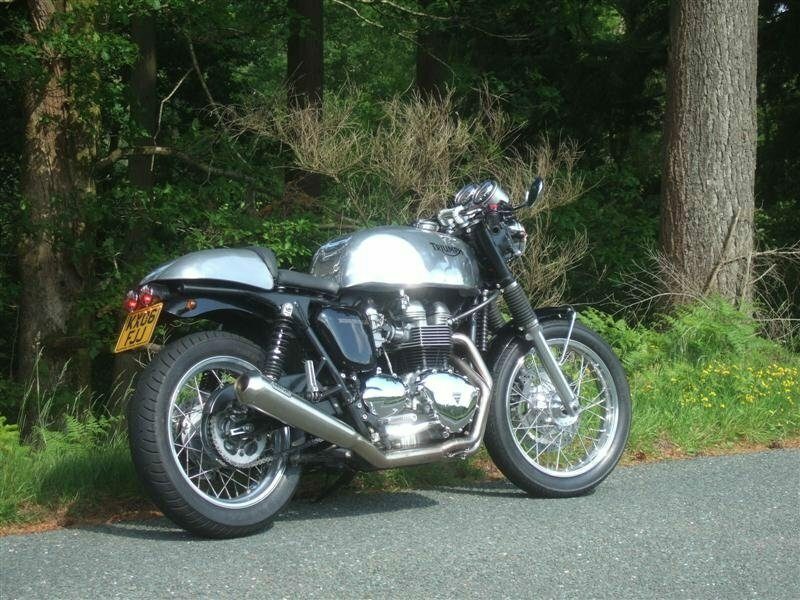 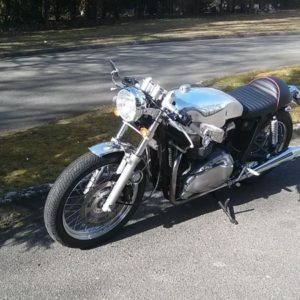 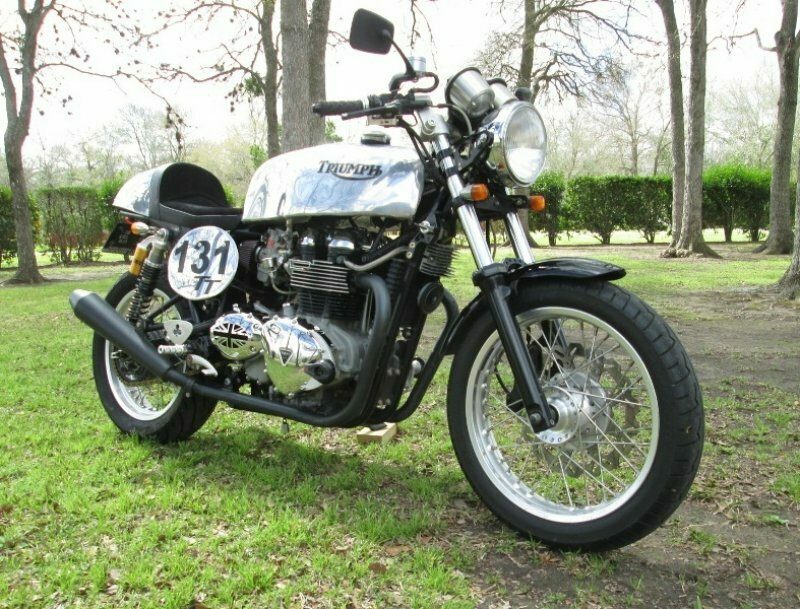 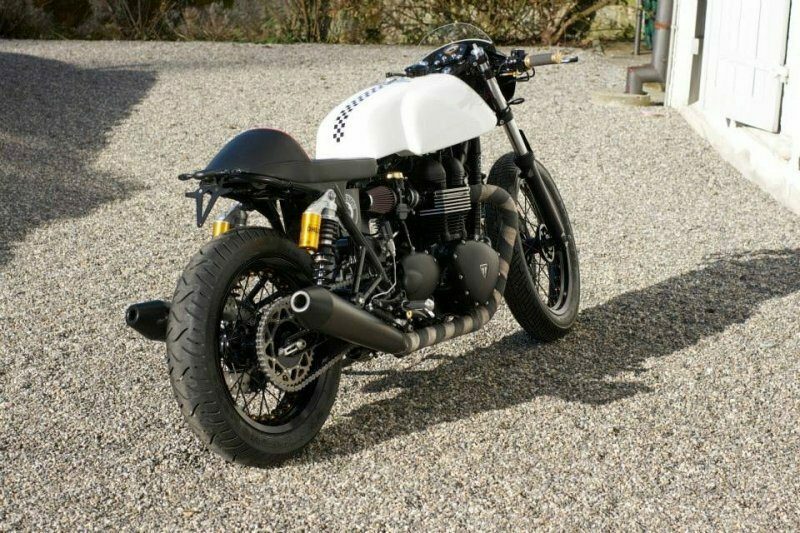 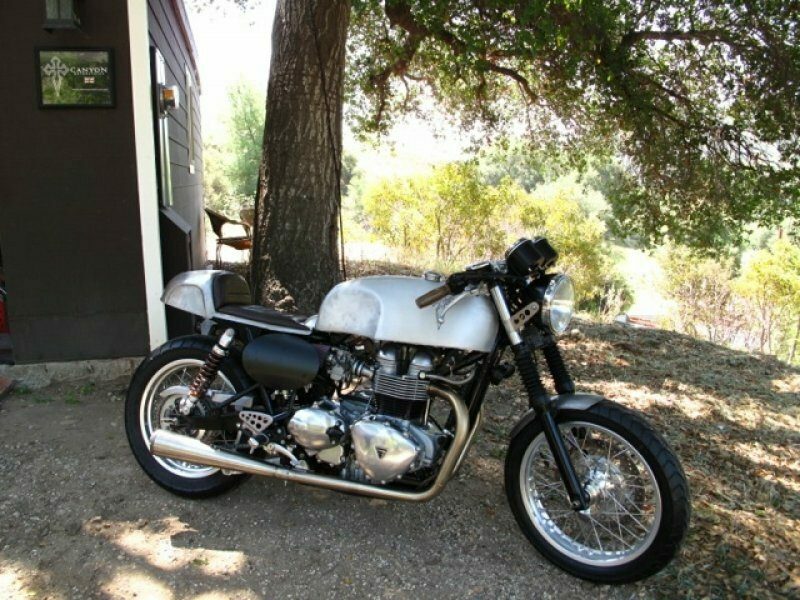 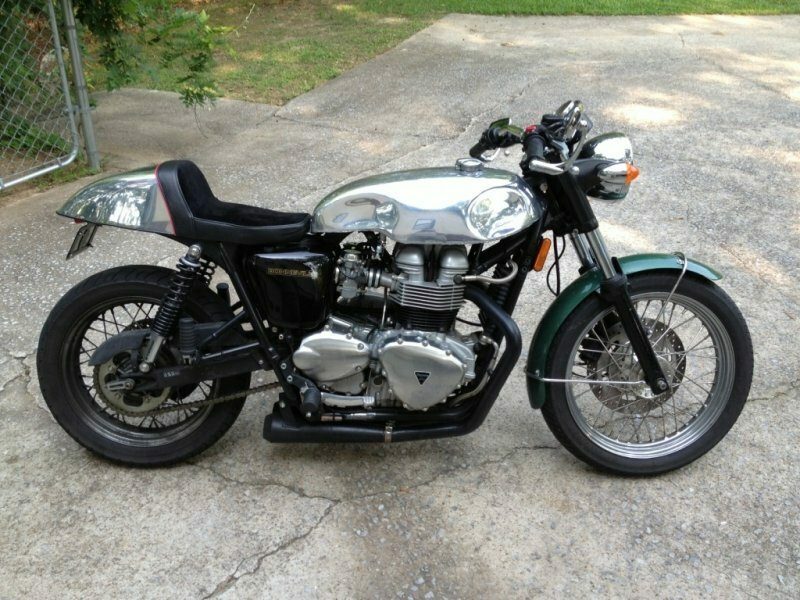 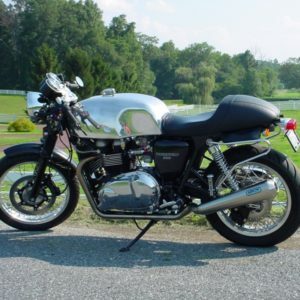 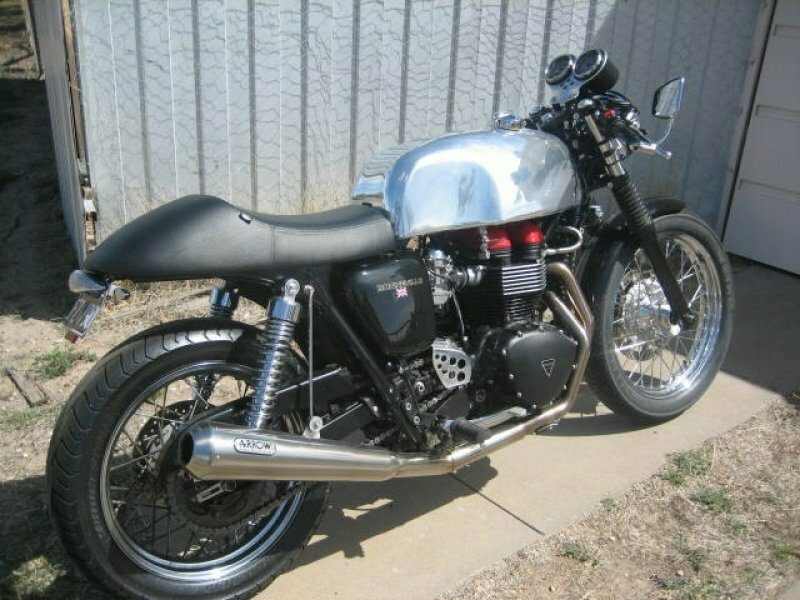 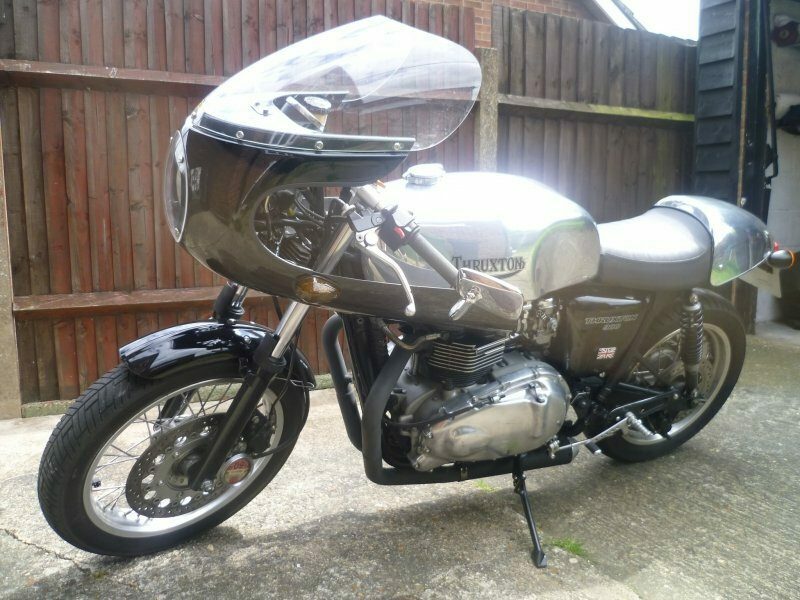 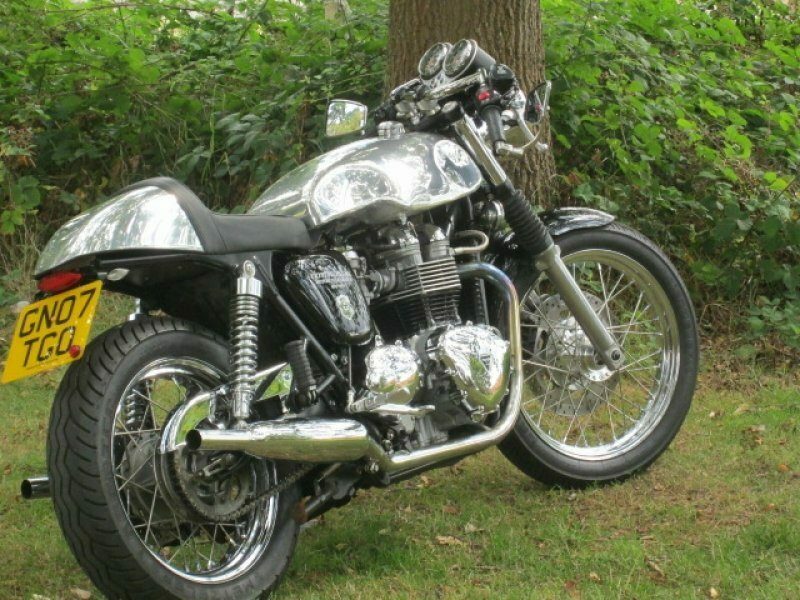 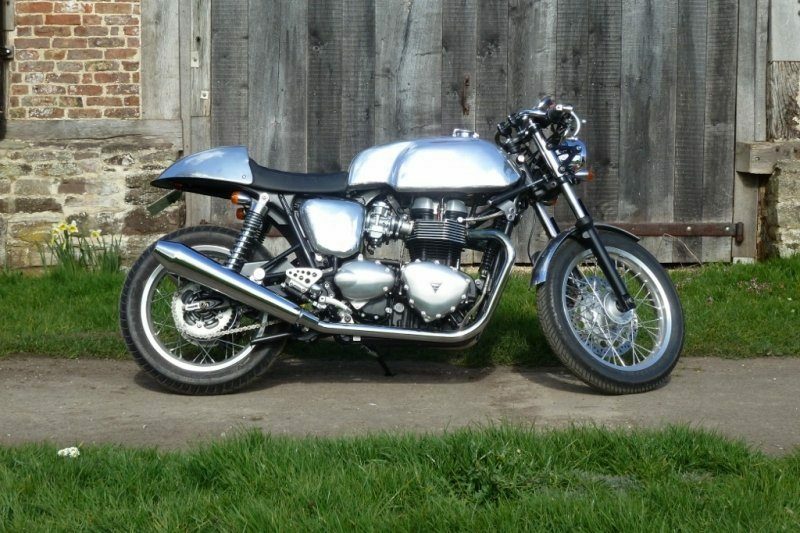 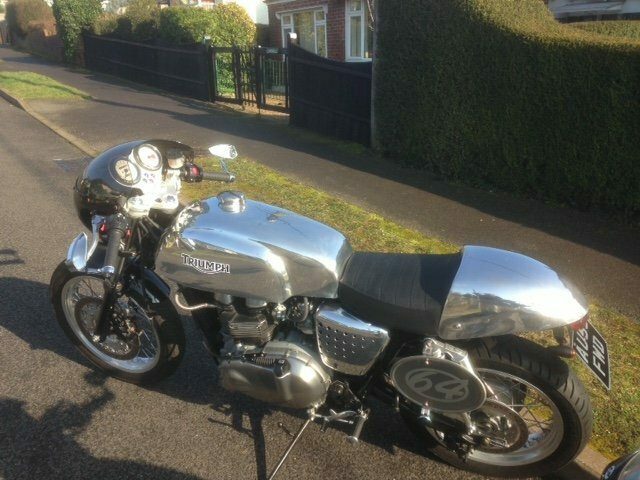 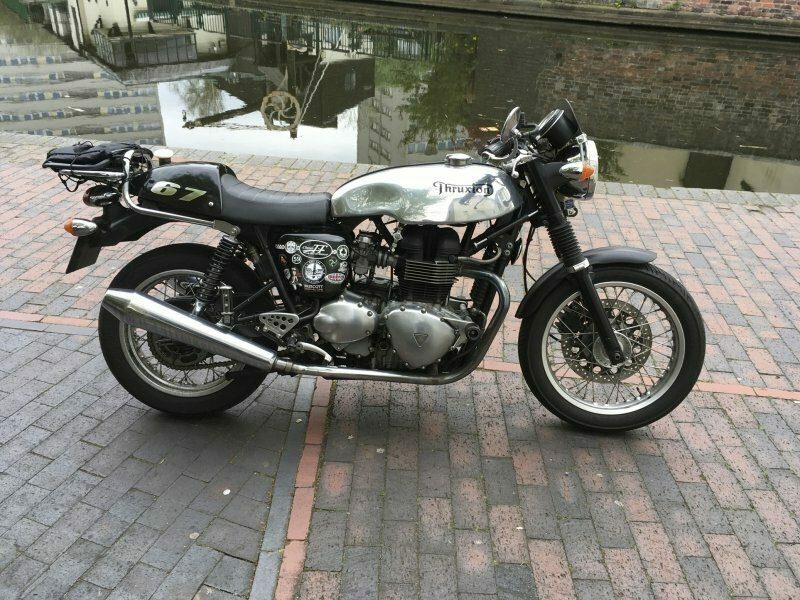 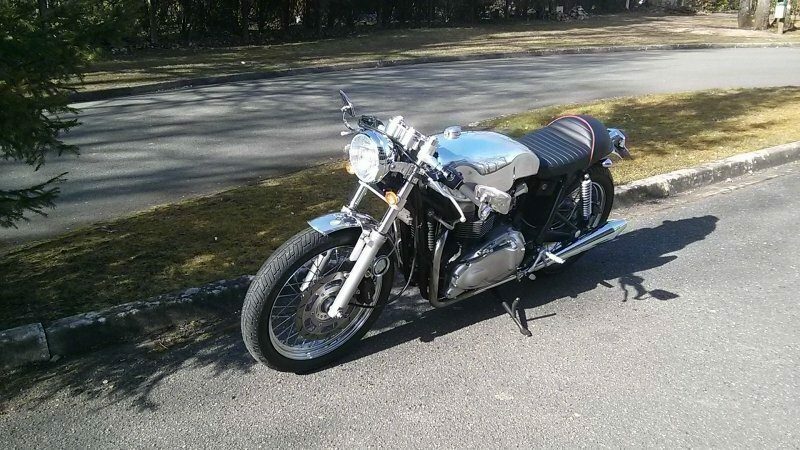 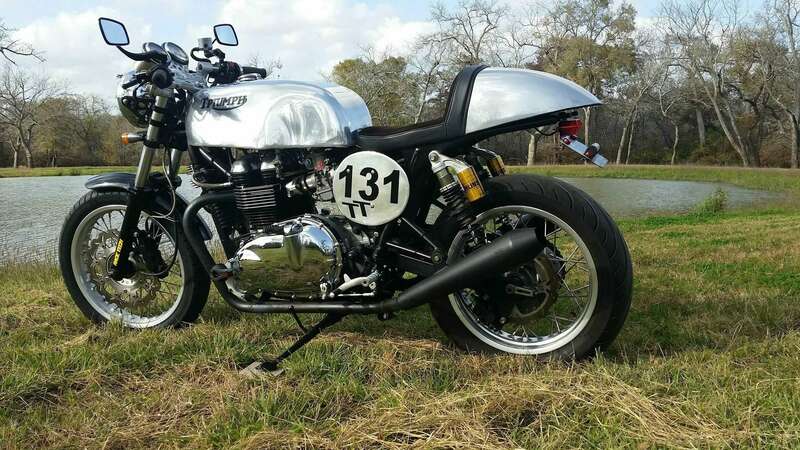 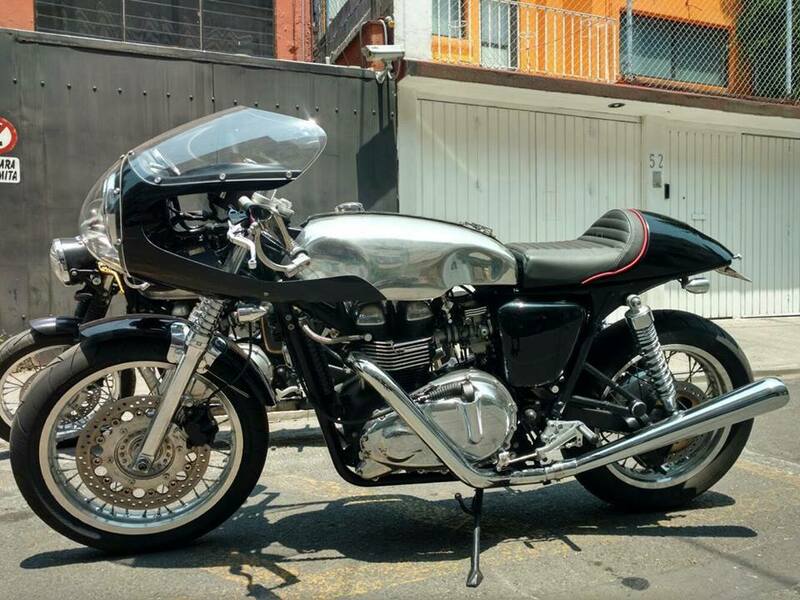 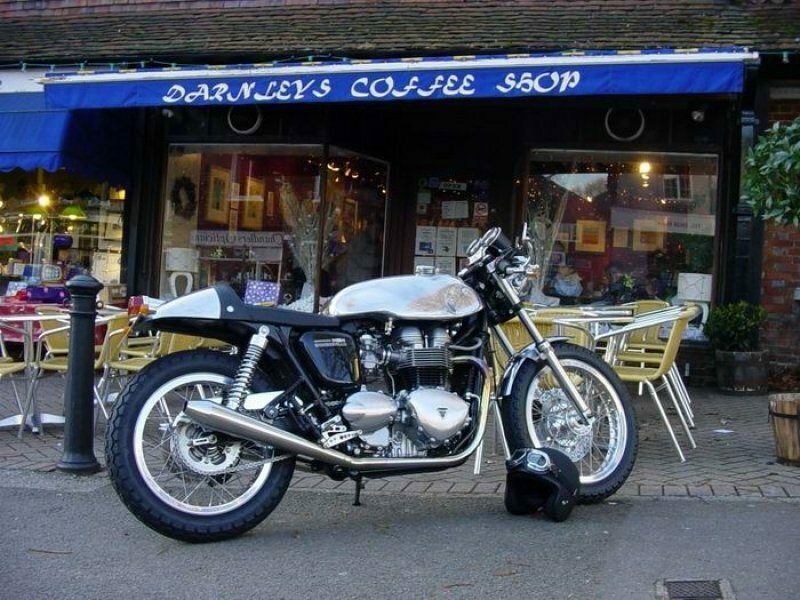 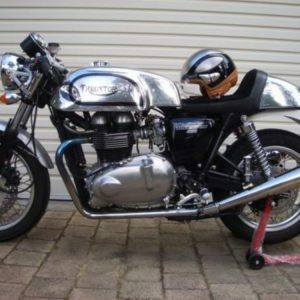 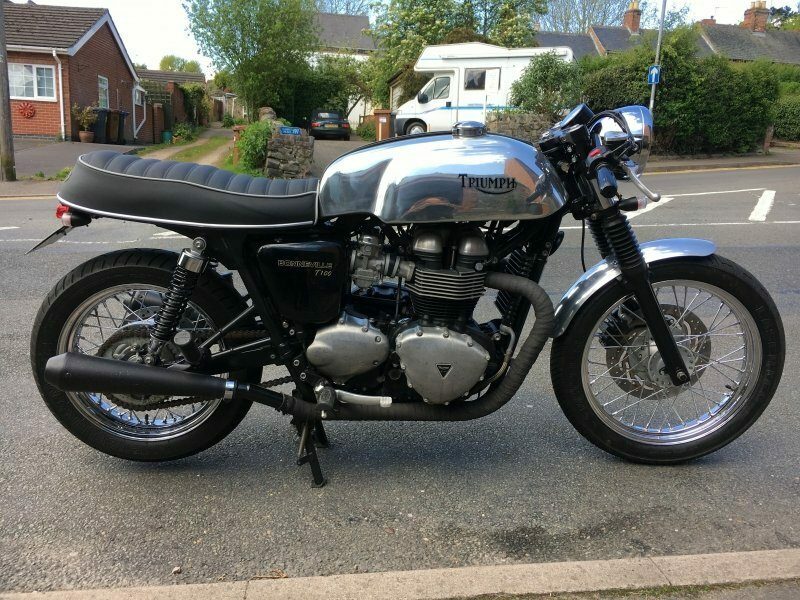 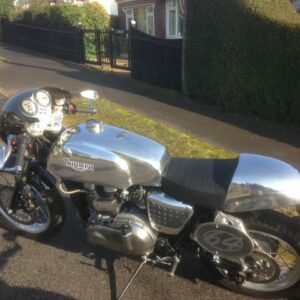 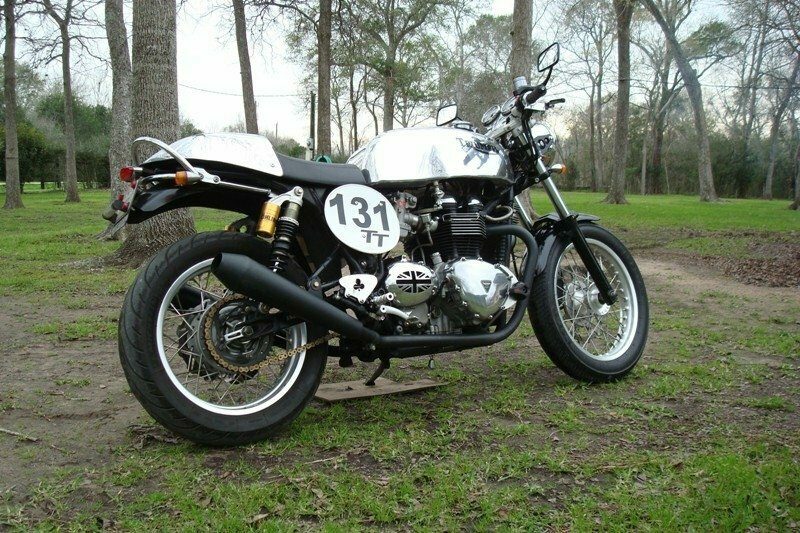 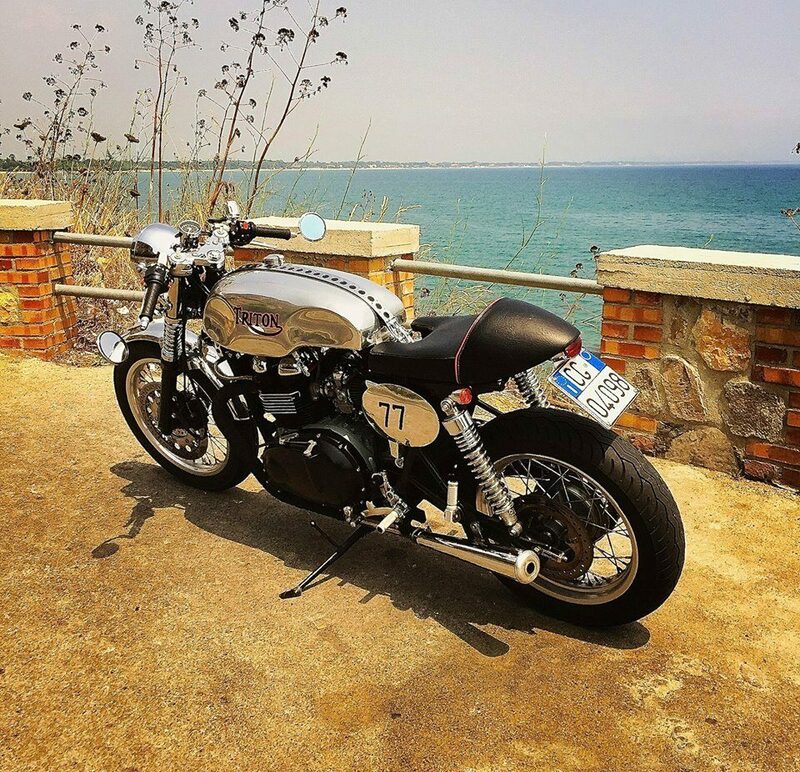 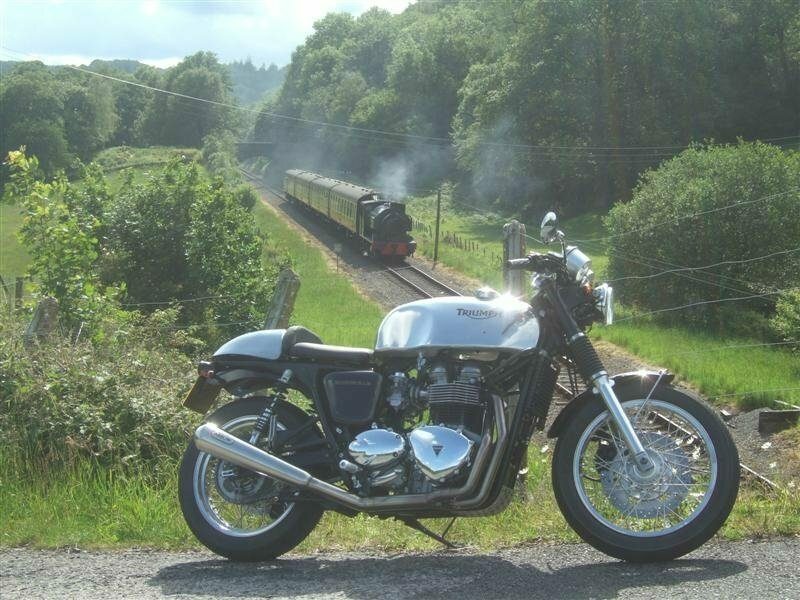 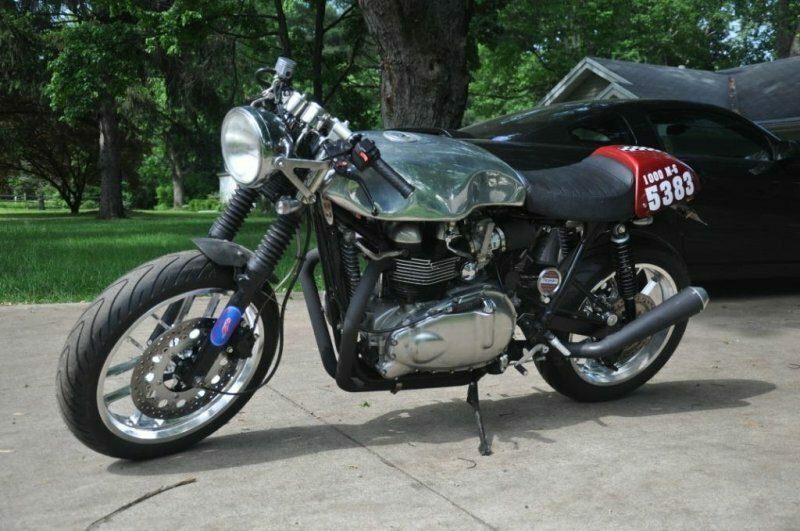 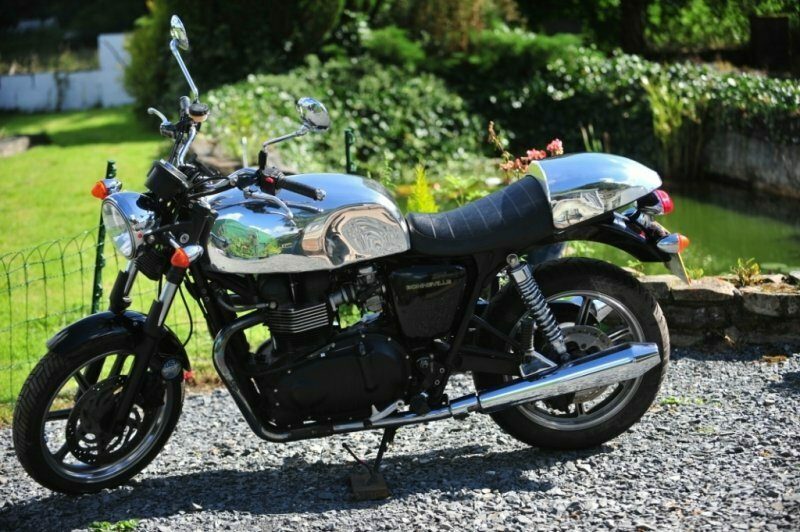 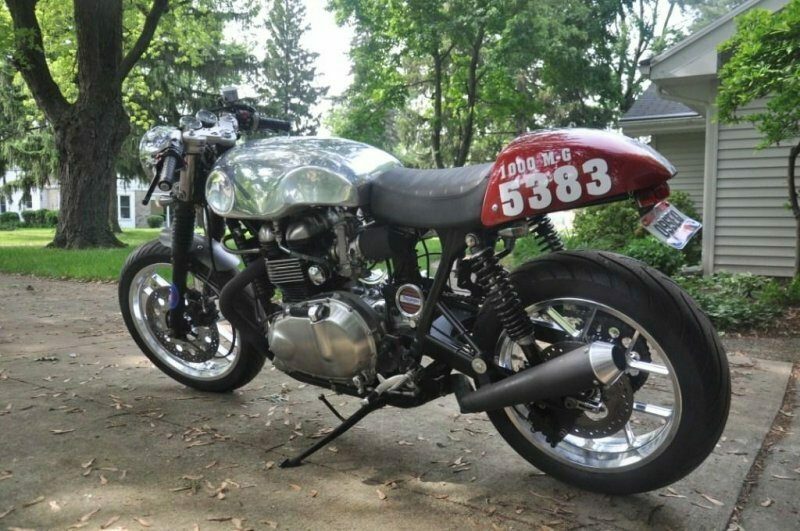 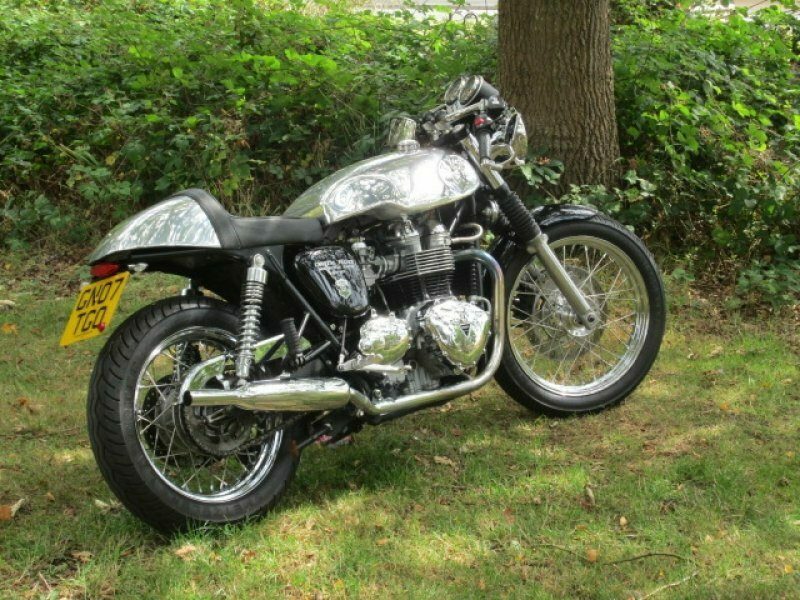 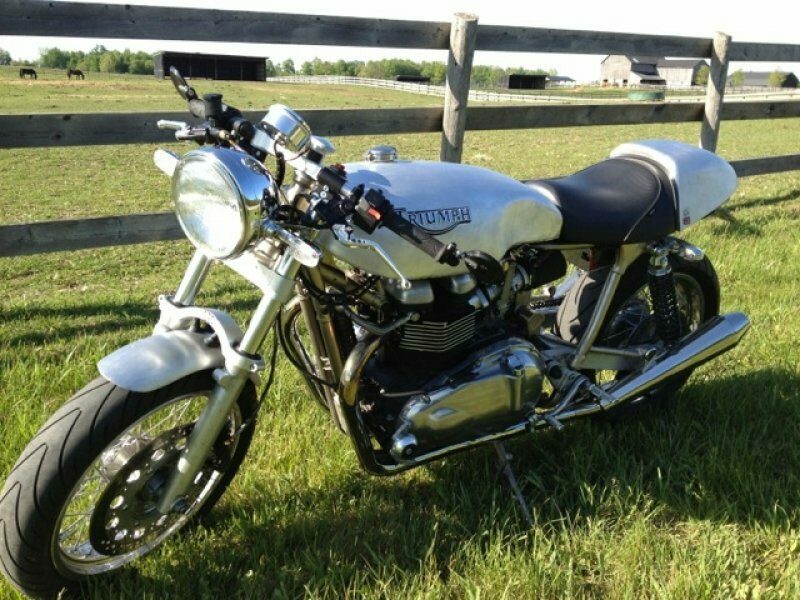 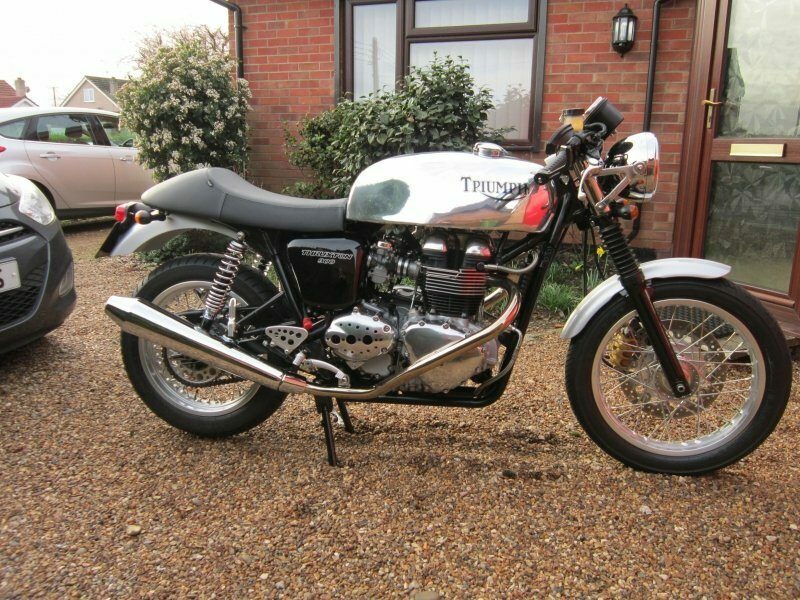 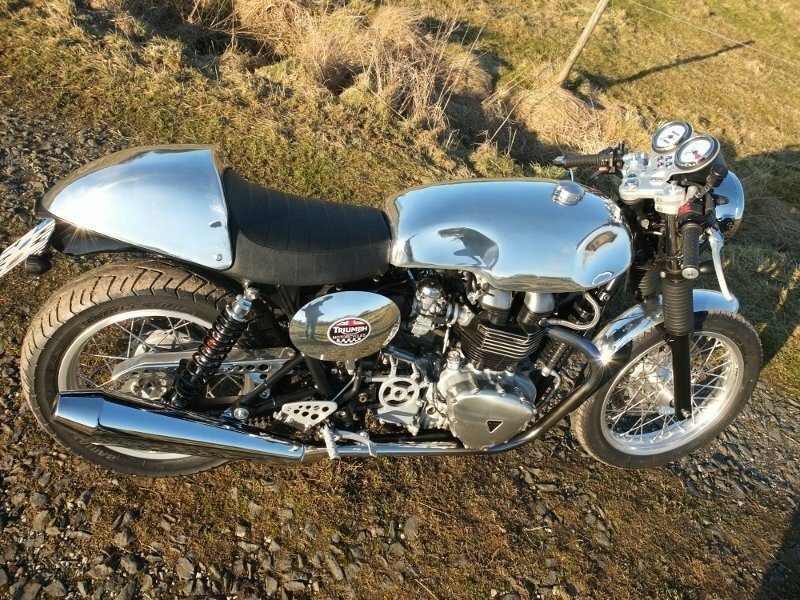 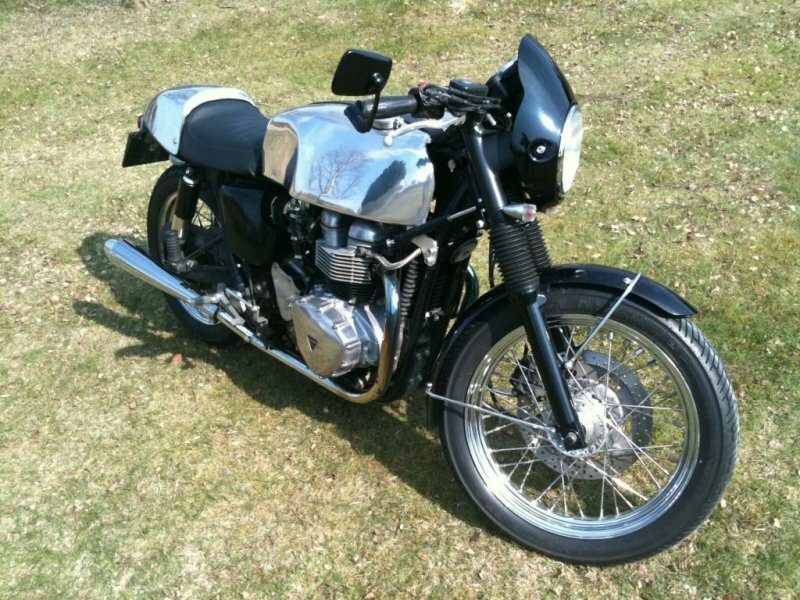 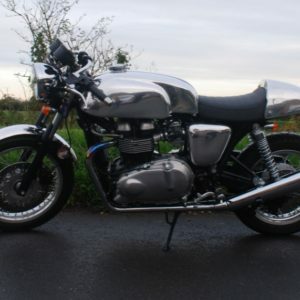 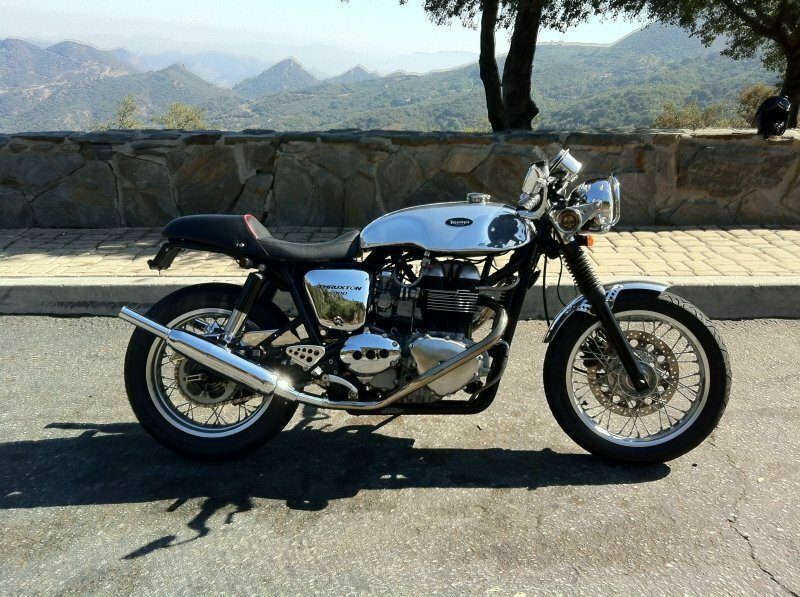 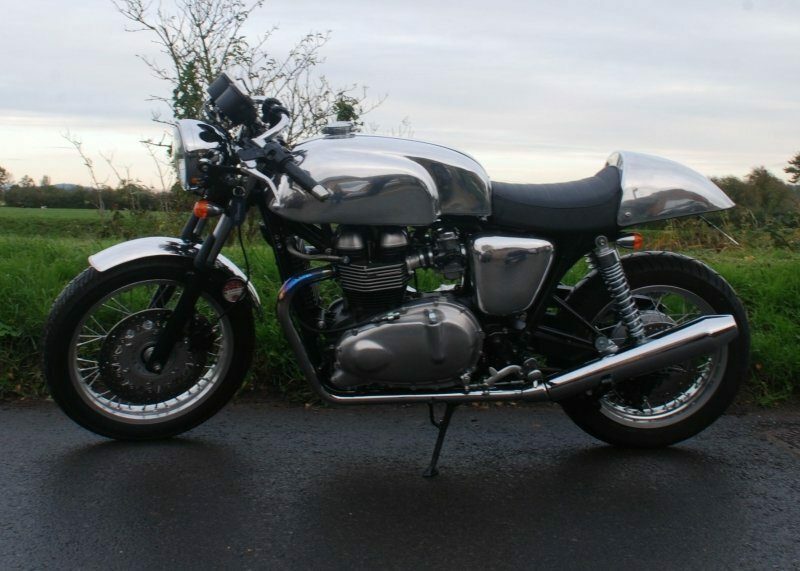 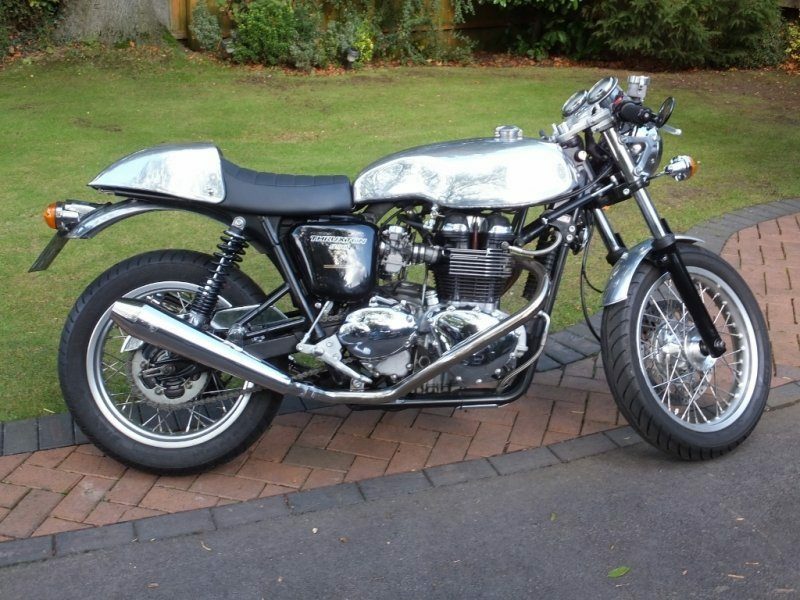 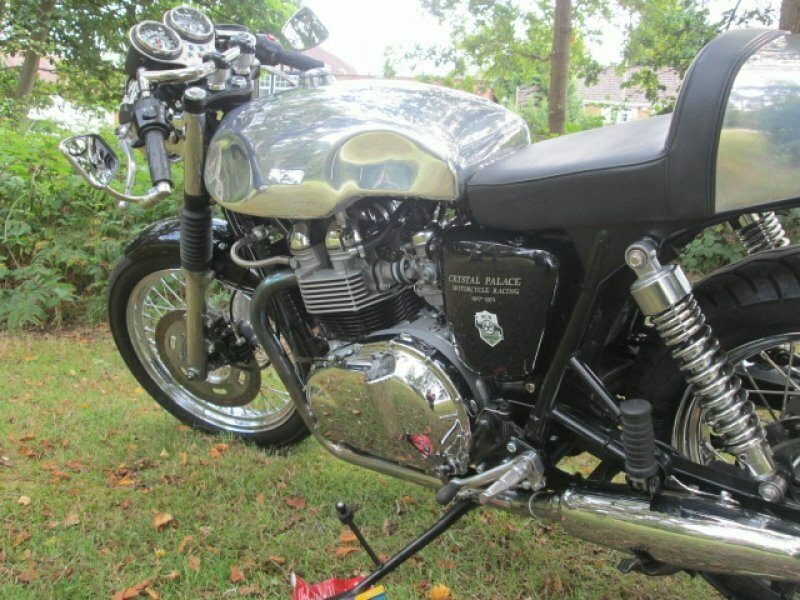 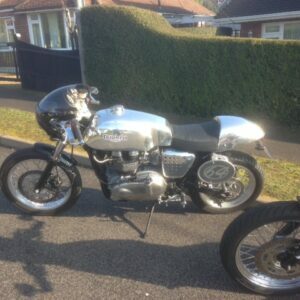 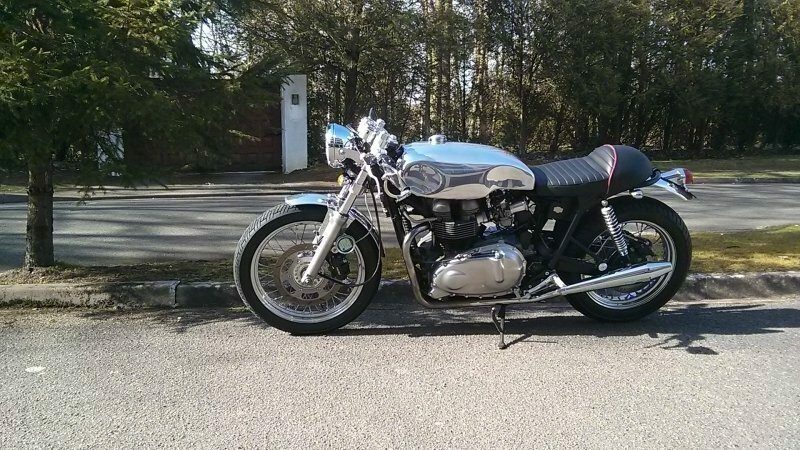 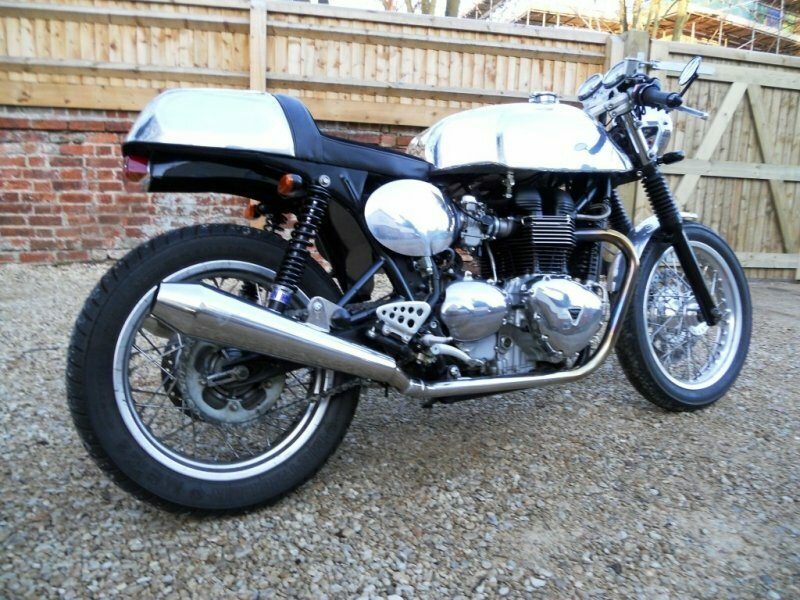 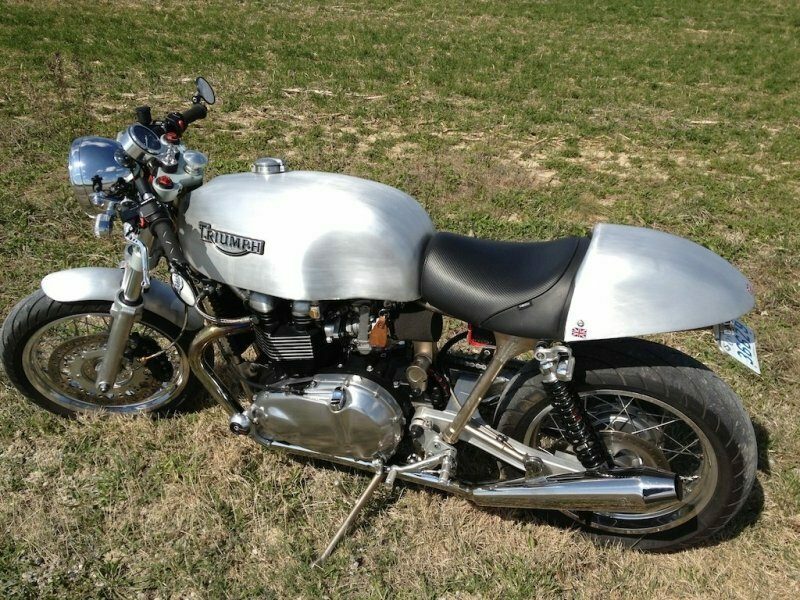 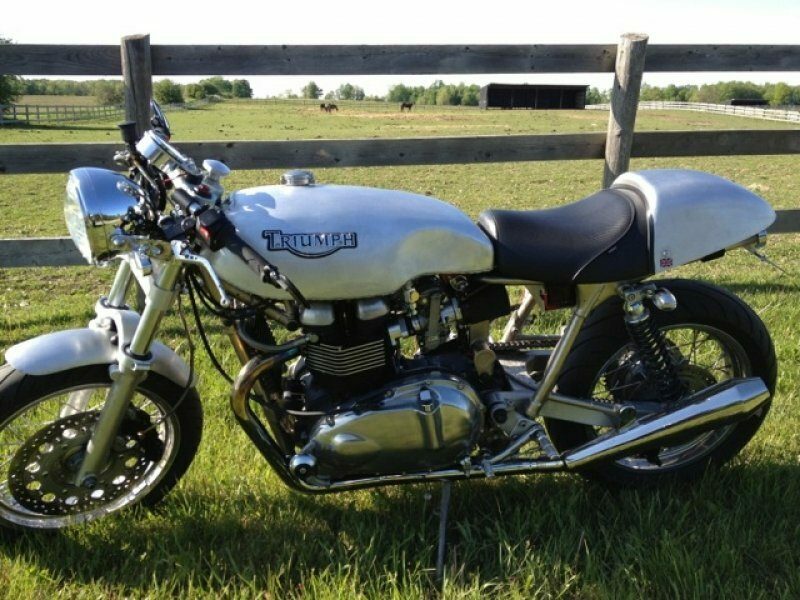 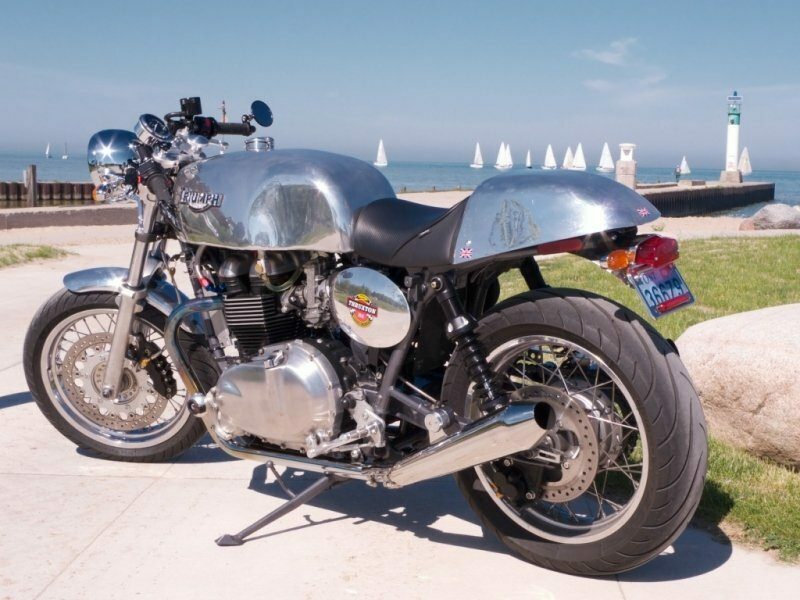 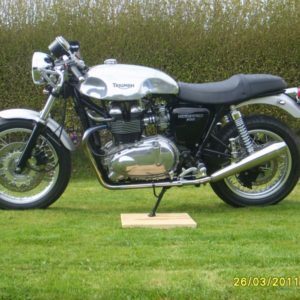 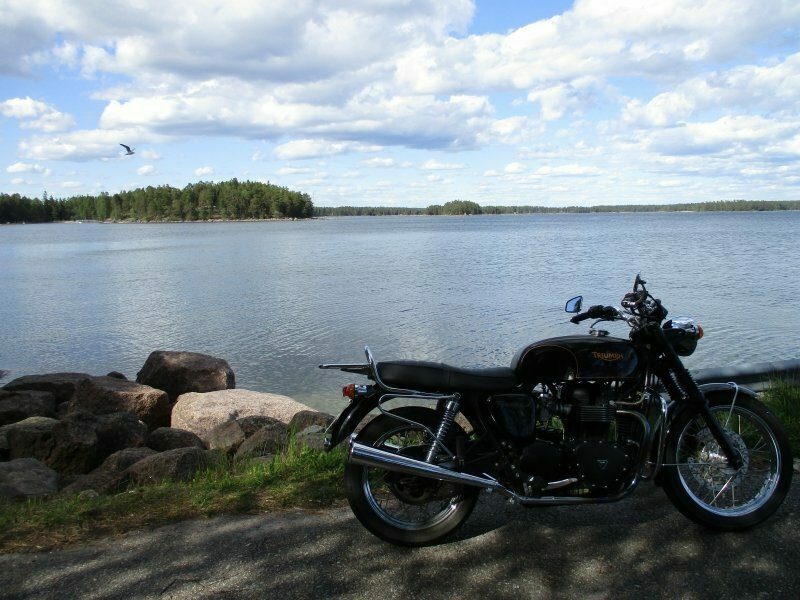 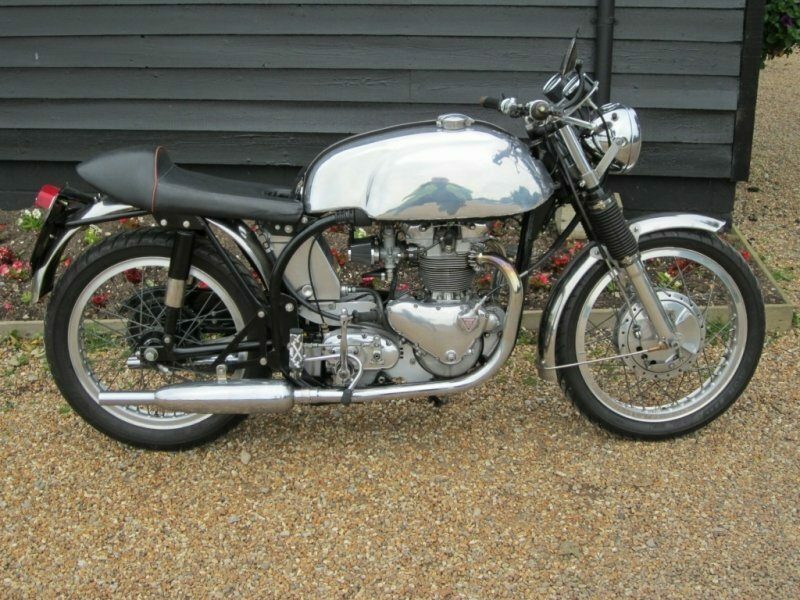 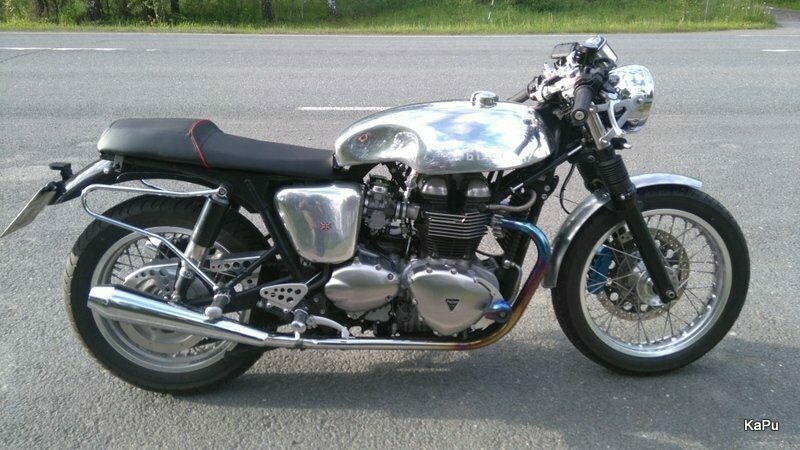 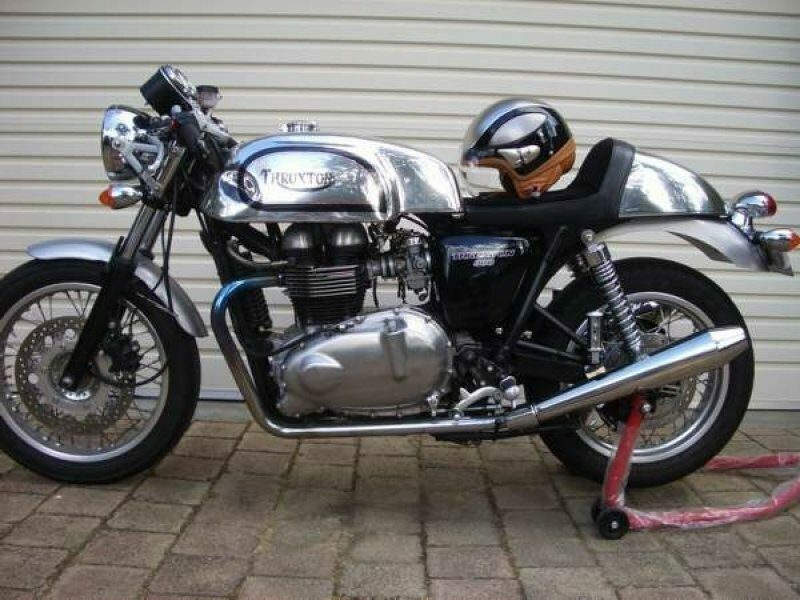 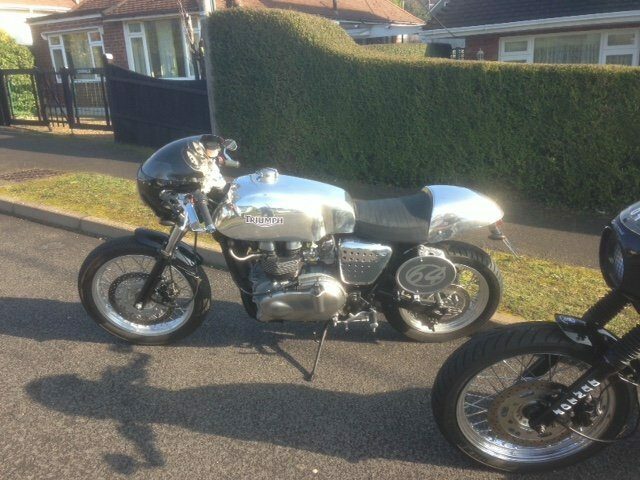 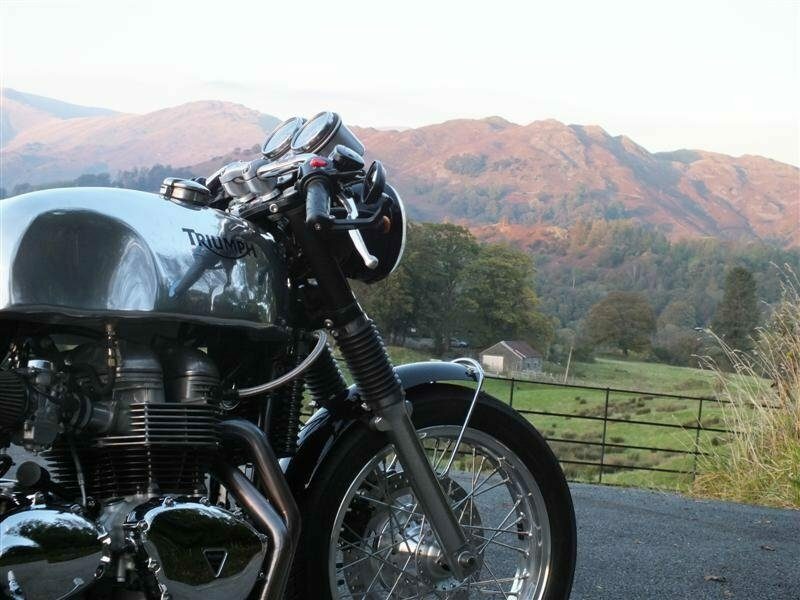 A Hinkley Triumph Thruxton with a Sprint style tank + Cafe style seat – the perfect combo! 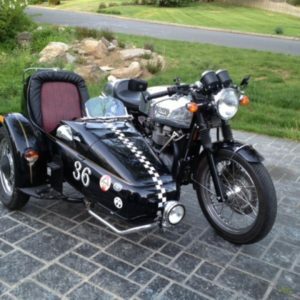 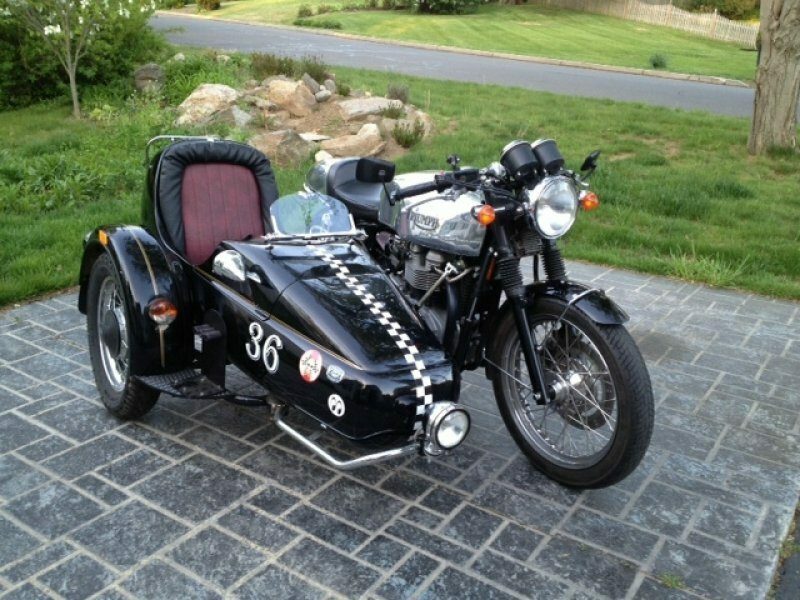 A very different approach, a TAB Slippery Sam tank and TAB seat on a Triumph Thrux but this time with a period sidecar. 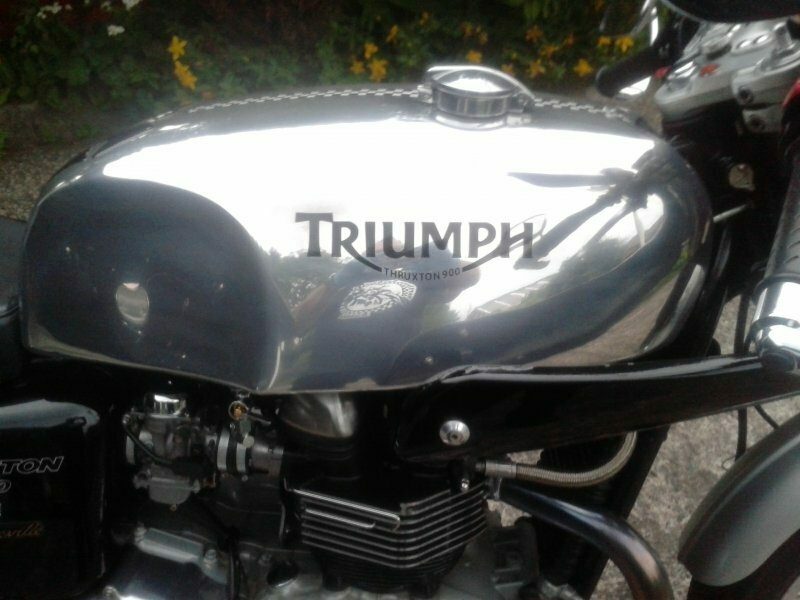 Sprint tank and our seat hump on a Triumph T160,this time the tank has an Aero style cap rather than the more usual Monza. 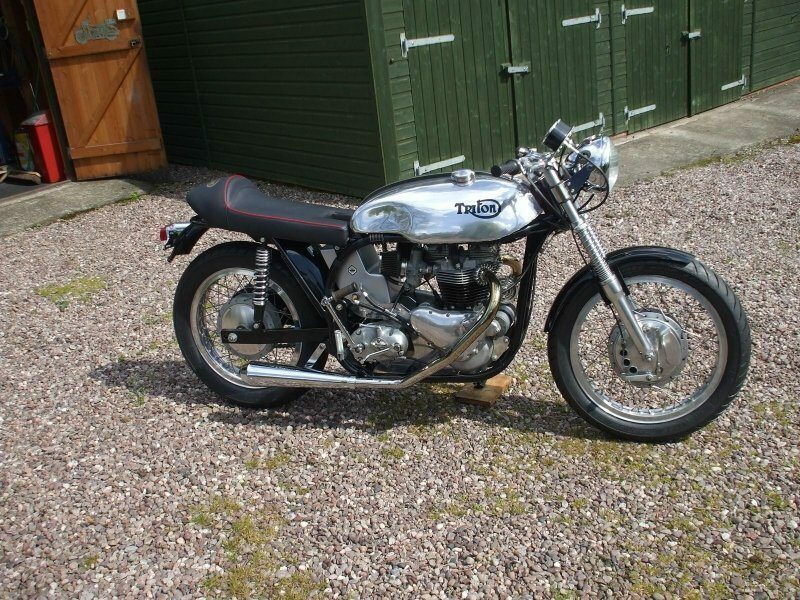 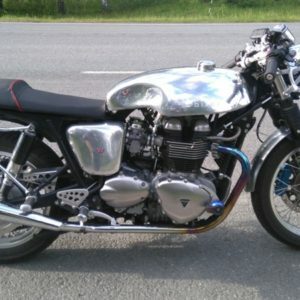 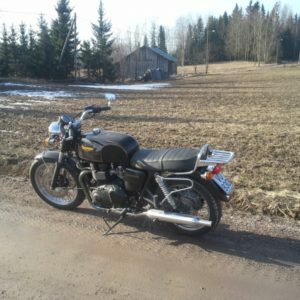 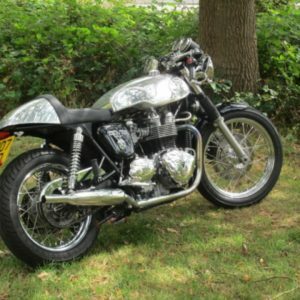 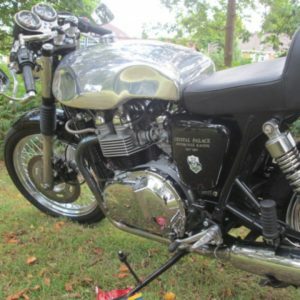 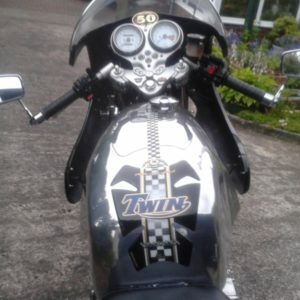 Slippery Sam on a Triumph Thrux, this time with a scuffed finish rather than polished. 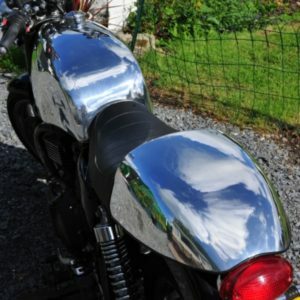 Painted Slippery Sam on an 08 Triumph Bonneville. 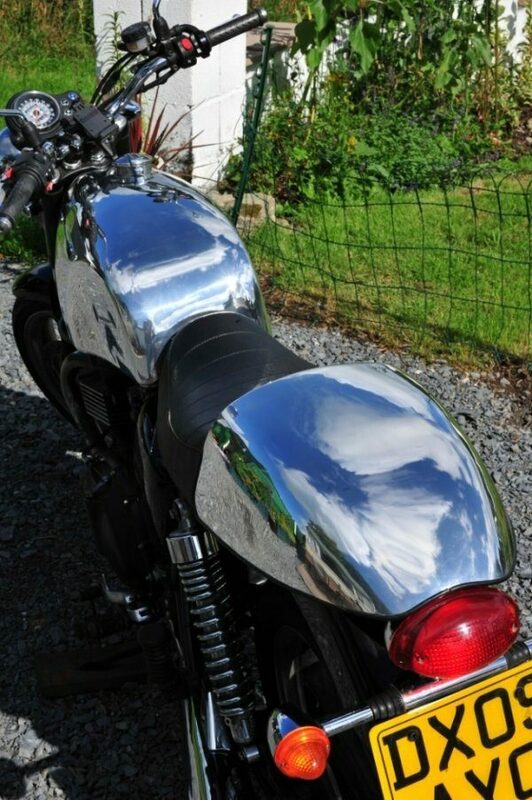 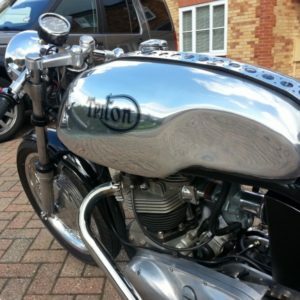 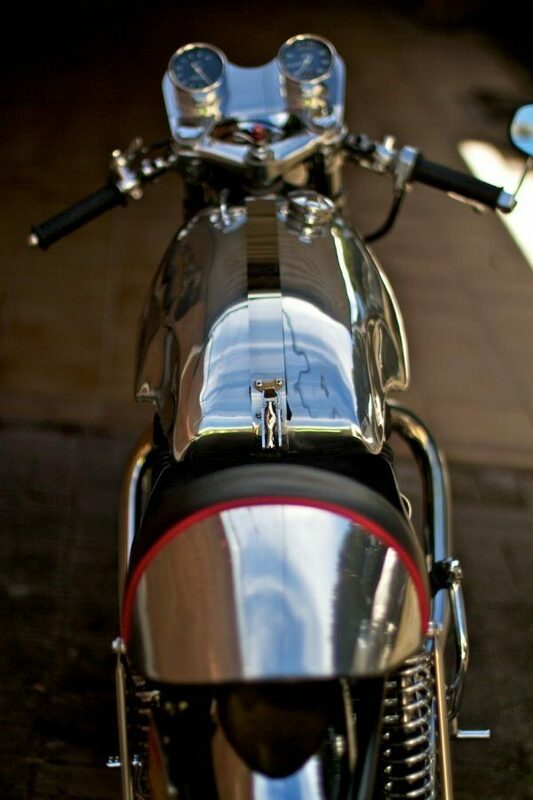 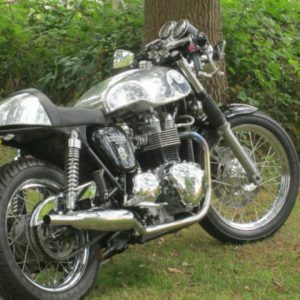 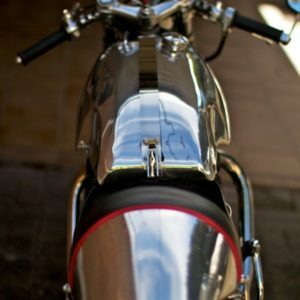 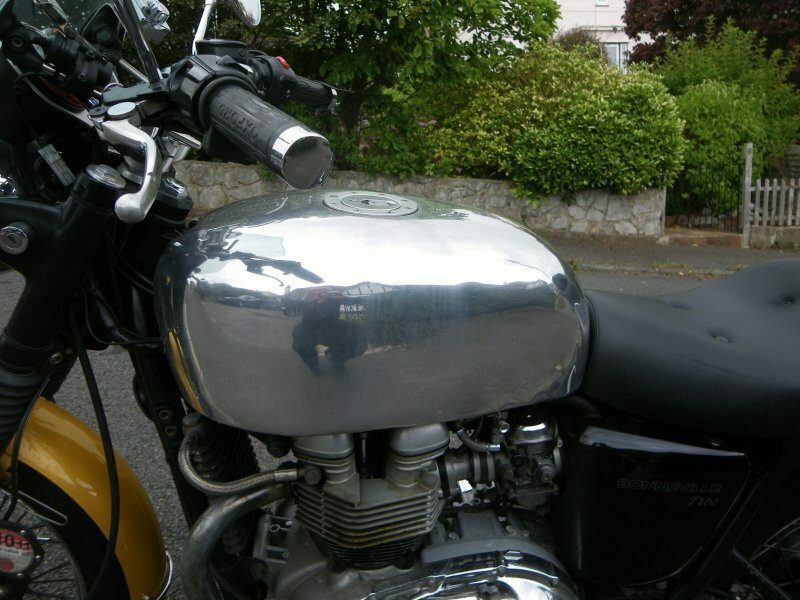 Slippery Sam style tank and seat cowl on a Hinkley Triumph Thruxton – we also made the front fender. 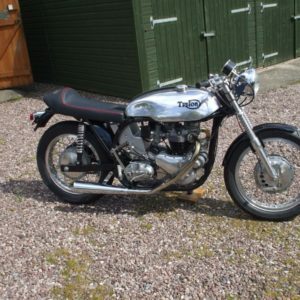 A modern take on an old Classic – A slimline Manx tank and seat on a Featherbed frame with a Hinkley Triumph engine. 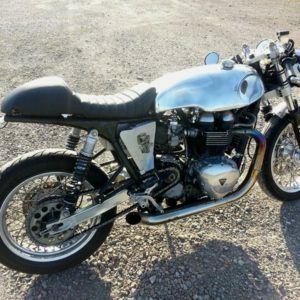 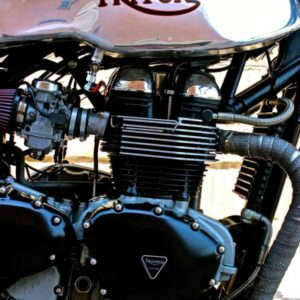 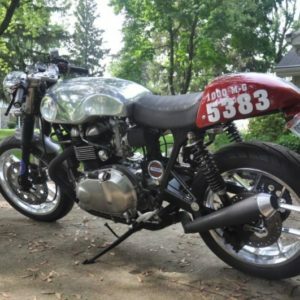 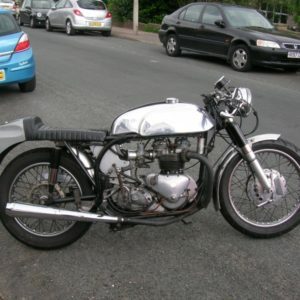 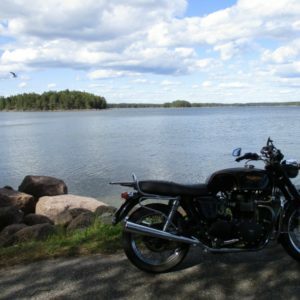 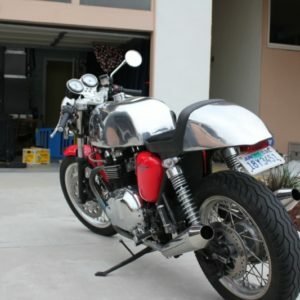 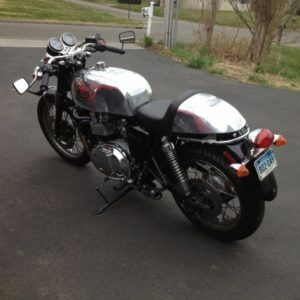 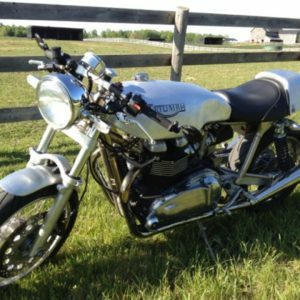 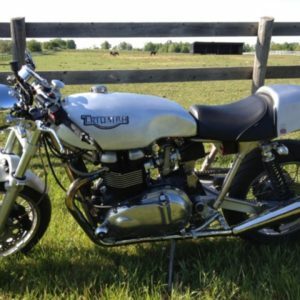 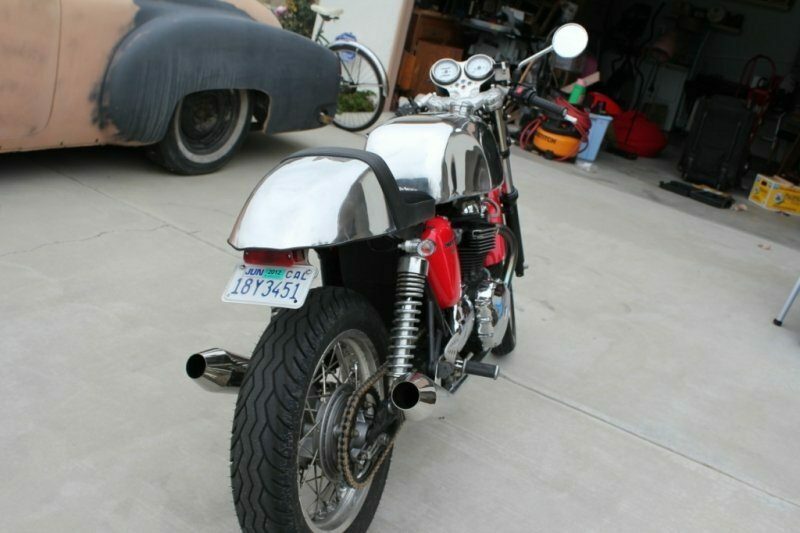 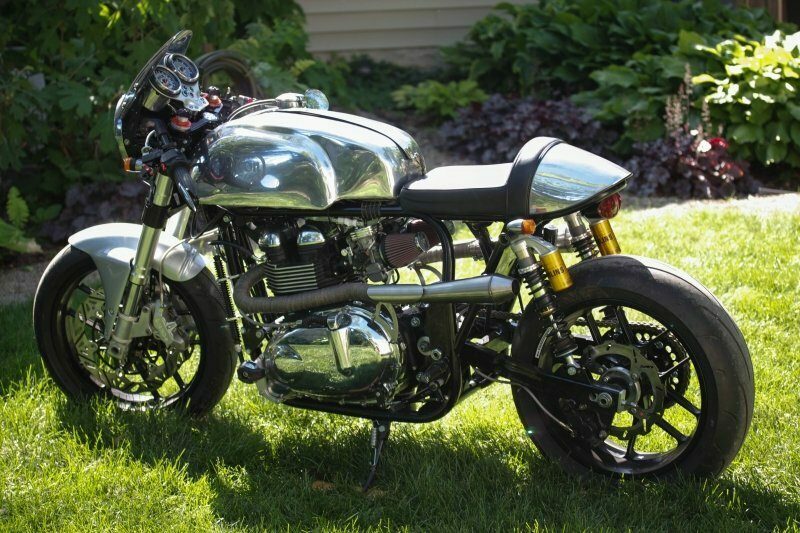 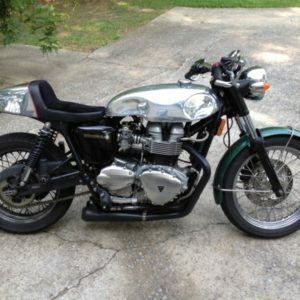 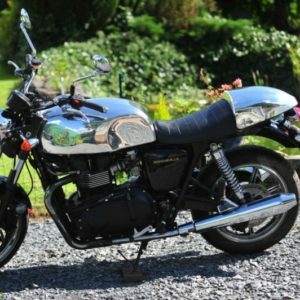 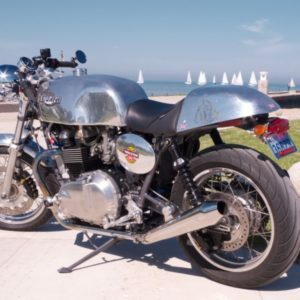 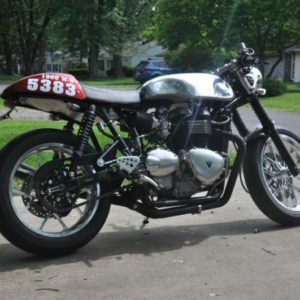 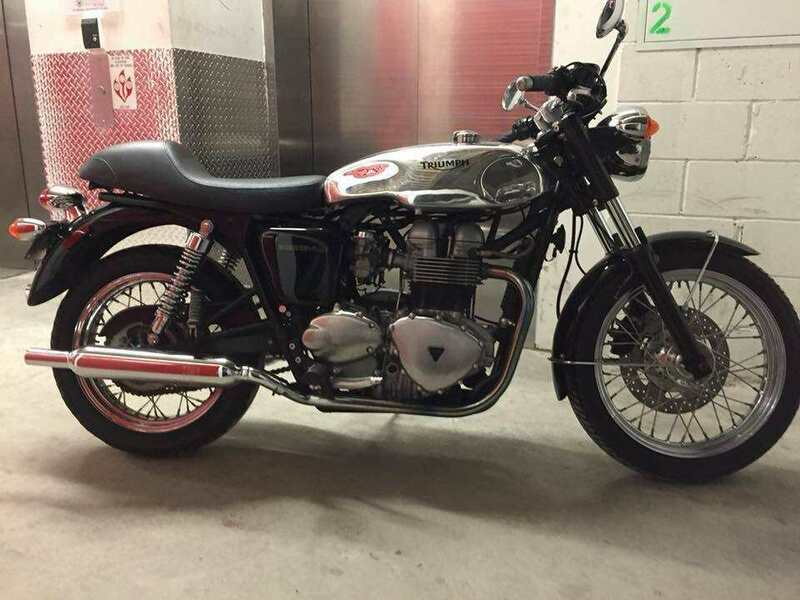 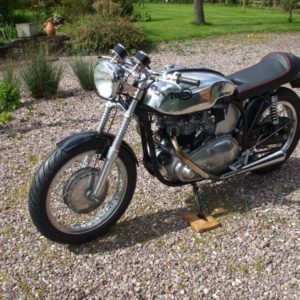 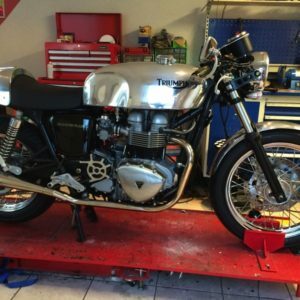 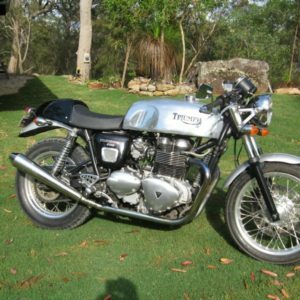 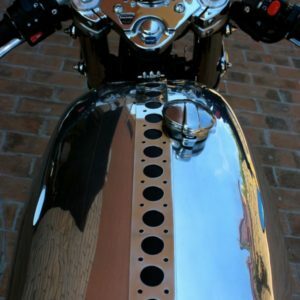 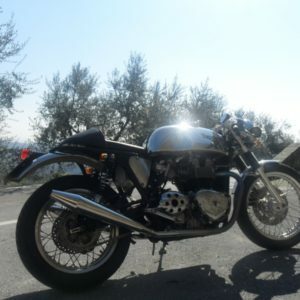 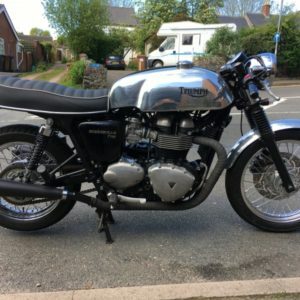 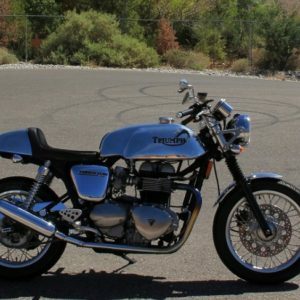 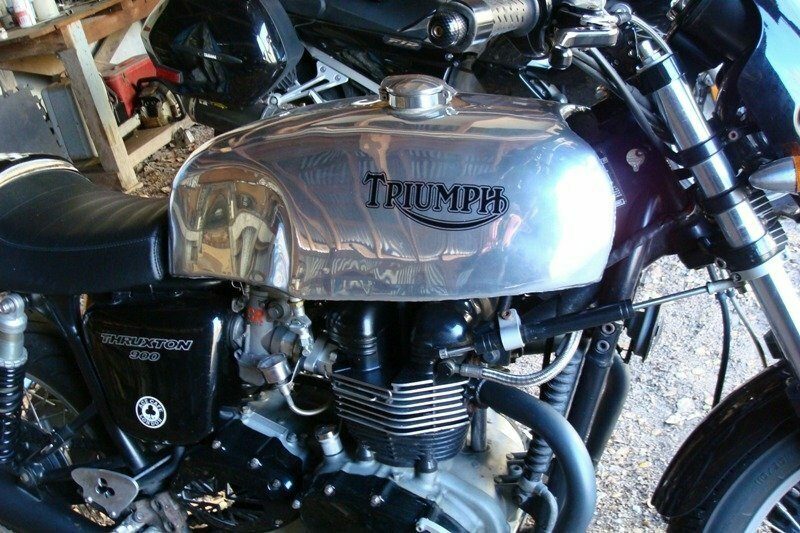 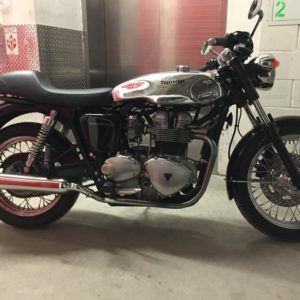 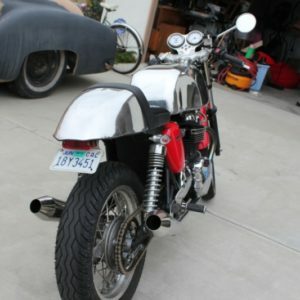 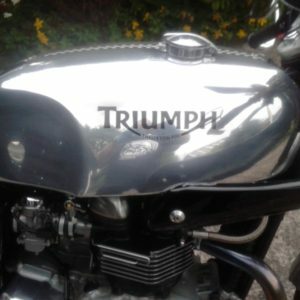 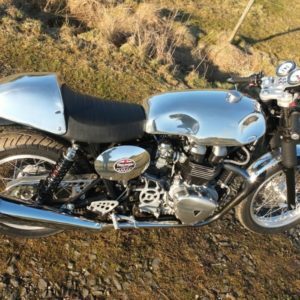 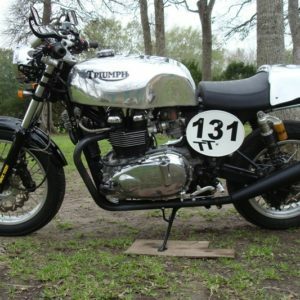 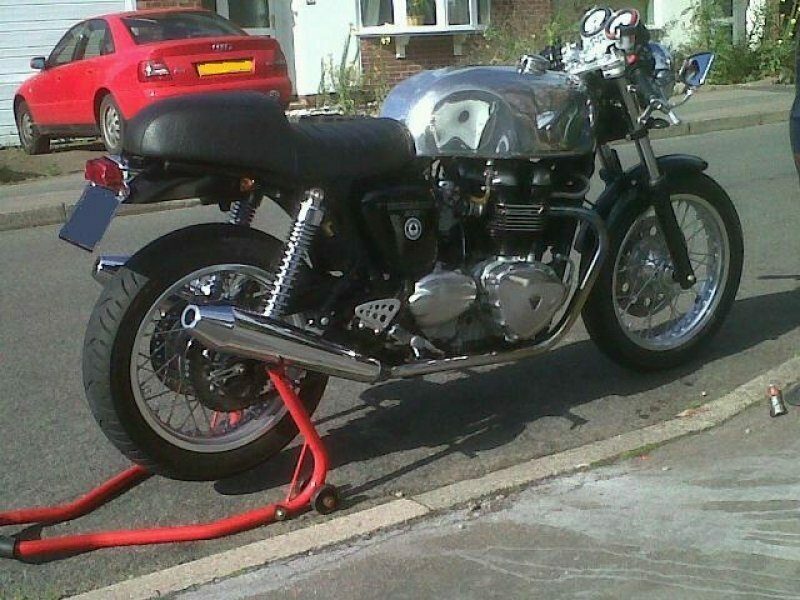 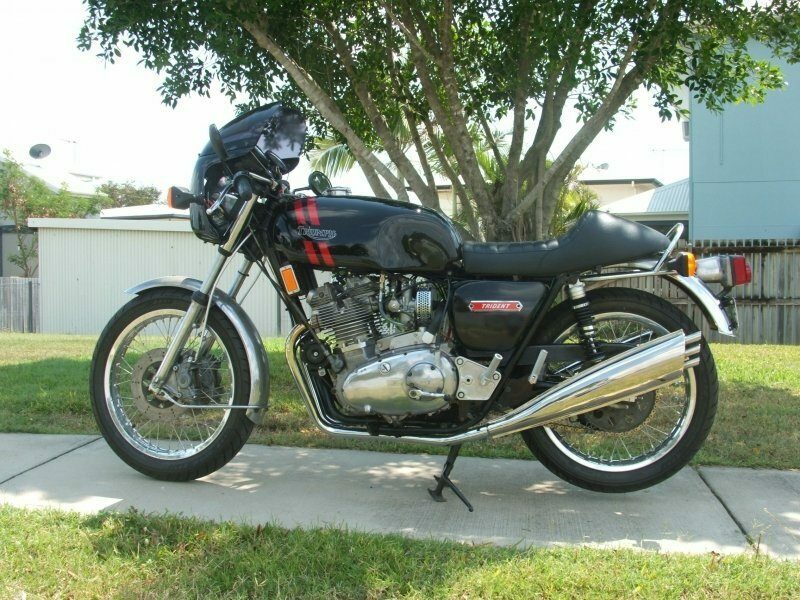 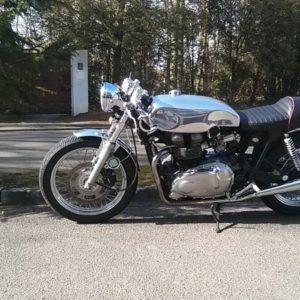 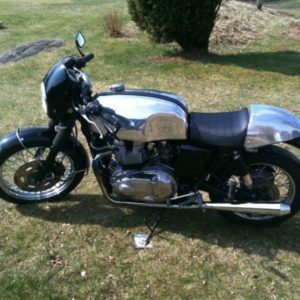 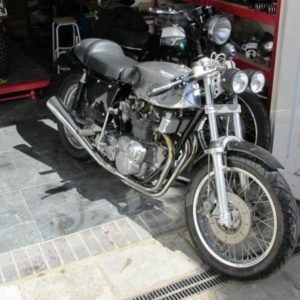 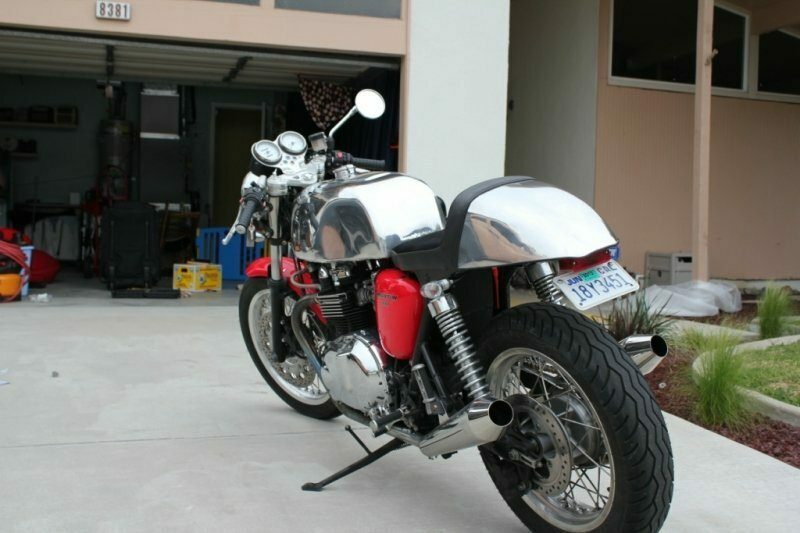 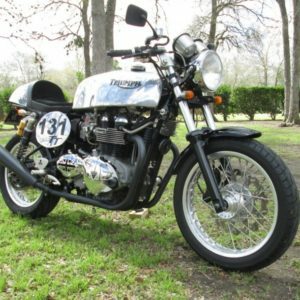 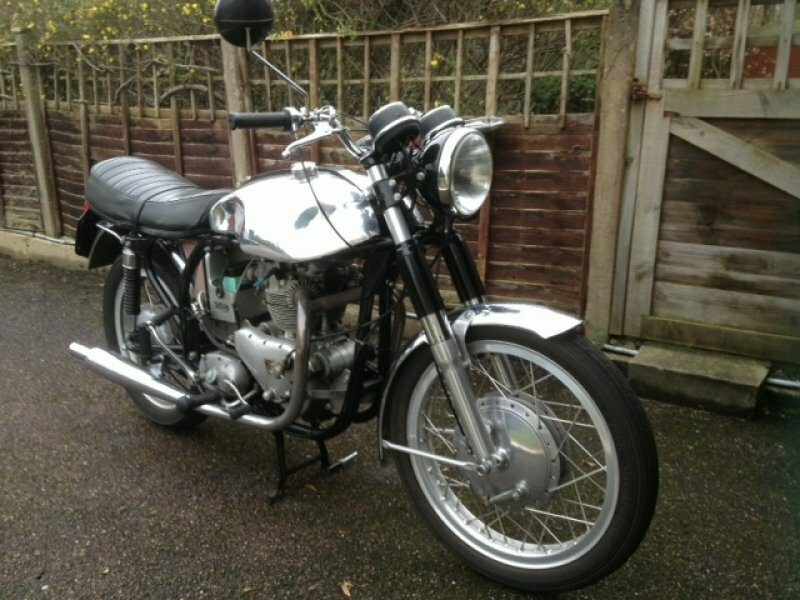 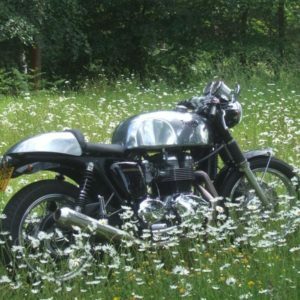 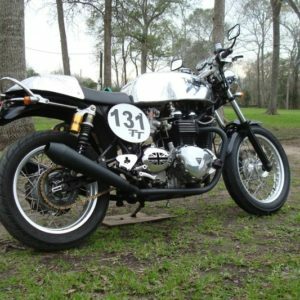 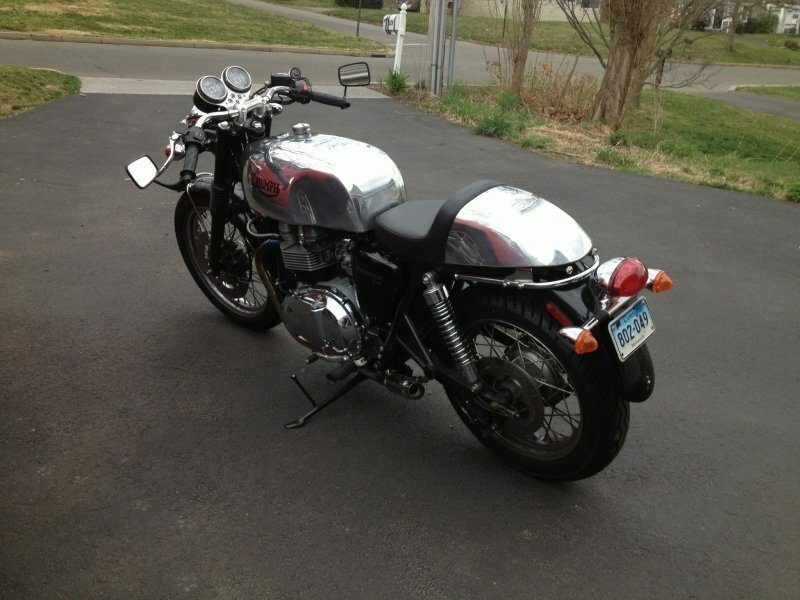 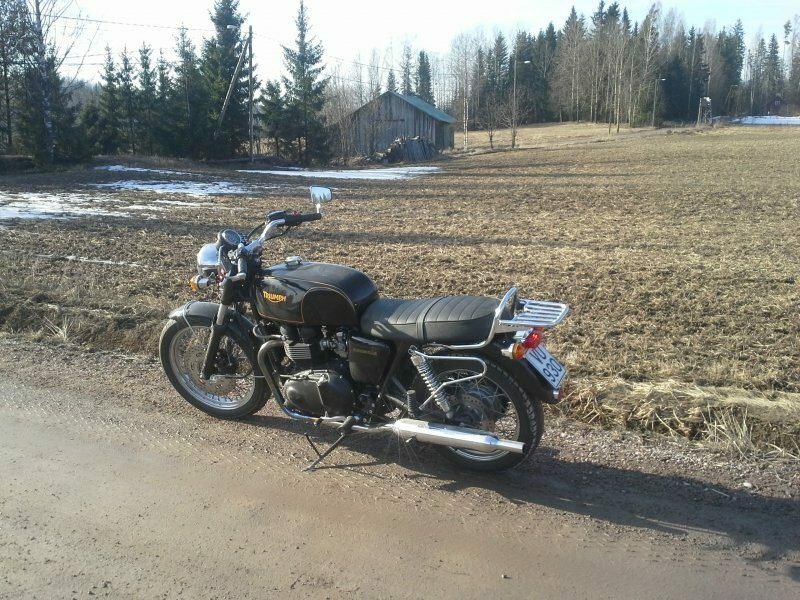 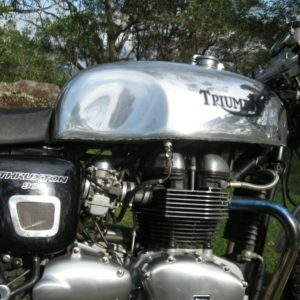 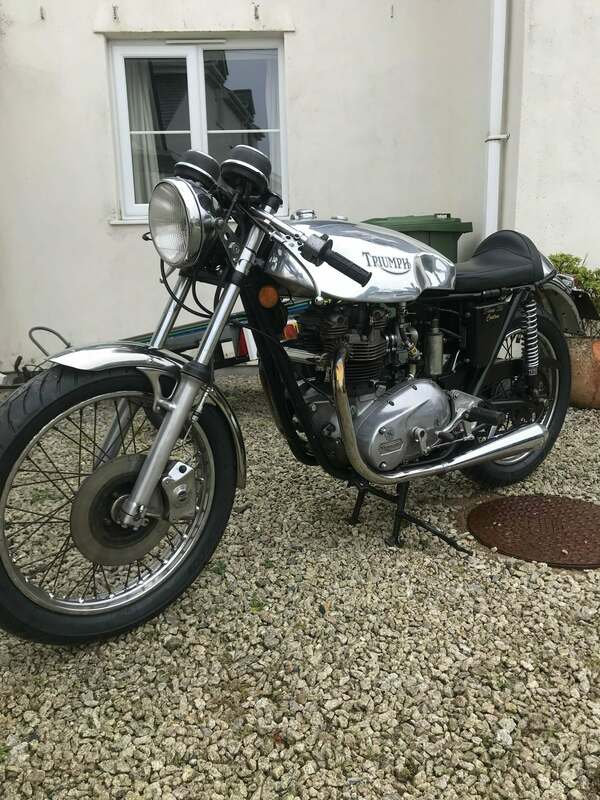 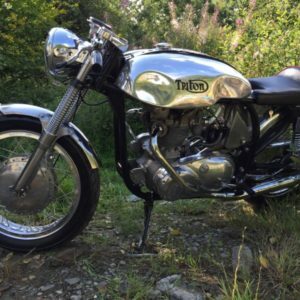 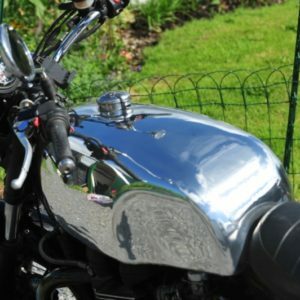 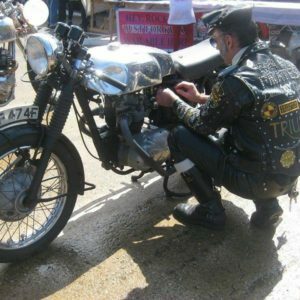 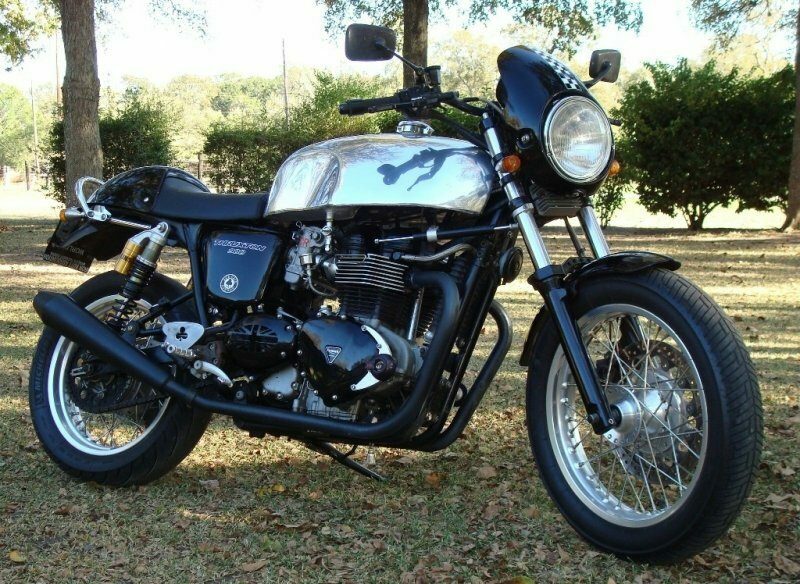 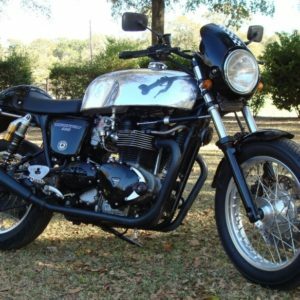 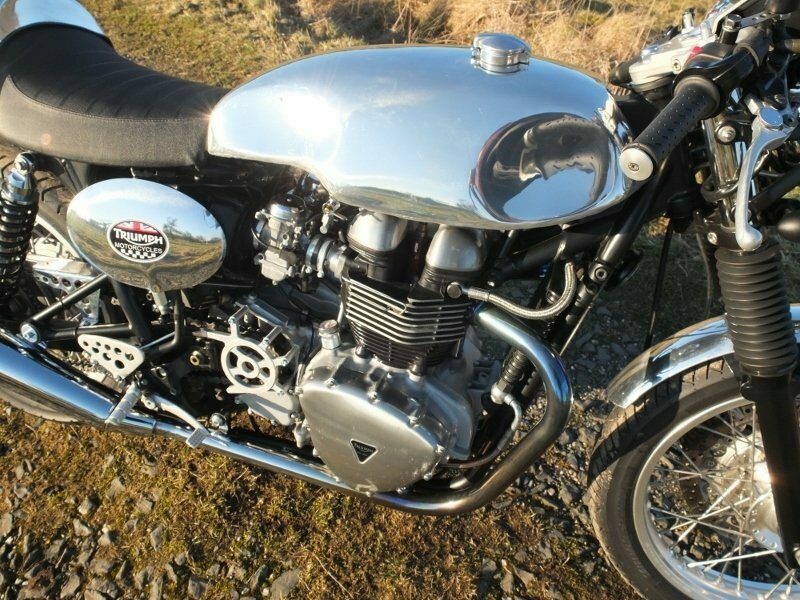 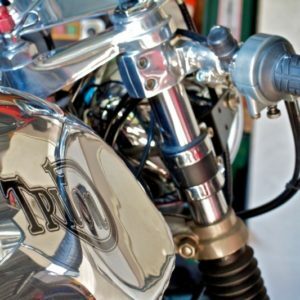 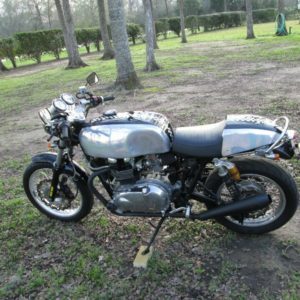 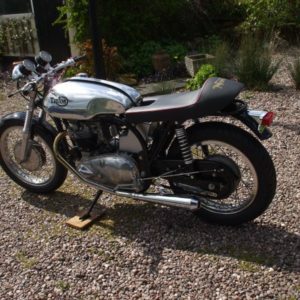 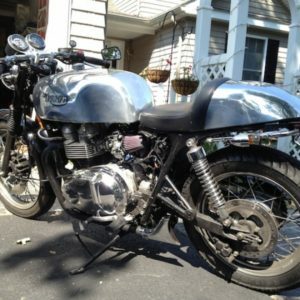 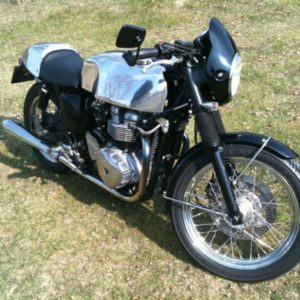 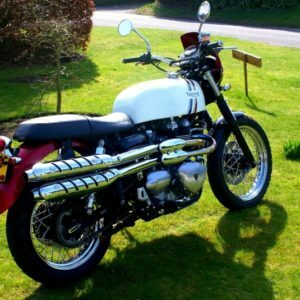 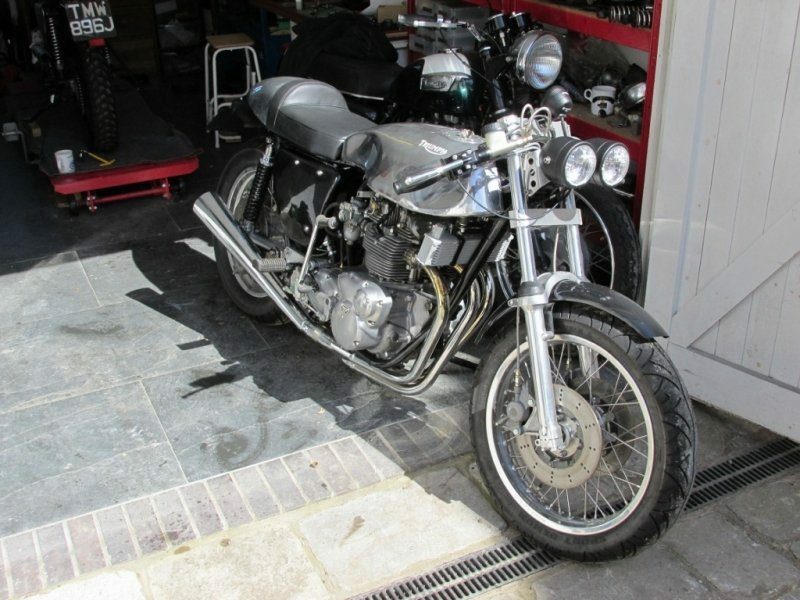 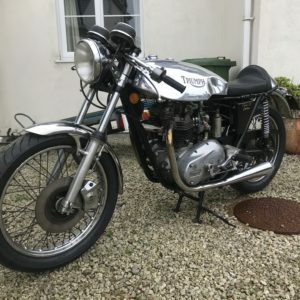 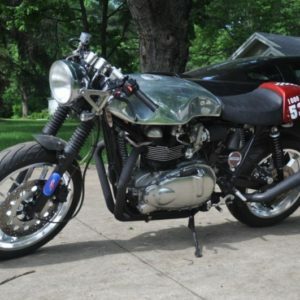 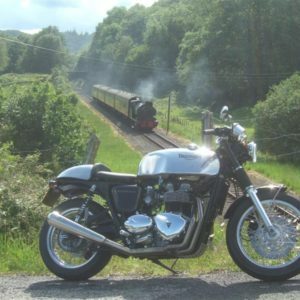 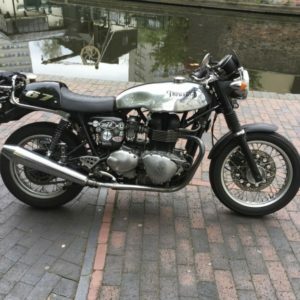 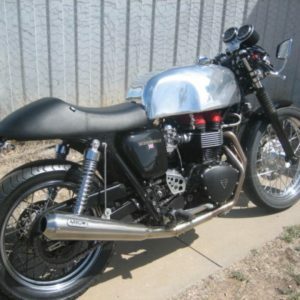 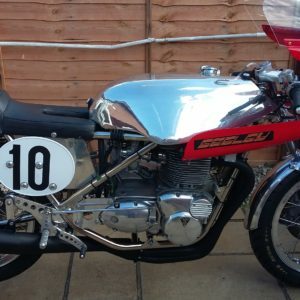 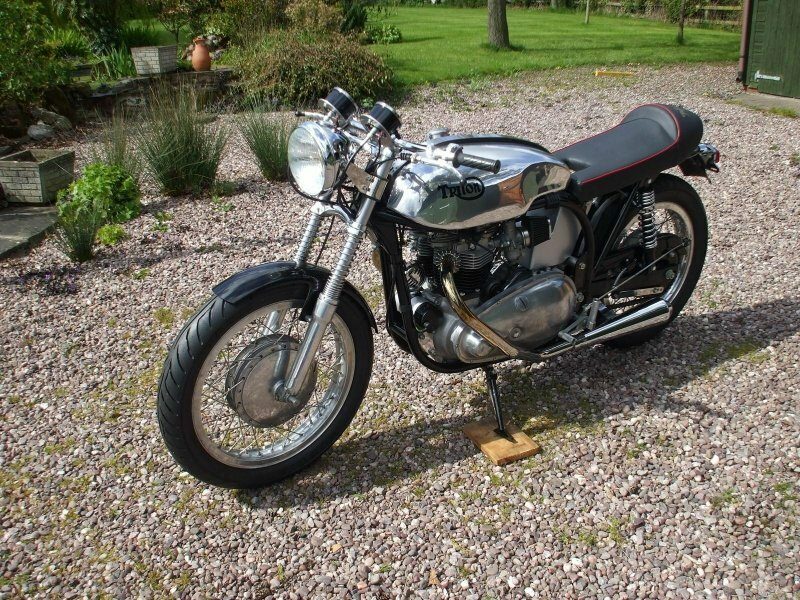 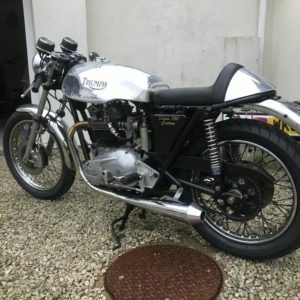 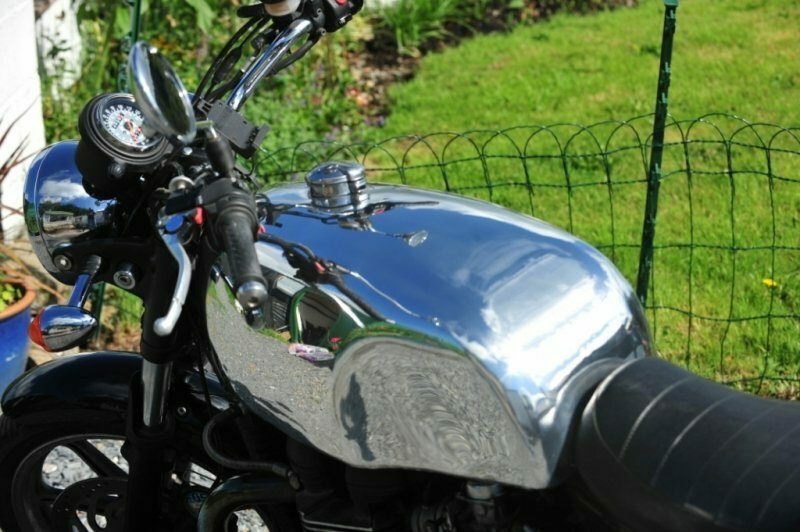 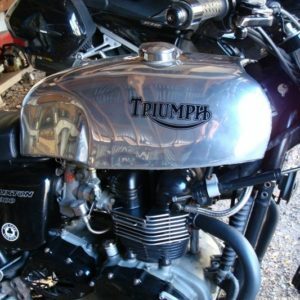 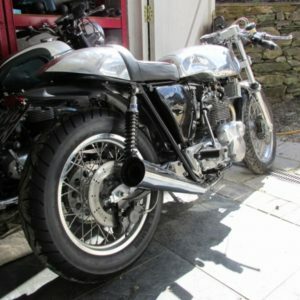 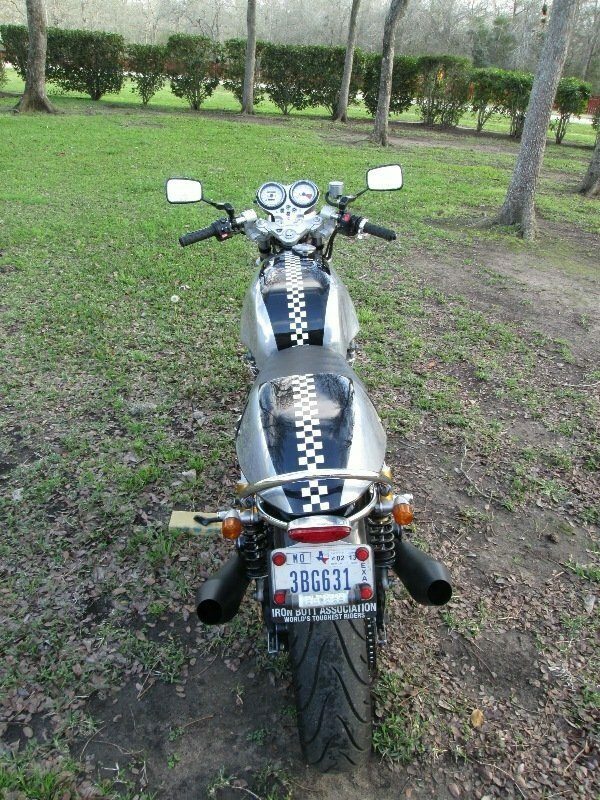 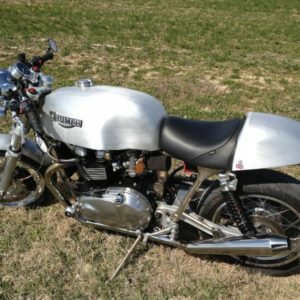 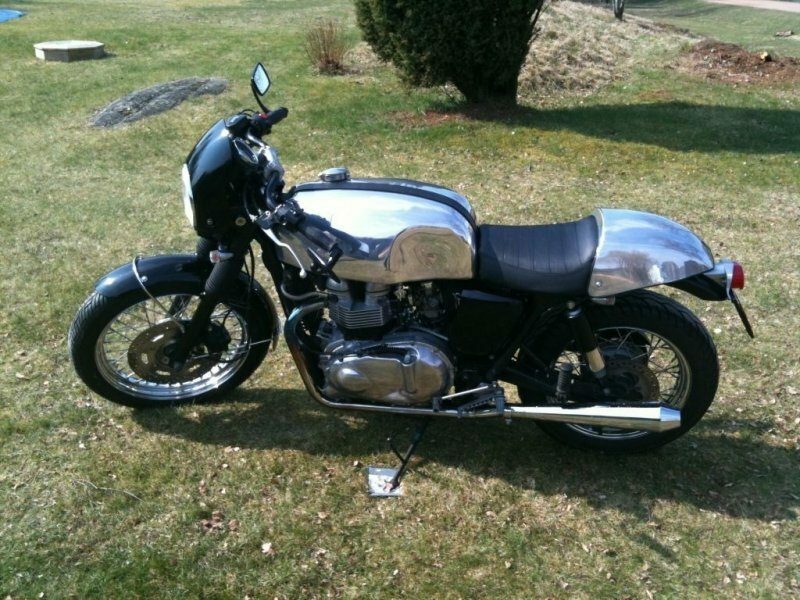 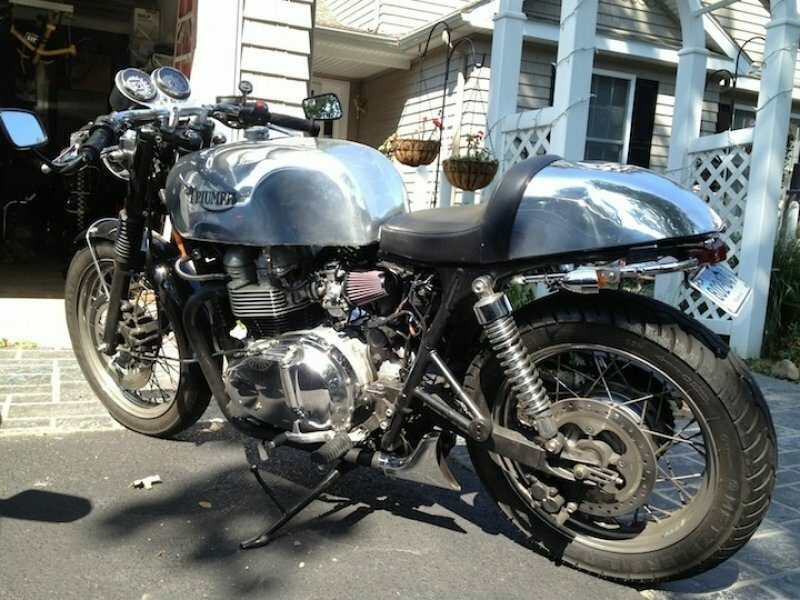 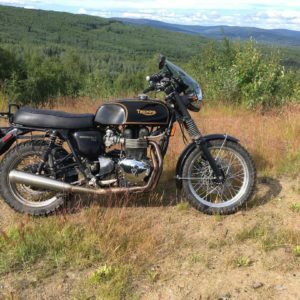 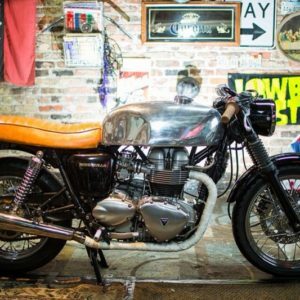 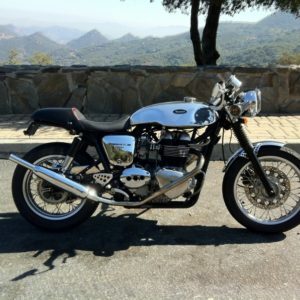 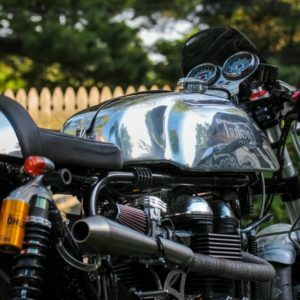 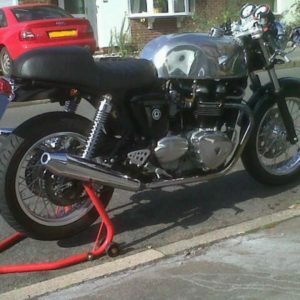 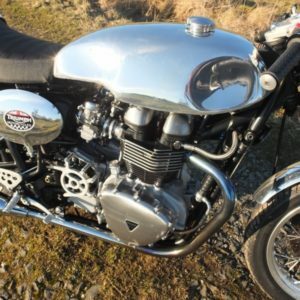 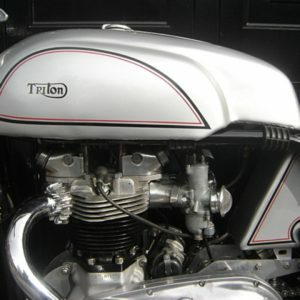 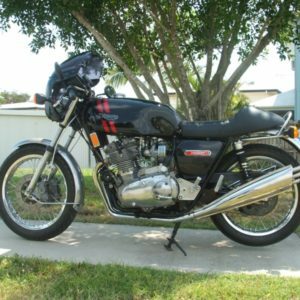 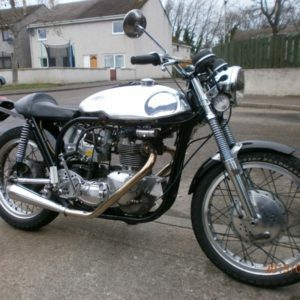 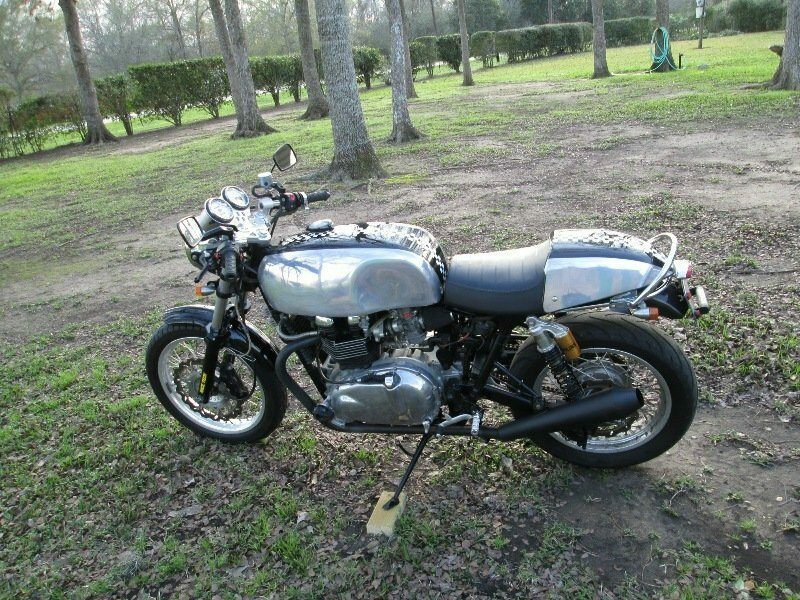 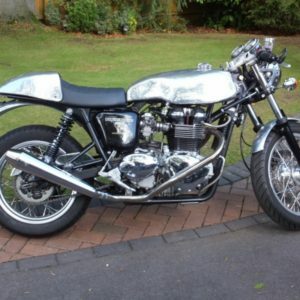 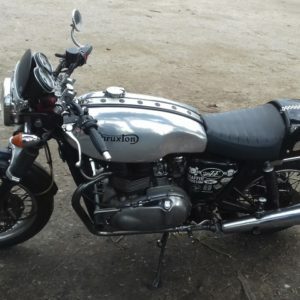 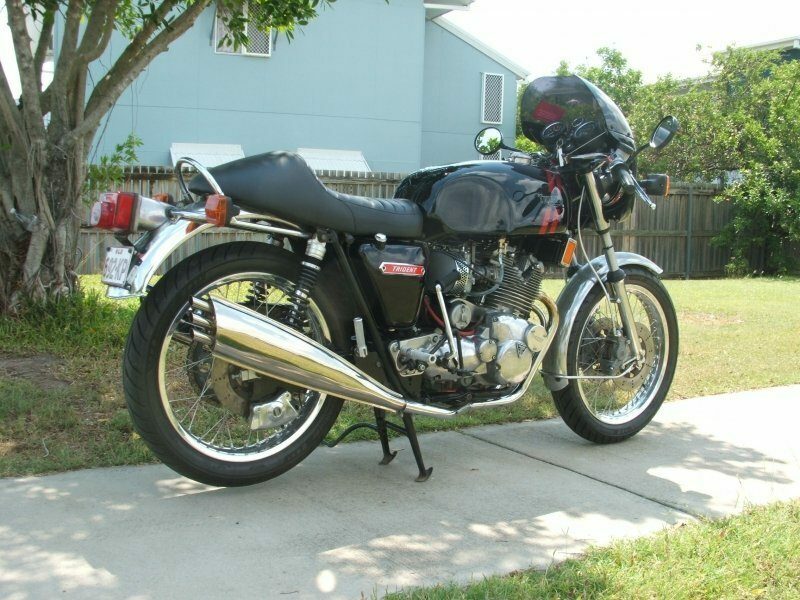 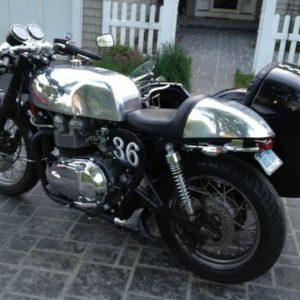 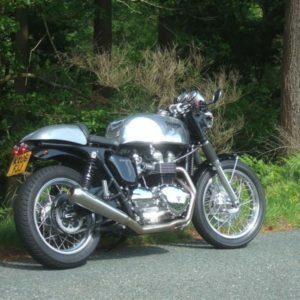 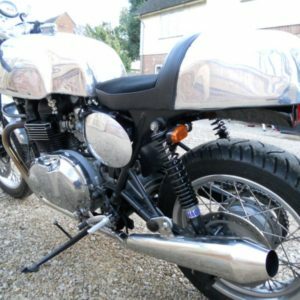 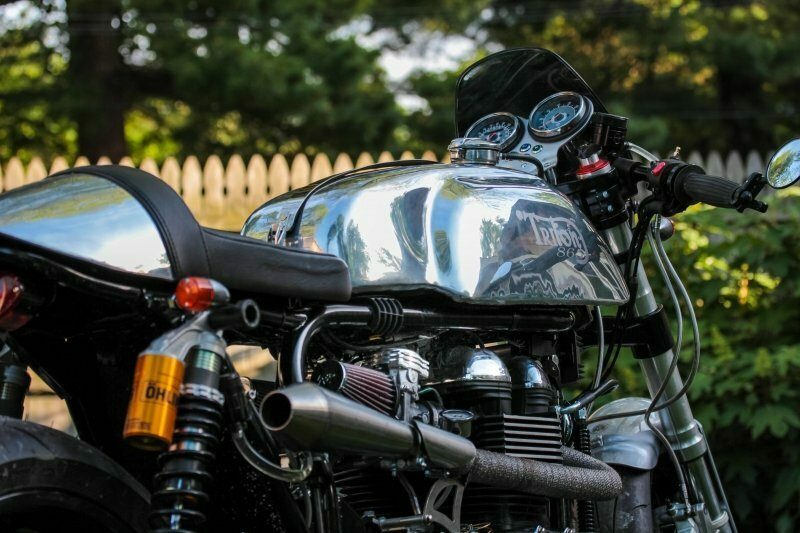 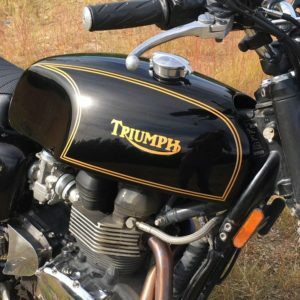 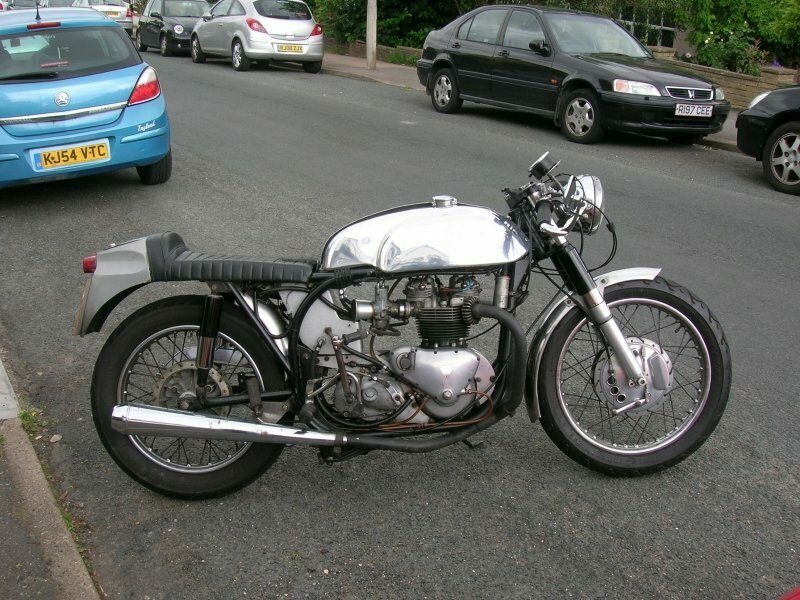 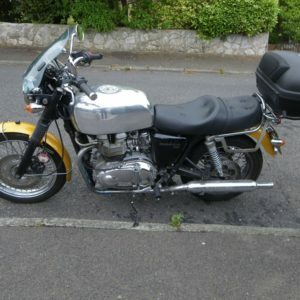 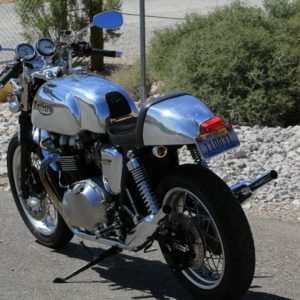 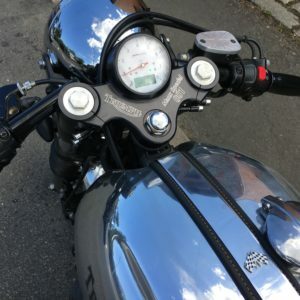 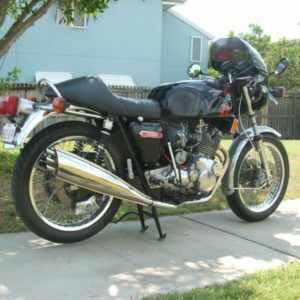 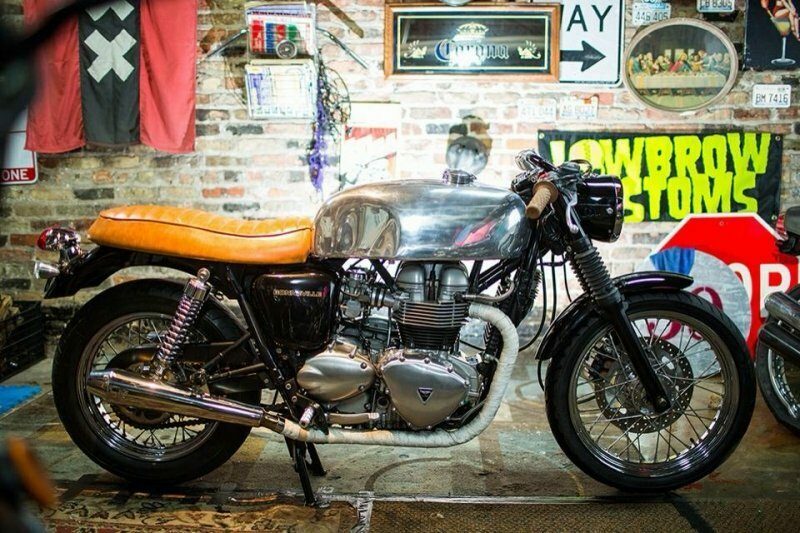 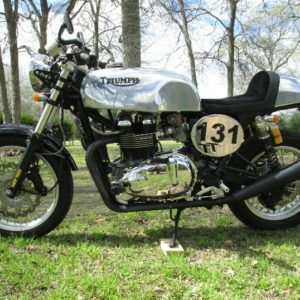 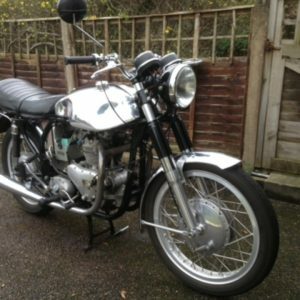 5 gallon Manx tank on an EFI Triumph Bonneville – very retro!